The Panel of the Great Black Cow, in the Nave at Lascaux. 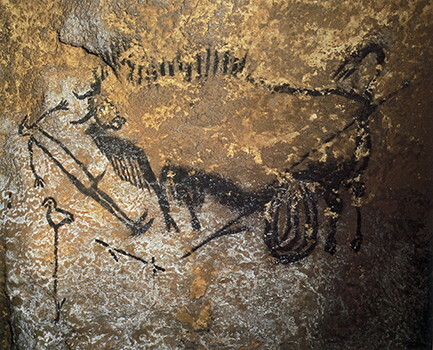 Lascaux Cave is famous for its Paleolithic cave paintings. The original caves are located near the village of Montignac. The paintings are estimated to be 17 300 years old. They primarily consist of images of large animals, most of which are known from fossil evidence to have lived in the area at the time. The cave was discovered on September 12, 1940 by four teenagers, Marcel Ravidat, Jacques Marsal, Georges Agnel, and Simon Coencas, as well as Marcel's dog, Robot. 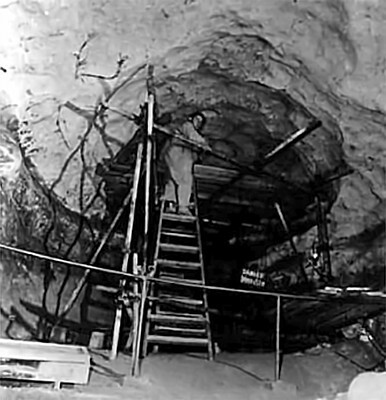 The cave complex was opened to the public in 1948. By 1955, the carbon dioxide produced by 1 200 visitors per day had visibly damaged the paintings. The cave was closed to the public in 1963 in order to preserve the art. 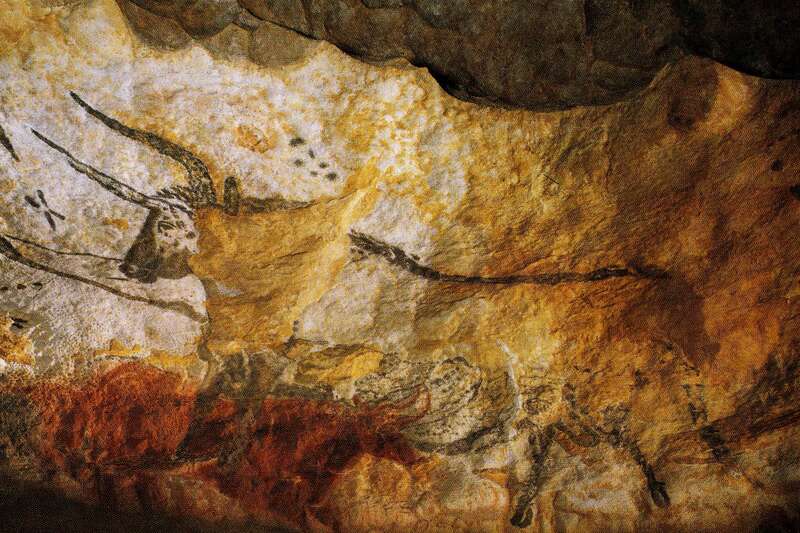 After the cave was closed, the paintings were restored to their original state, and were monitored on a daily basis. 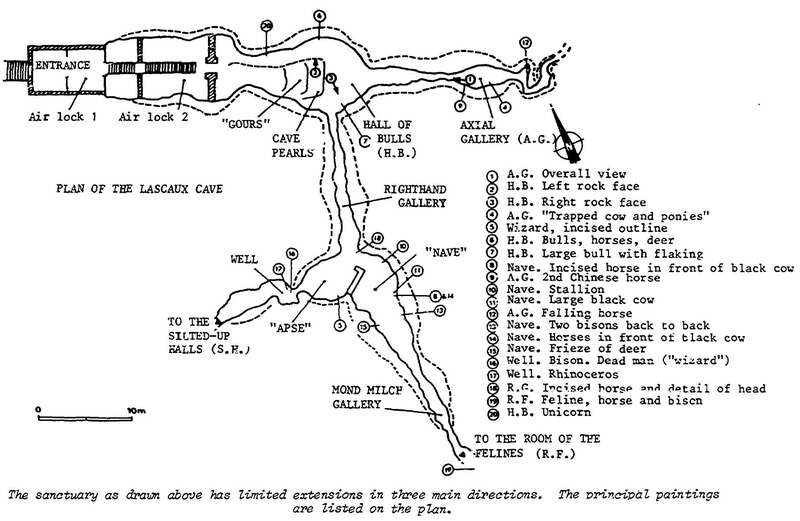 Rooms in the cave include The Hall of the Bulls, the Passageway, the Shaft, the Nave, the Apse, and the Chamber of Felines. 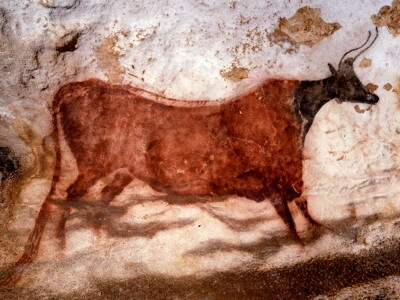 Lascaux II, a replica of two of the cave halls — the Great Hall of the Bulls and the Painted Gallery — was opened in 1983, 200 metres from the original. Text above adapted from Wikipedia. 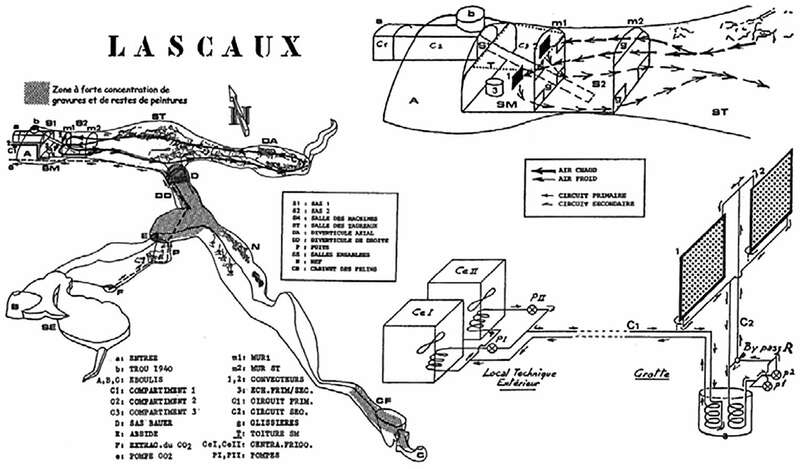 Map of Lascaux cave. This is a superb illustration from Norbert Aujoulat, (1946 - 13th April 2011), the giant of Lascaux Cave, who spent a huge amount of time analysing and researching Lascaux cave and its art. 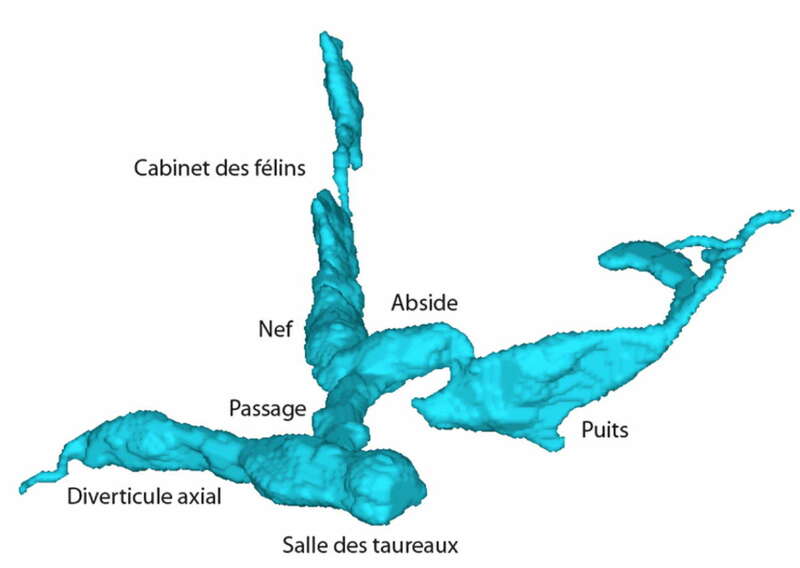 Schematic map of the Salle des Taureaux (Hall of Bulls) and Diverticule Axial showing locations on the walls of purposefully shaped holes juxtaposed near naturally occurring crevices and ledges used for scaffolding and ladders. The remains of oak wood used for scaffolding have been found at Lascaux. 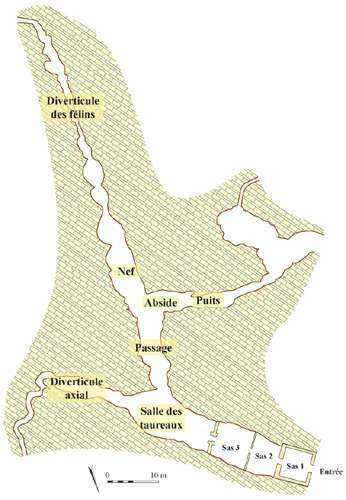 Map of sites in the Vézère Valley of France, including Lascaux at the top right of the map. If you click on the map you will see a larger map with the ability to click on the marked sites and get further information. 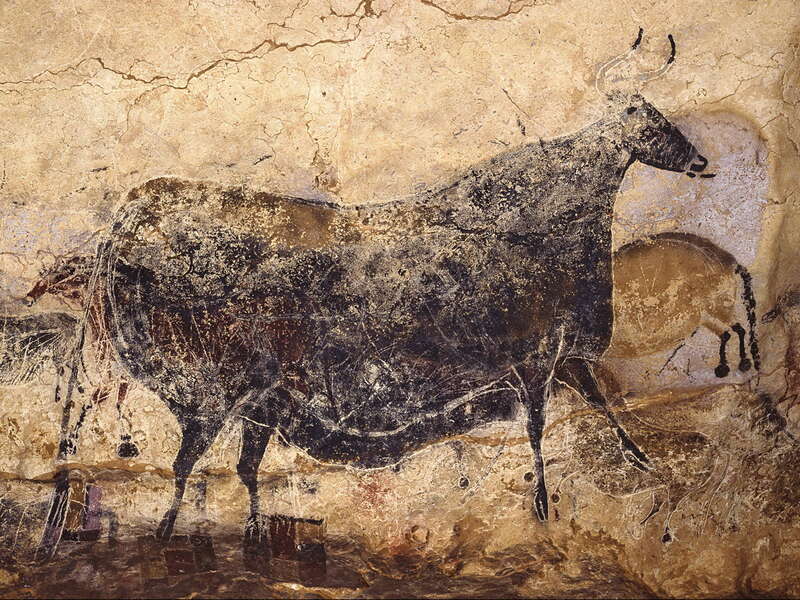 Hall of the Bulls, Lascaux. One of the great achievements of mankind. 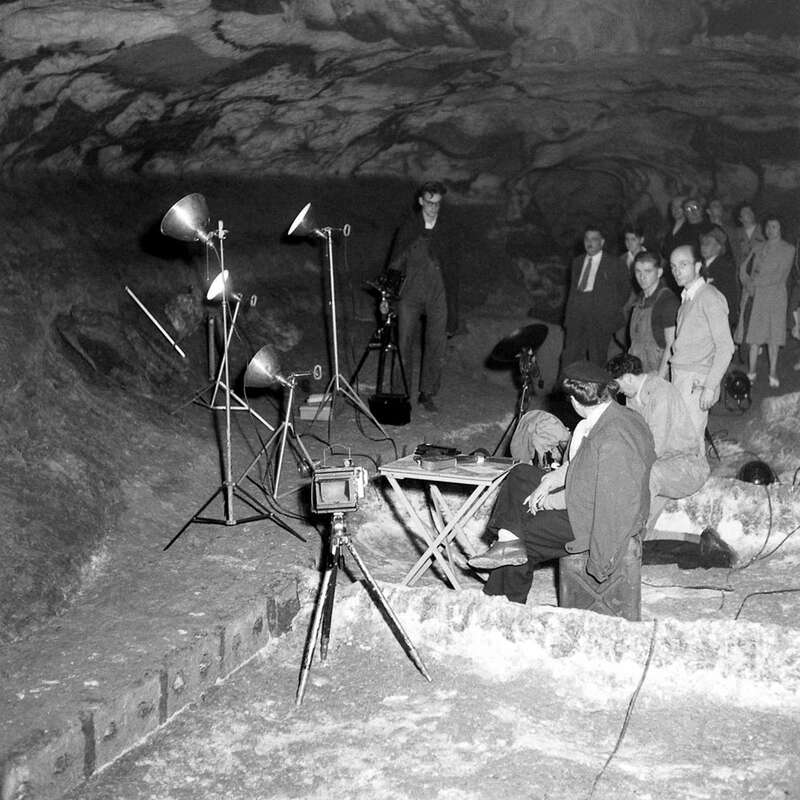 Lascaux entrance in 1947, when Time Magazine visited Lascaux and took the first good photographs of the cave. 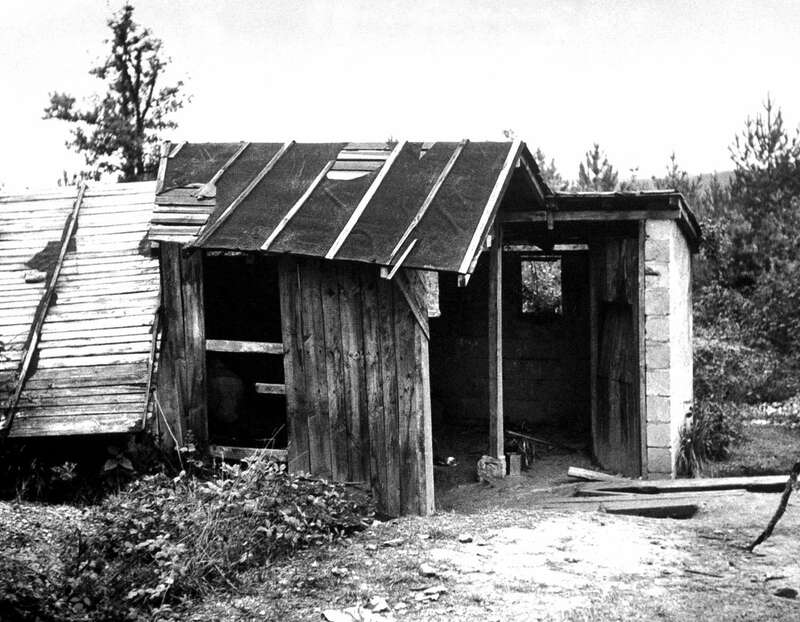 Morse's photograph of the ramshackle shed that covered the entrance to the cave in 1947 attests to the site's remoteness; the lack of any general interest the cave might otherwise have incited had it not been for the utterly chaotic and uncertain war years; and the rough, dirty job he and his crew faced even before they started shooting underground. 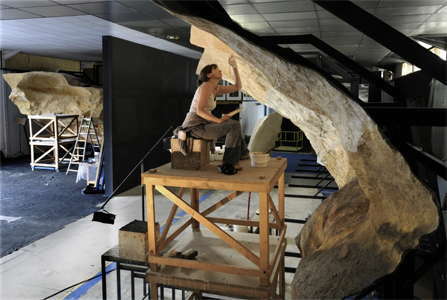 In 2003, the General Council of the Dordogne contracted Renaud Sanson and his studio to create facsimiles of scenes set in the nave of Lascaux, a gallery not represented in Lascaux II. 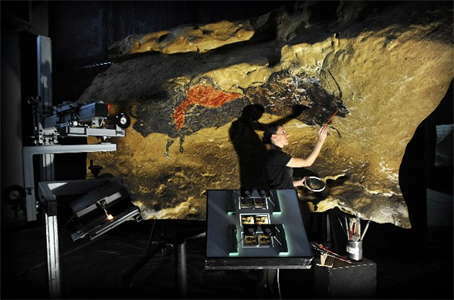 On July 4, 2008, in the workshops at Montignac which saw their creation, the exhibition Lascaux Révélé introduced this facsimile of the Dordogne to the public until December 2008. This exhibition is intended to travel the world for several years as Ambassador of the Dordogne Valley. Indeed, the casts of the facsimiles are of low weight (less than 10 kg / m 2), and consist of removable panels whose joins are invisible and have been designed to be easily transported. The exhibition Lascaux Révélé was then transferred to the Thot animal park, located in the nearby town of Thonac and presented to the public in July 2009. Photo: © National Geographic Magazine. Close up in 3D of the Hall of the Bulls. 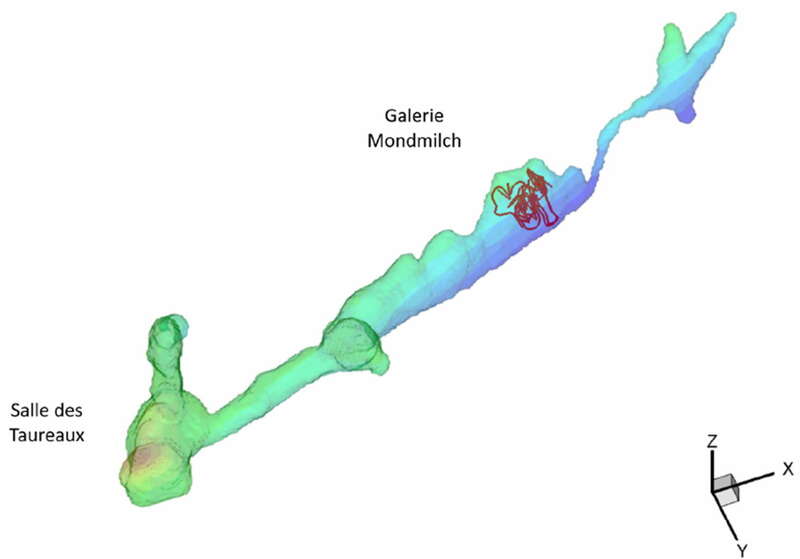 The red line is the trajectory of a virtual particle released at the bottom of the Mondmilch gallery in December 1999. This method was used to research the movement of air in Lascaux. The Hall of the Bulls and Diverticule Axial. The Hall of the Bulls. Horses and the head of a bull, in the Hall of the Bulls, reproduction in Lascaux II. Permission: Creative Commons Attribution 2.0 Generic license. 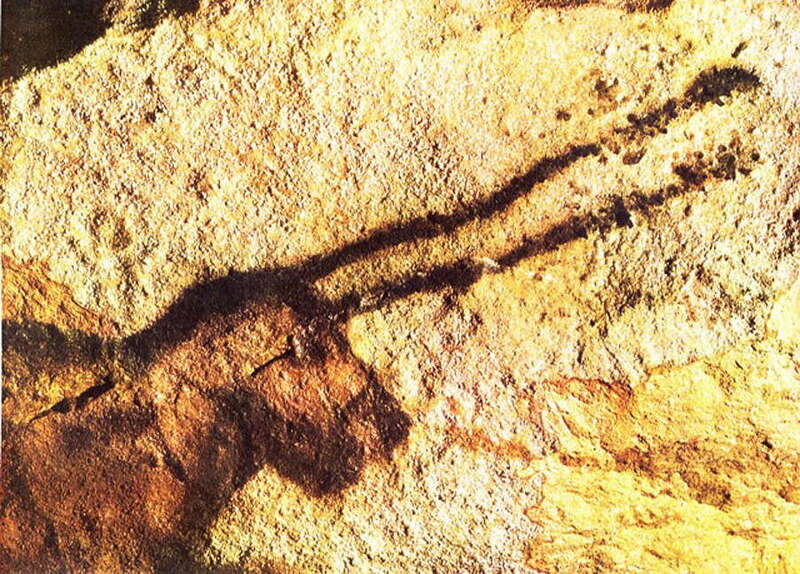 This is known as the unicorn, in the Hall of the Bulls. Close up of the head of the unicorn. 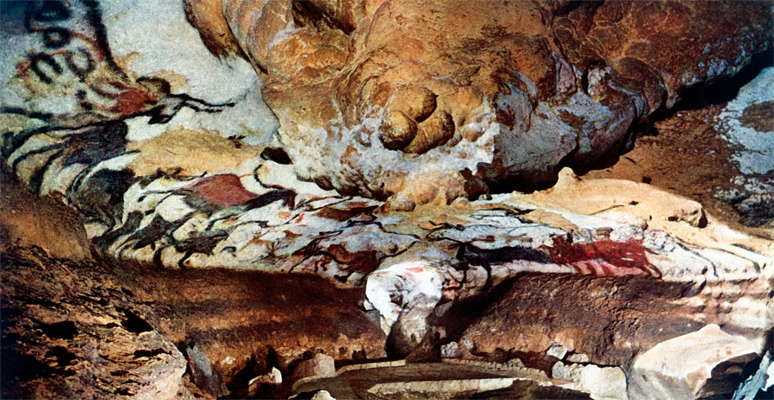 Horses and the head of a bull, in the Hall of the Bulls, from 1947, when Time Magazine visited Lascaux and took the first good photographs of the cave. Head of the bull Aurochs above, Hall of Bulls. Note that this image has been taken from a vantage point which removes the elongation obvious in the photo above, thus removing the distortion. Many of the images were painted in order to be seen from a particular position in the cave. 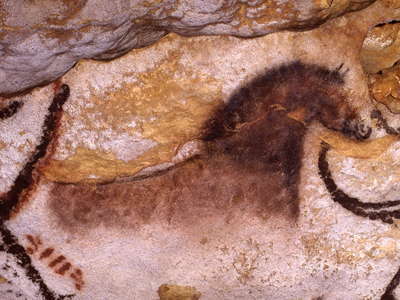 Close up of the horse with a well defined tail, Hall of the bulls. Brown Horse, Hall of the Bulls. 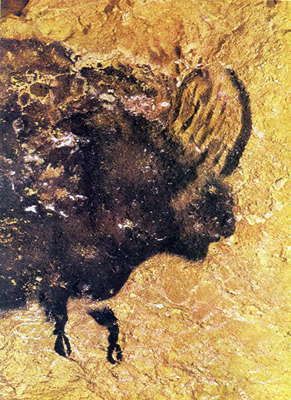 Fifth Bull in the Hall of the Bulls. A red cow has been painted over the front legs of the Aurochs. Head of the bull in the image above, Hall of Bulls. Note that the position from which the photo was taken has removed the distortion obvious in the image above. Lascaux deer in the Hall of the Bulls from 1947, when Time Magazine visited Lascaux and took the first good photographs of the cave. The right wall of the Axial Gallery. Close up of the extreme left of the frieze of the small horses and ibex on the right wall of the Axial Gallery. Another version of the ibex above. The Great Black Bull is 371 cm long and 193 cm tall, and is the largest work in the Axial Gallery. Superimposed paintings on the Great Black Bull. The second Chinese horse in the Axial Gallery, also known as the Painted Gallery. Note also the sign above the horse. Horse on the left wall of the Axial Gallery. Detail of the horse above on the left wall of the Axial Gallery. Note the way the artist has given three dimensionality to the painting by having the left front leg 'detached' from the body. Lascaux horse from 1947, when Time Magazine visited Lascaux and took the first good photographs of the cave. Red Cow with a Black Head in the Axial Gallery. Also known as the Red Cow with the Black Collar. Another version of the Red Cow with a Black Head in the Axial Gallery, from a different perspective. Megaloceros in the Axial Gallery. This is also known as the black stag. Another version of the Megaloceros in the Axial Gallery. This falling horse is not a case of whimsicality on the part of the artist. 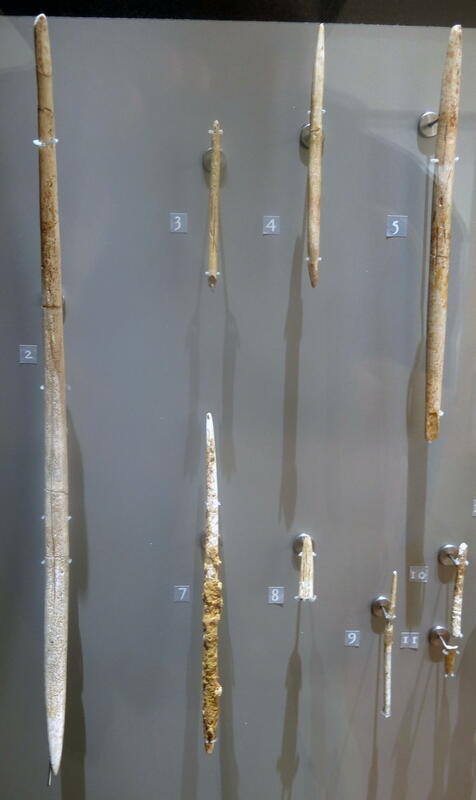 Art (and carving on their bone and antler tools) was part of hunting magic. 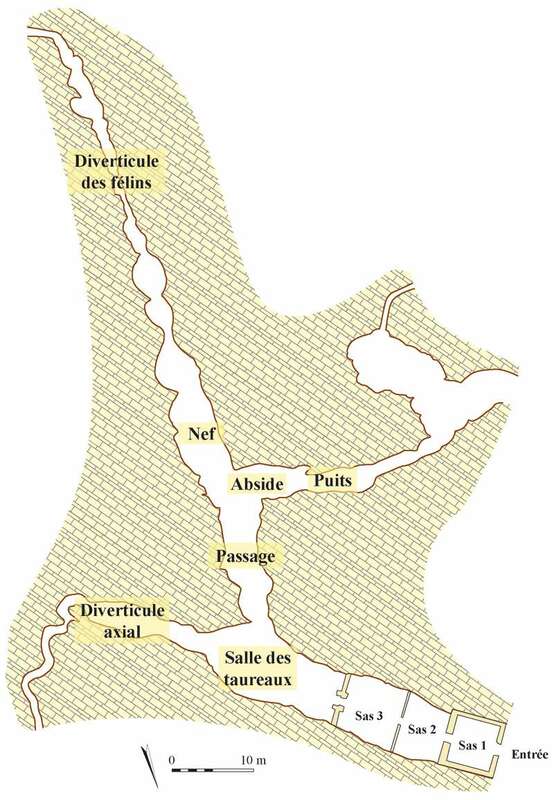 In this case, there was a steep slope not far from Lascaux, and plenty of vertical cliffs further downstream. These were used on occasion to drive horses and cattle over the edge of the cliff to their deaths on the banks of the Vézère far below. It was an easy way to get a large amount of meat and hides quickly, though good cooperation and strategy was needed, and all hands on deck were required to complete the resultant huge amount of work required in dispatching injured animals, skinning, dressing, and preserving the hides and meat and fat. This is known as the falling cow, and is not far from the falling horse, towards the end of the Axial Gallery, on the right hand side. It has been captured in the act of jumping off a cliff. Once again we can see the mastery of perspective, with the rump rendered smaller than normal in proportion to the head, since it is further from the viewer, and the right front leg has been given forced perspective by the elimination of colour at the point where it emerges from behind the body of the cow. Falling horse at the end of the Axial Gallery. 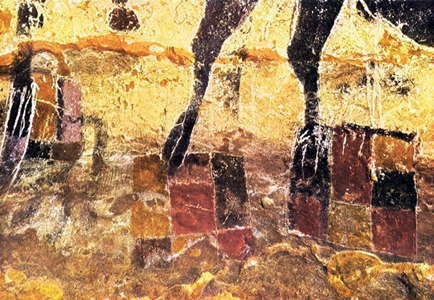 Towards the end of the axial gallery, with the falling cow on the right, horses and an ibex and rectangular meshes, and the falling horse right at the end. The Passageway, or the Passage, connects the Hall of the Bulls to the Nave and the Apse. It has a high density of images which are often difficult to interpret. There are several hundred engraved figures, and some painted ones, 385 in all. 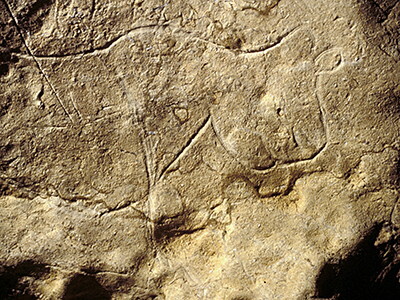 The images which could be identified included horses, bison, ibex, aurochs, deer, and various signs including a hook, a cross, and a quadrangular sign. Bearded Horse, from the Passageway. This is almost a cartoon of a horse, with exaggerated features such as the jawbone. Engraved and painted. In a limited space of about thirty square metres of area, with the walls about 3.5 metres high, the Apse contains more than one thousand figures. 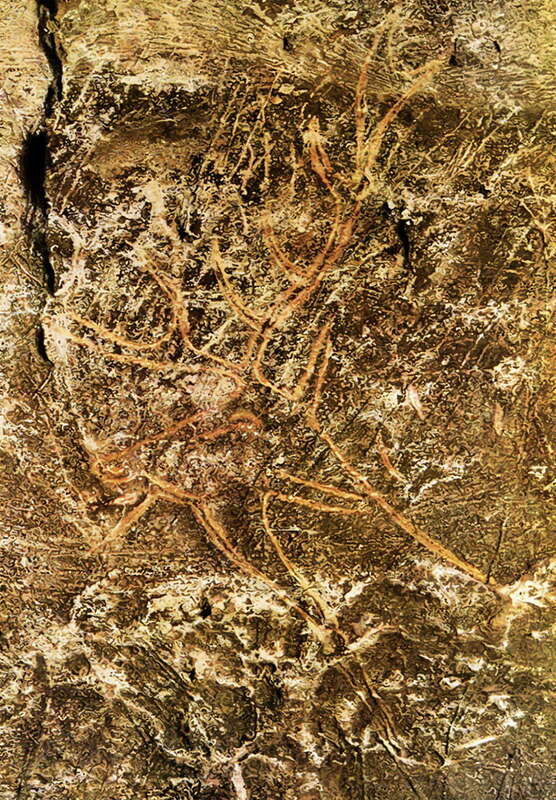 Of these, there are 500 animals and 600 geometric signs or other marks. The figures are arranged in a seamless fashion from the walls to the ceiling. Their density increases from the entrance to the far end, and reaches its maximum where the Apse meets the Shaft, in the most remote part of the chamber. The limestone of the walls and ceiling is very soft, which may partly explain the numbers of figures. 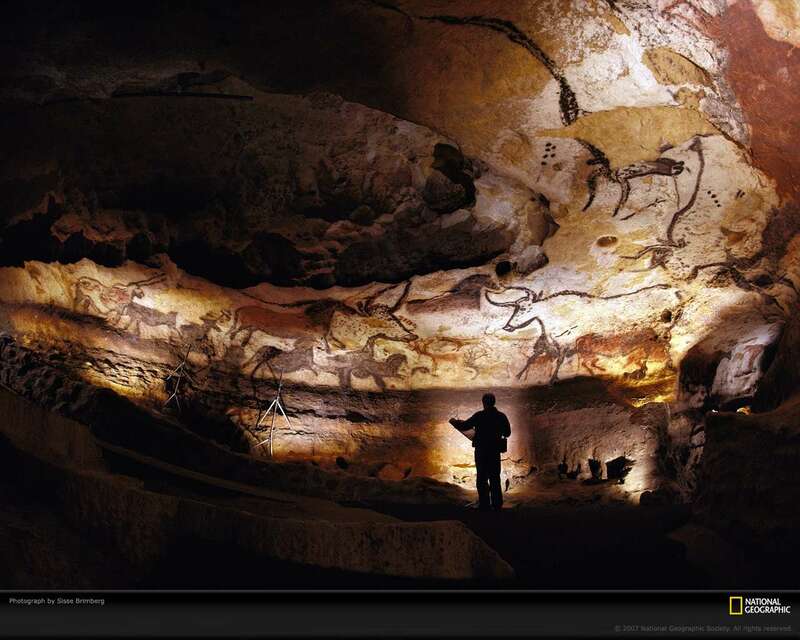 Lascaux is best known for the paintings in the Hall of the Bulls, the Axial Gallery and the Nave. 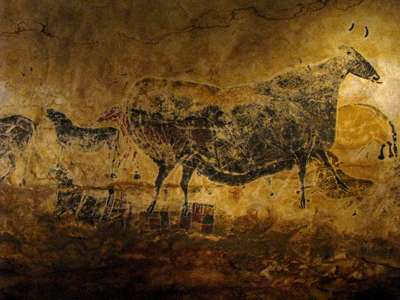 However, because of the very high number of engraved figures in the Apse, the Passage, the Nave, and the Chamber of Felines, the art of Lascaux is clearly dominated by engravings. Abbé Glory in the Apse. 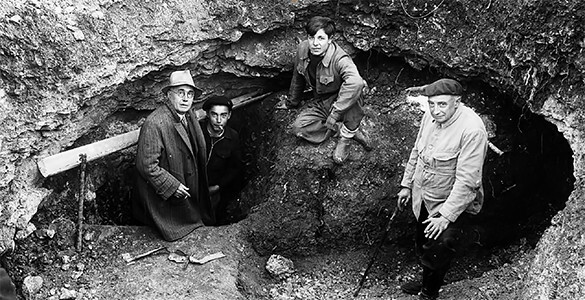 Abbé Glory worked in Lascaux's engraved areas - the Passageway, the Apse, the Nave, and Chamber of Felines - from 1953 to 1962, identifying some 1433 figures. Standing, or lying on his back on scaffolding, Glory used over 140 square metres of tracing paper, recording the chaos under it, which then had to be deciphered and identified. 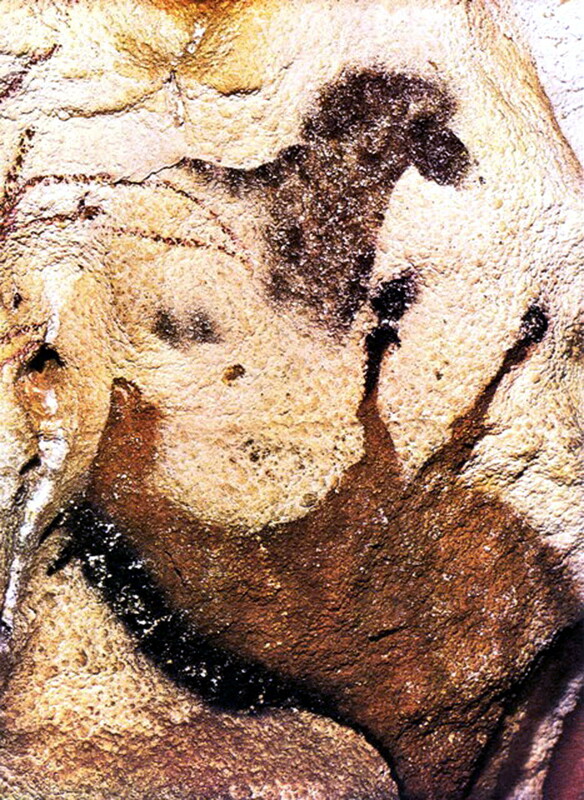 Lascaux inconnu, Leroi-Gourhan et Allain (1979). It appears that the apse was originally painted with large animals and that to reach the ceiling (anciently formed by a whirlpool of water) scaffolding had to be used. 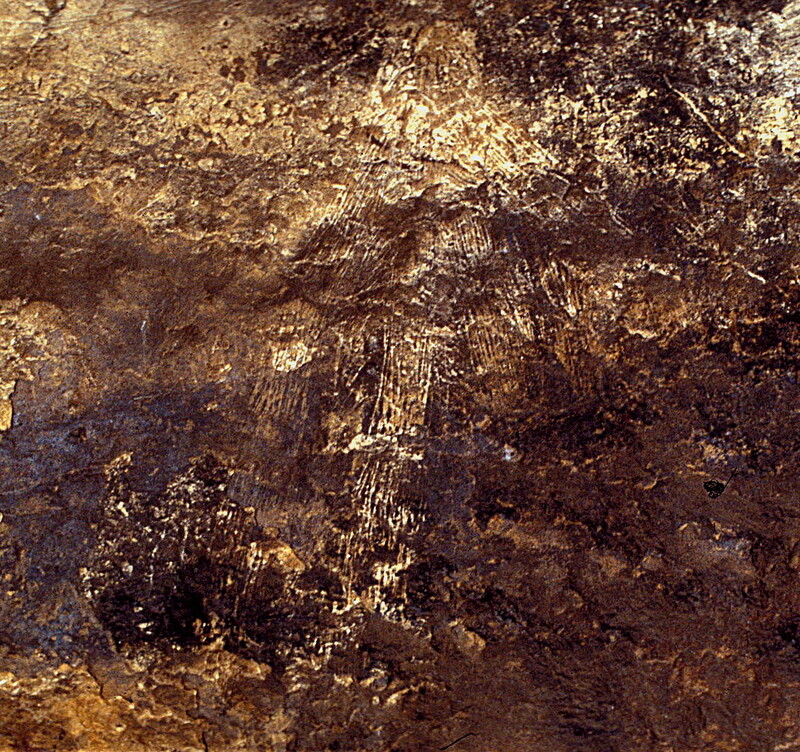 When the Magdalenians were in Lascaux, this ceiling was nine feet above the floor. 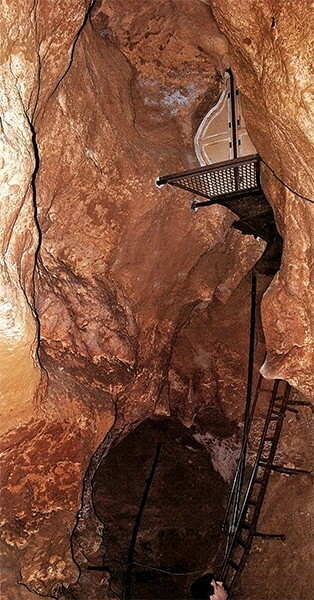 Since the cave's discovery in 1940, this floor had been lowered four feet. The south, west and north walls of the Apse are circular. To the east it opens into the end of the Passageway and the beginning of the Nave. 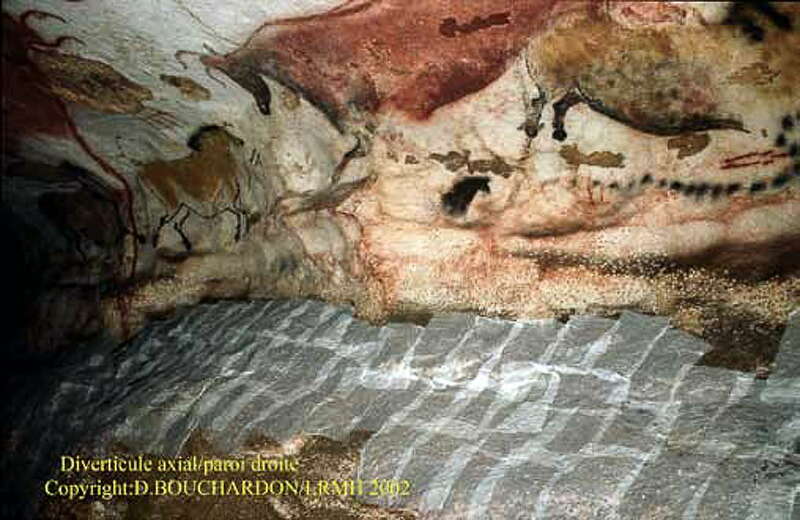 Right above the original floor line are the remains of several large black aurochs, one after the other. Their heads turn towards the enlarged opening in the west wall leading to the Shaft. 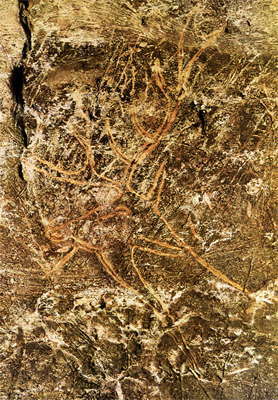 Above the aurochs are traces of painted stags, including a composition of five on the south wall. On the ceiling, seeming to make use of the bulging, circular limestone formation, are two large horses, one red, the other yellow. Engraved Deer in the Apse. It would appear that either the engraved line has been coloured on the wall itself, or more likely, that the picture has been coloured later to bring out the shape of the engraving. This is a superb piece of art. This is known as the Large Sorcerer, or the Wizard. At the lower, southern edge of the Apse where it turns into the Nave, scratched across a deteriorated painting of a large, black cow is a one metre high hut form, with teepee-like descending bands of finely scratched lines. They converge near the top of a loose bundle, through which one can discern a bird's head and eye, along with several other disconnected eyes, two of which appear to be aligned with a dotted line crossing a forehead. The vertical bands continue to converge and narrow above the dotted line, making a witch-like hat. The all-over effect is that of a human figure inside a dried grass costume, accompanied by a bird. 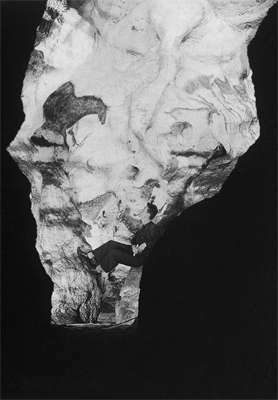 Called the 'Big Sorcerer', or the 'Wizard' this figure was identified in 1949 by Maxine Vaultier who visited Lascaux with the abbé Breuil and F. Windels. In Breuil's Four Hundred Centuries of Cave Art, a photograph of the 'big sorcerer' is juxtaposed with a photo of a French Guinea sorcerer clad from head to foot in a plaited-fibre costume. There is a vague, eerie resemblance between the two figures. A difference in altitude of 6 metres separates the Apse from the bottom of the Shaft. 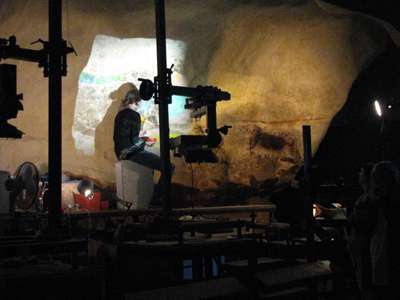 The Scene, hidden by a projection of the cave wall, unrolls on the wall facing the descent by ladder. 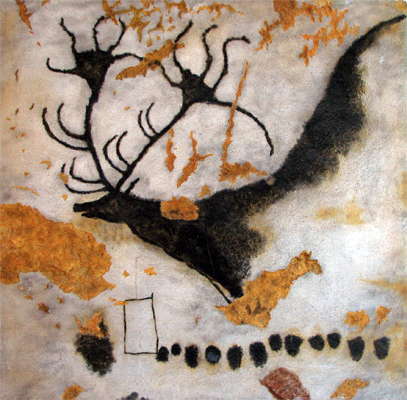 This is one of the most studied and argued about paintings in Lascaux. It is in what is known as the Well, or the Shaft, and is reached by climbing down a ladder from the Apse. The main scene includes a disembowelled bison, a man with a bird's head who appears to have been felled by the bison, a spear, and a bird on a pole. Was the man a shaman with a bird as totem? Did the painter believe that dead people became birds? We shall never know. The shaman and the bison from the shaft. Beside the panel of the man killed by the bison, is this apparently unrelated image of a wooly rhinoceros, which is a superbly realised portrait of a dangerous animal. The six black dots are of unknown significance. The two photographs stitched together show that either the same artist used different techniques for the two panels, or the panels are separated by time and creator. The rhinoceros is done in a more realistic style, with thicker outlines. In marked contrast to previous chambers - the Apse, the Passage or the Hall of the Bulls - the Shaft includes only a limited number of figures, eight in total. Four are animals (horse, bison, rhino and bird), while three are geometric signs. In the centre of this composition, a human figure attracts all the attention, although only in its relation to the animals around it. This is one of the few scenes which invites the spectator to construct a story to explain what the artist has depicted. 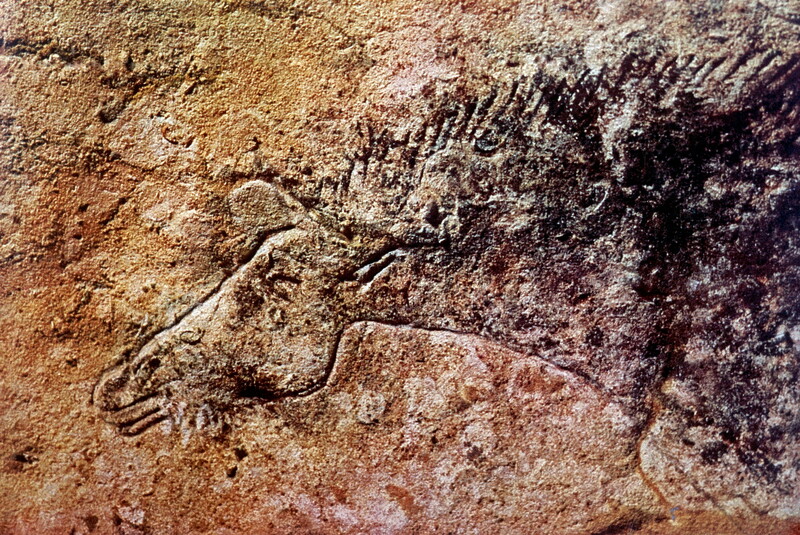 Another version of the rhino, from 1947, when Time Magazine visited Lascaux and took the first good photographs of the cave. Black horse in the Shaft. This is the only figure on this part of the wall. 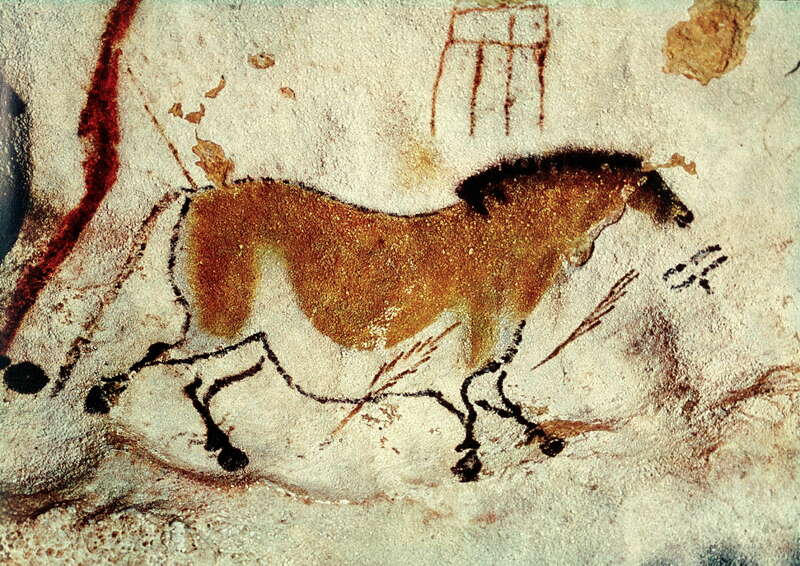 It is a mediocre work, when we compare it to the masterpieces of the main part of the Lascaux caves, since it is limited to the head of a horse, the neck, and the start of the back. 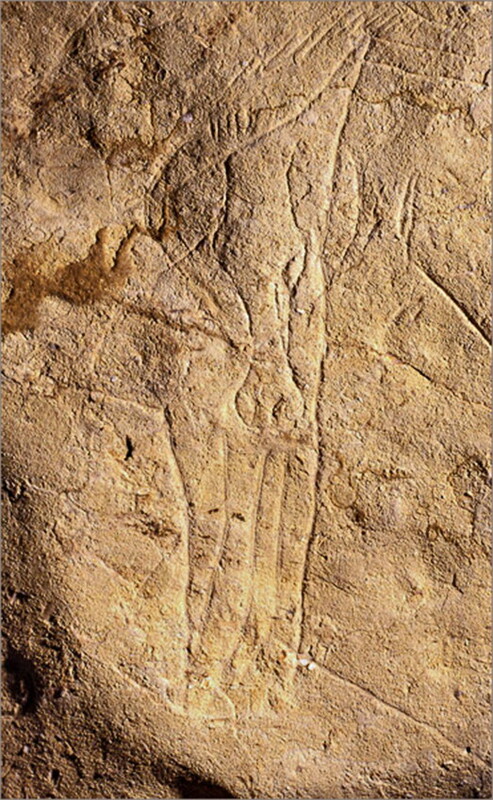 Note that the drawings in the Shaft were drawn using only the black pigment, manganese dioxide. While studying the Shaft Scene in 1957, Glory reported discovering some new engravings near and in the painting: a small bovine head above the bison's tail, and a large horse head with its muzzle crossing the bison's upper foreleg. 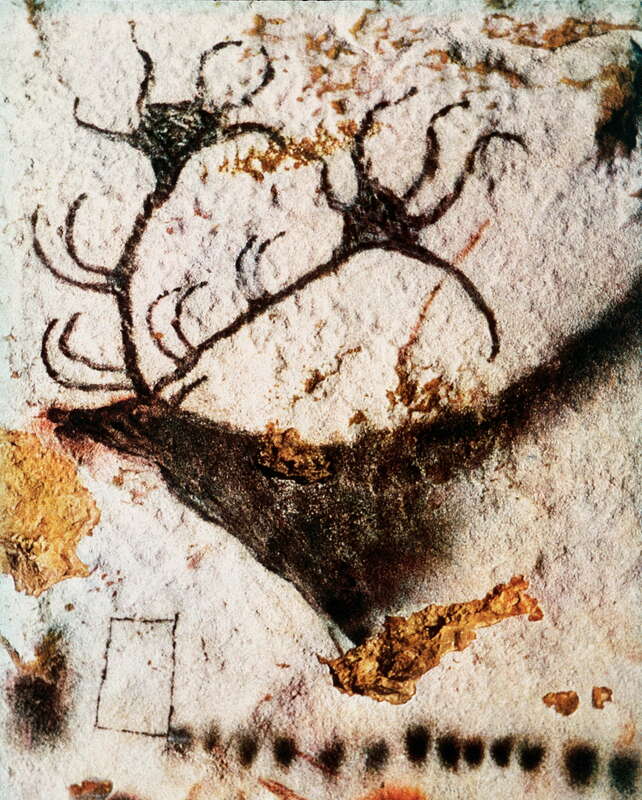 These are documented on pp 290-291 of Lascaux inconnue (Leroi-Gourhan et Allain, 1979). 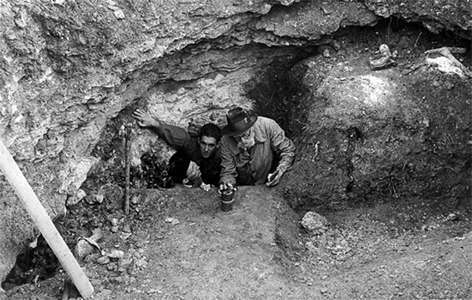 In 1975 A. Leroi-Gourhan and others re-examined the Shaft's wall to confirm or dispute these quite unusual findings. They were unable to find any evidence for the existence of such engravings. An oil lamp (a deer fat lamp), found in the sediments in the floor of the Shaft at Lascaux cave in Montignac, Dordogne, Aquitaine, France. Magdalenian culture, 17 000 BP. It can be viewed in the National Prehistory Museum in Les Eyzies-de-Tayac. 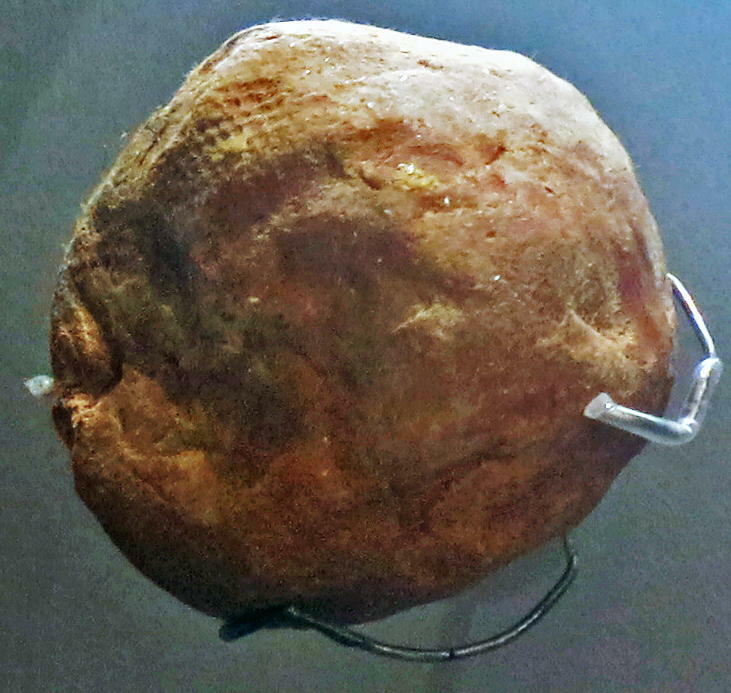 The red sandstone lamp was found by Abbé André Glory at Lascaux. 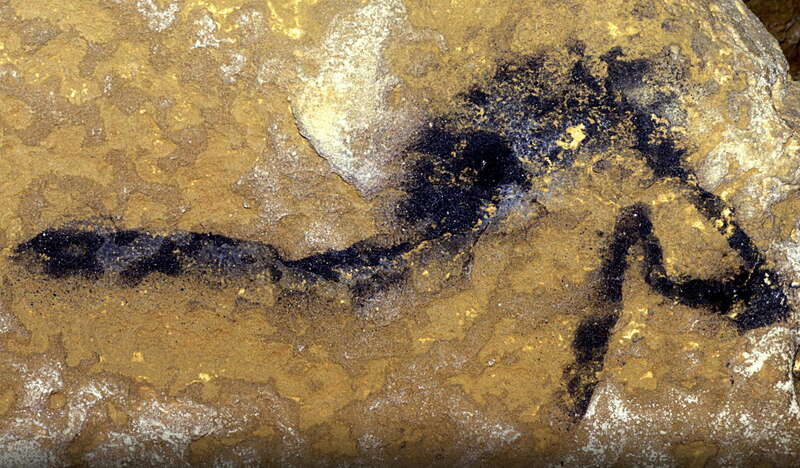 André Leroi-Gourhan, said in 1982 that Abbé Glory was the man who best knew Lascaux. The lamp is just as beautifully completed on the back as the front. 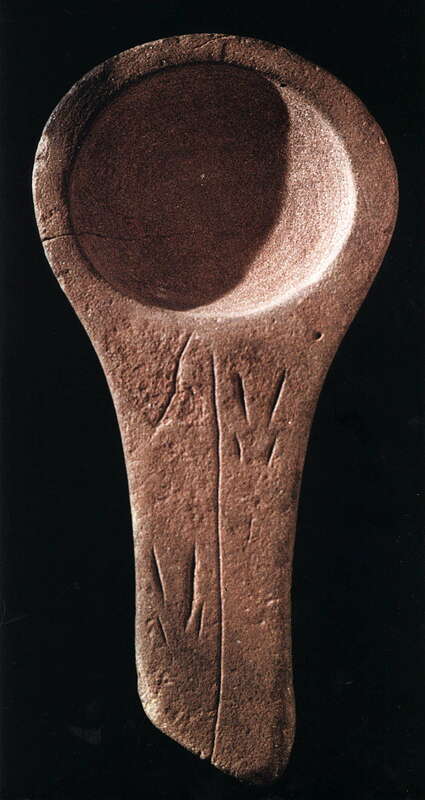 Note the layers of sandstone symmetrically circling the bowl of the lamp. Another version of the lamp of rose-coloured sandstone, found at the foot of the Shaft Scene during excavations by Andre Glory, 1959. It bears two signs on the upper face of the handle. Glory's most spectacular find in the Shaft was a lamp (bruloir ) in a ground layer below the tail of the rhinoceros. 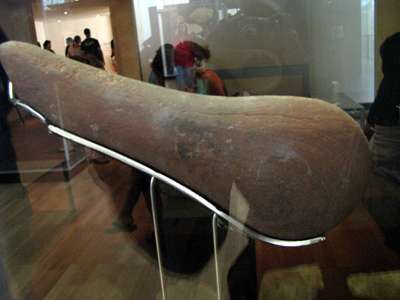 "Shaped like a large spoon made of red sandstone, 8 3/4 inches long by 4 3/16 inches wide and 1 1/4 inches thick, the lamp is finely polished and symmetrical. Its shallow oval cup serves as a receptacle for fuel. It has a capacity of two fluid ounces. 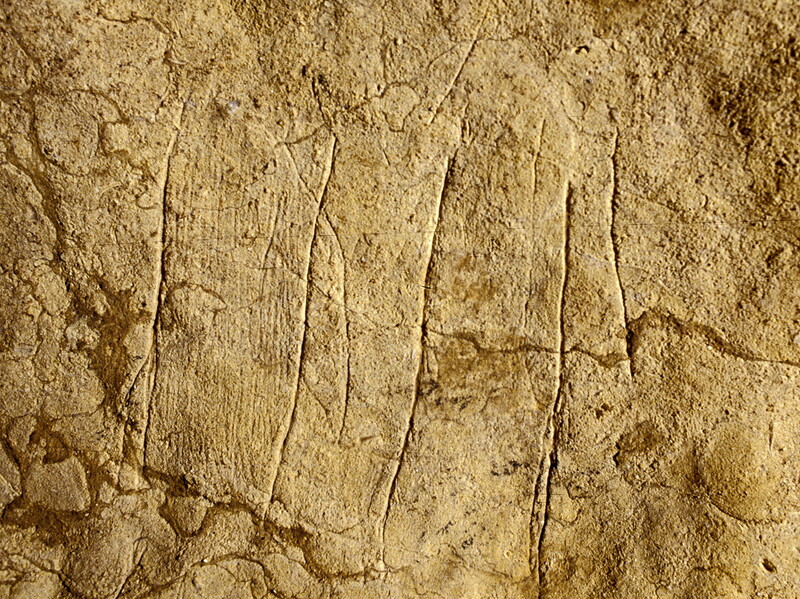 The upper surface of the handle is decorated with two abstract signs of chevrons fitted into each other, such as are found painted or engraved in various parts of the cave." When the lamp was discovered, "it still contained sooty substances grouped in a circle at the bottom of the cup on a magma of fine dust" These particles were tested and determined to be the remains of a juniper wick used for ignition. 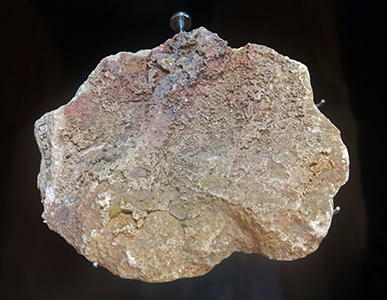 Further information may be found here about the Lamp of Lascaux - Le Brûloir de Lascaux, which was found buried in the floor of the Shaft at Lascaux by l'Abbé Glory, and is a superb piece of workmanship. 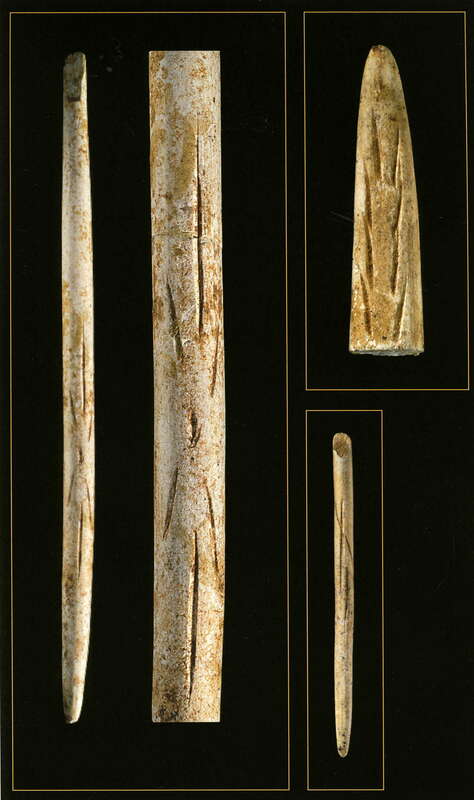 It is from the Magdalenian culture, 17 000 BP. 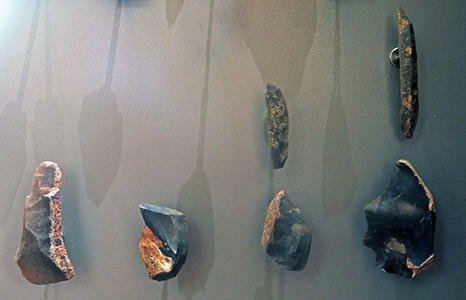 It can be viewed in the National Prehistory Museum in Les Eyzies-de-Tayac. 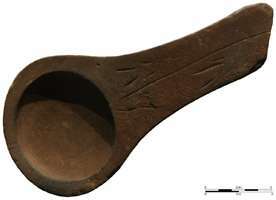 Shaped like a large spoon made of red sandstone, 8 3/4 inches long by 4 3/16 inches wide and 1 1/4 inches thick, the lamp is finely polished and symmetrical. Its shallow oval cup serves as a receptacle for fuel. 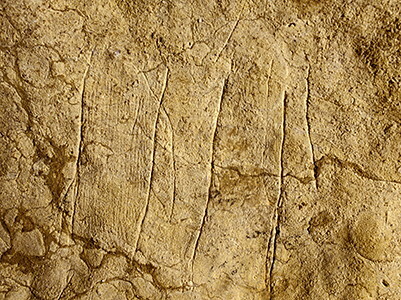 The upper surface of the handle is decorated with two abstract signs of chevrons fitted into each other, such as are found painted or engraved in various parts of the cave. When the lamp was discovered, it still contained sooty substances grouped in a circle at the bottom of the cup. These particles were tested and determined to be the remains of a juniper wick used for ignition. Swimming Stags in the Nave. The left wall has four panels: one of seven ibex, "the Imprint", the Great Black Cow and the Crossed Bison. The right panel is occupied only by a single frieze of swimming deer. Horses are the most frequent animal depicted, with 27 examples. 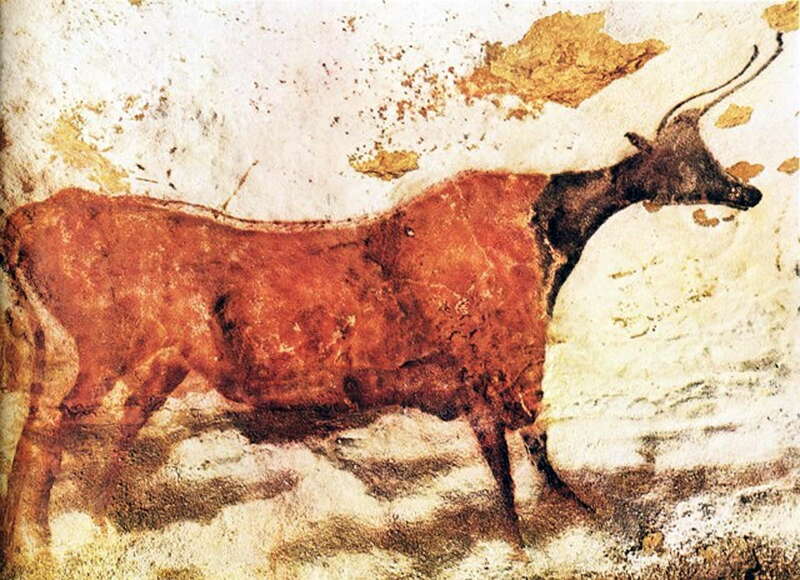 There is only one aurochs, the ibex occurs nine times, bison five, and deer six times. The second group of horses on the left wall of the Nave. 18 000 to 15 000 BP. The Two Bison, also known as the Crossed Bison, in the Nave. (length 8 ft.) The artists used the concavity of the wall to create the illusion of the two bison galloping at full speed toward the viewer. 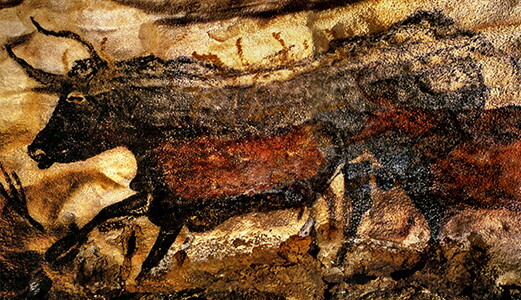 This painting is often held up as an example of the skill of the Paleolithic cave painters. The crossed hind legs show the ability to use perspective in a manner that wasn't seen again until the 15th century. Another version of the crossed bison, from 1947, when Time Magazine visited Lascaux and took the first good photographs of the cave. Detail of one of the crossed bison. 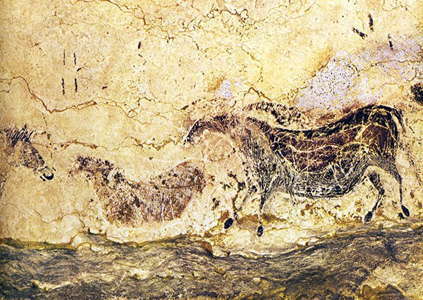 In the section of Lascaux called the Nave, the Great Black Cow has been painted over the top of a herd of horses, which are facing in the opposite direction. 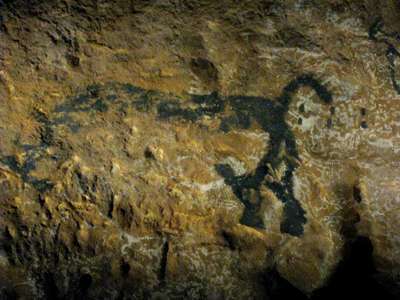 The outline of the Great Black Cow shows signs of having had some changes after the first painting, especially along the belly of the animal. 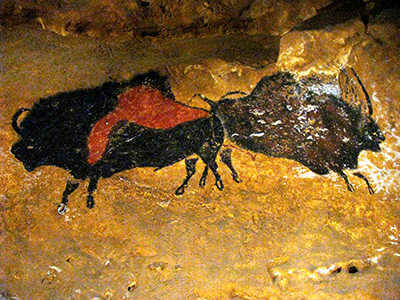 Female aurochs have thinner diameter horns than males. 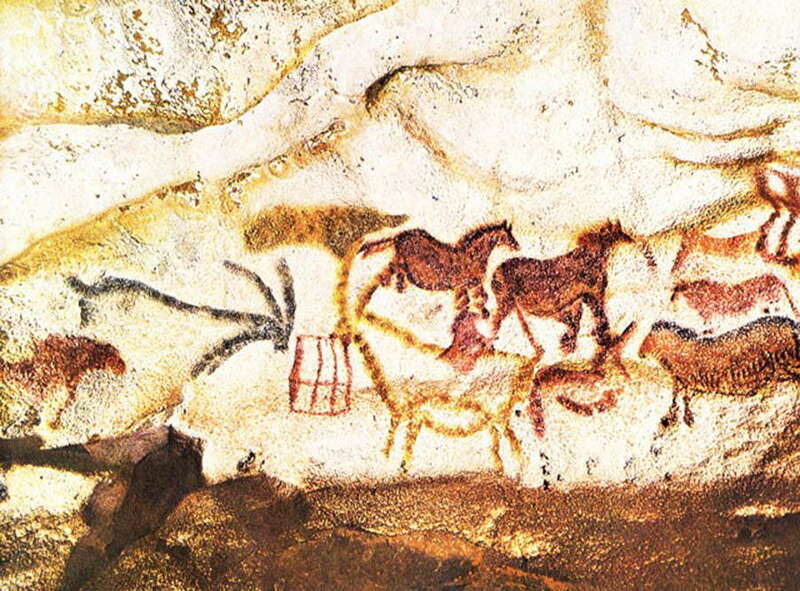 These are the horses over which the black cow was painted. They are just visible at the rump of the cow. Another version of the Black Cow. The Great Black Cow in 1947. These coloured signs under the great black cow are difficult to interpret. To my eyes they are almost like test squares for the paint used on the rest of the figures. Close up of one group of squares. A group of horses at the Nave, with the Great Black Cow coming the other way. Panel of the imprint, in the Nave. 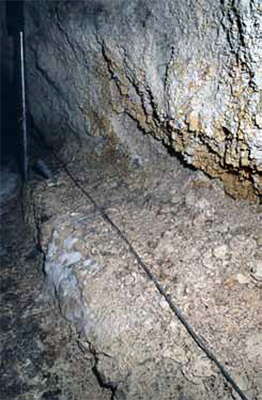 This extends over a length of four metres, and is close to the floor of the cave. It contains a number of figures, including three bison and twelve horses. All the figures in this panel have engraved outlines, and have been painted within this engraving. 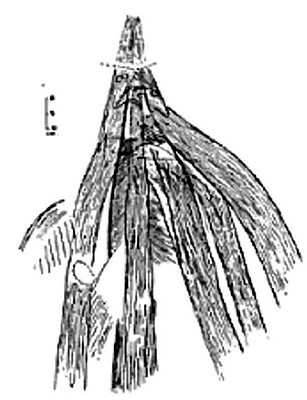 Brown was used for the bodies, and black for the legs. Between the Nave and the Chamber of the Felines, is the Mondmilch (Moonmilk) Gallery, named after its milky-coloured stalagmite encrustation. Some 20 metres (66 feet) long and about 2 metres (6.5 feet) wide, the ceiling rises as high as 8 metres (27 feet). Its crumbly surfaces explains the complete absence of any artistic decoration. 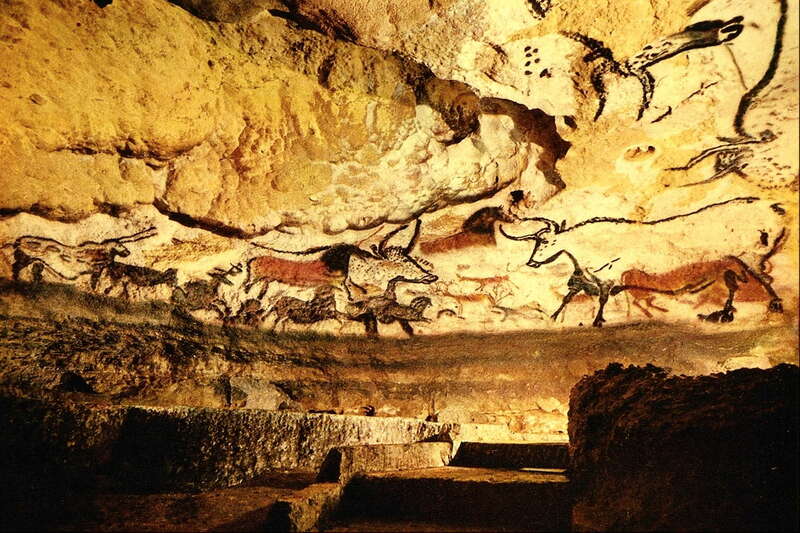 The Chamber of Felines extends for roughly 25 metres, along which André Glory counted more than 80 figures. 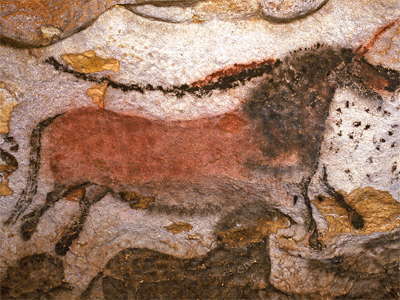 Of the 51 animal figures in this gallery, the horse is the dominant species, with twenty-nine representations, followed by nine bison, four ibexes and three stags. There are no aurochs. 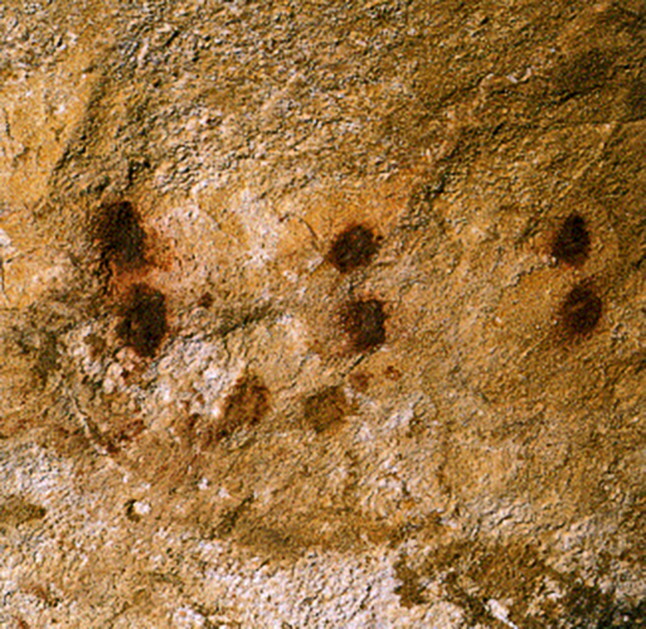 Images of felines are more present here, with six depictions, than in the rest of the cave. The distribution of the figures is uneven: 90% of them are found in the first several meters of the passage, which is the narrowest segment in the Chamber. The Chamber of the Felines differs from Lascaux's other galleries by its narrow dimensions and steep gradient which makes movement difficult. As a result, the spectator must crouch down to see the art, which - as the name suggests - includes a number of cats. In addition, there are a number of horses, and signs. Notable images include: the cats in the Niche of the Felines, and an engraving of two lions mating. Chamber of Felines, here showing an engraving of a feline. Chamber of Felines - an engraving of a horse, with the head shown face forward, looking at the viewer. Chamber of Felines - Quadrangular sign. In this chamber, the number of signs exceeds that of animal representations. Chamber of Felines - painted and engraved horse. On this panel is a veritable herd of horses, about ten heads altogether. The figures are mostly intertwined. One of them seems more complete and associates the engraved contours with the painted area. 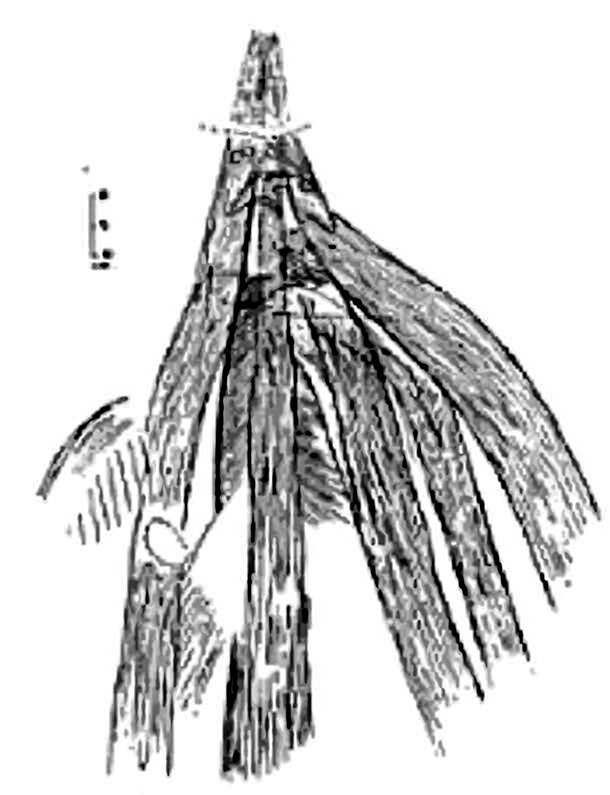 The graphic treatment, particularly of the hoofs and joints of the front and back limbs, is not unlike that of certain horses in the axial diverticulum. Chamber of Felines - black painted horse with later engravings over the top. In the Chamber of Felines horses represent some 50% of the animal representations. This black horse, drawn below the 'perched hut' is part of a group of about ten equines, a homogeneous group disturbed only by a deer. The almond shaped eye, results from a simple scratching of the flat black colour. It would seem that only the head and the neck belong to this figure, the rest of the body being confused with that of a second equine. A well engraved contour makes it possible to differentiate them. Chamber of Felines - mark similar to the Roman numeral XIII. In the last two thirds of the Chamber of Felines, the number of schematic figures, but also of animal figures, is distinctly lower than in the vestibular part. Among these, we notice an association of two geometric forms juxtaposed, one a cross, the other made of three parallel lines. Side by side, these two entities form the Roman numeral XIII. They are painted black. Chamber of Felines - Bison Head and Horns. 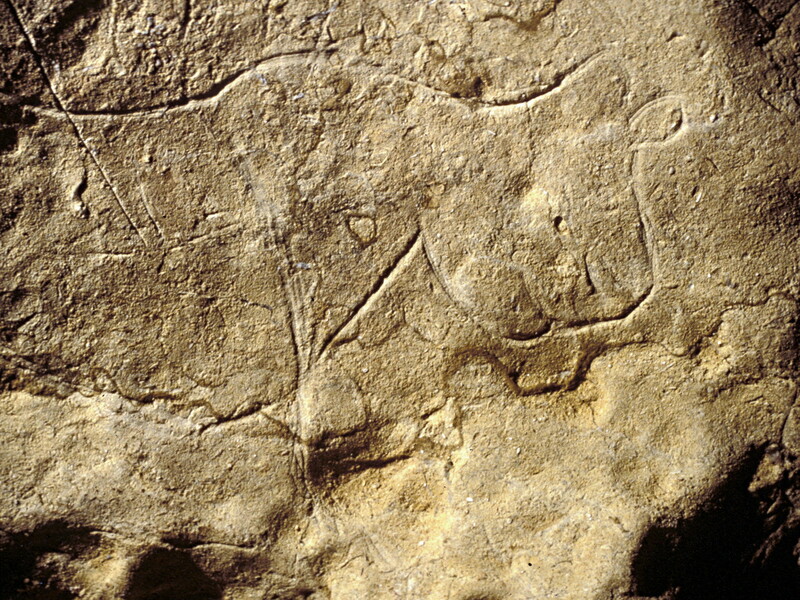 This bison, engraved on a rough surface, consists of the head, the horns, and the shoulders. The eye is treated clearly as concentric circles. The surface of the wall is soft, altered rock, and this made it possible to create deep outlines. It is the last animal representation in this chamber. Chamber of Felines - Six red dots. Group of six red dots. They are highly reminiscent of those that mark the end of the decoration of the Shaft. The same graphical units are found again here, at the end of the Chamber of the Felines. Only the colour is different. 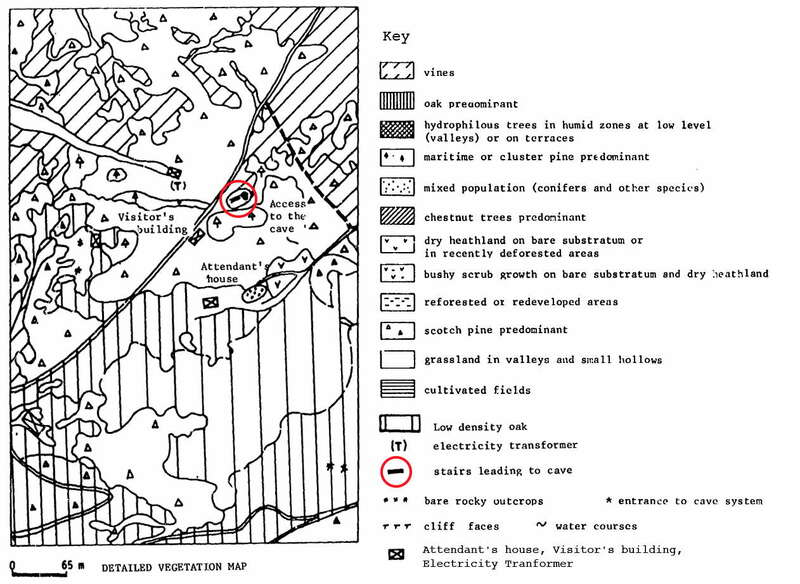 The other two paler red dots, located immediately below, are recent. The end of the Chamber of Felines. Note the six red dots high on the left wall, which may indicate the end of the chamber, in a similar way to the black dots of the Shaft. No direct determination of the age of the paintings themselves has been made so far. 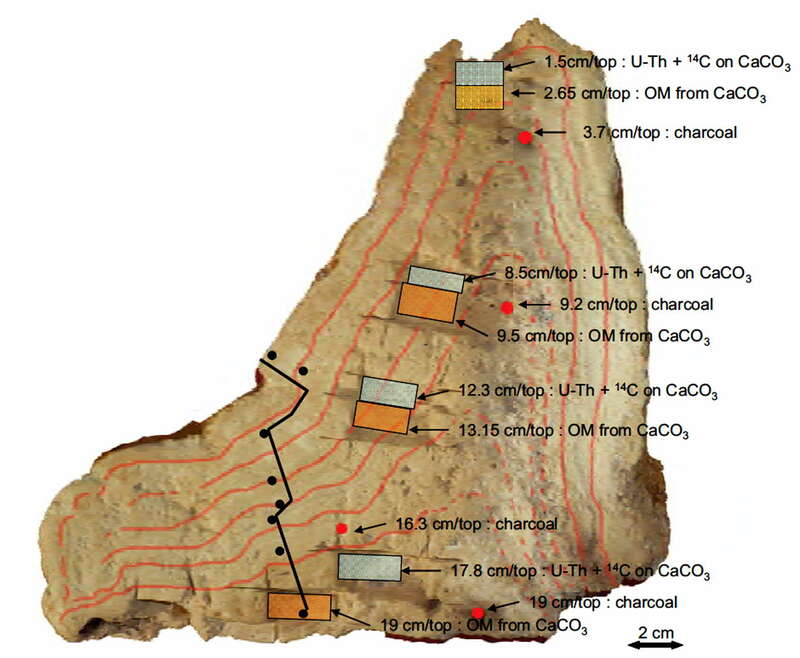 However there have been, in all, eight radiocarbon age estimates to date, all but one based on substantial pieces of wood charcoal excavated from deposits in various locations on the cave floor. Two of the utilised samples were recovered from Le Puits. 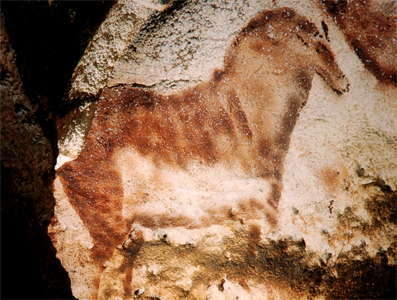 The first was collected by Abbé Breuil and Séverin Blanc (Denis Peyrony's successor as district prehistorian) in 1949 and provided a determination of 15 516 ± 900 uncal. BP. The second was collected by Glory in 1959 and provided a result of 16 000 ± 500 uncal. BP. These estimates clearly overlap during the second half of the seventeenth millenium and the first half of the sixteenth millenium, and suggest Magdalenian activity in Le Puits. In 1958, charcoal collected by Glory from the floor of Le Passage was analysed and provided an estimate of 17 190 ± 140 uncal. BP. 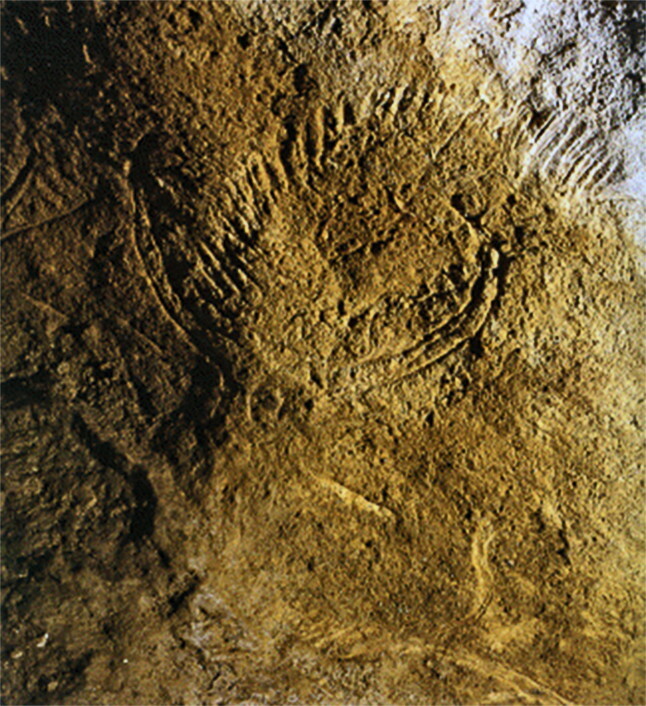 Although this third date is earlier than the two from Le Puits, it also suggests an Early Magdalenian date for activity in the cave. 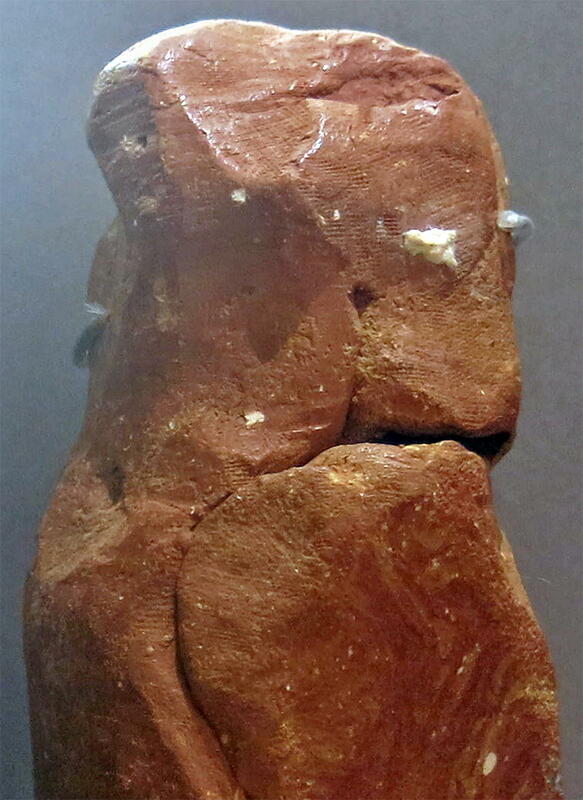 Leroi-Gourhan, however, deduced a later date and a longer duration for the decoration, the earliest figures belonging to the second half of the Solutrean, and the later ones to the Middle Magdalenian. In 1998, a new estimate was obtained from a fragment of worked antler, also recovered by Breuil and Blanc from Le Puits. The result was 18 600 ± 190 uncal. BP, and suggested late Solutrean (or Badegoulian) activity. Although the four estimates cover the same chronological age proposed by Leroi-Gourhan for the decoration of the cave, they span 3 000 years and offer little precision to events. They are based on material from the floor, and do little more than confirm the presence of people in the cave during this period. 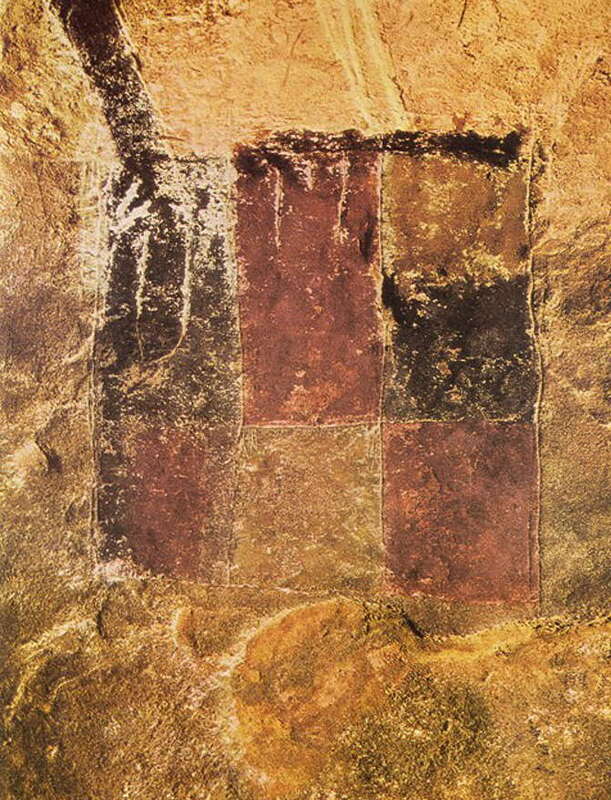 The paintings themselves remain undated, but the weight of opinion based on stylistic similarities with other sites leans towards a late Solutrean date. There is, however, a further conundrum because the fauna depicted belongs to a temperate climate, whereas the Solutrean is considered to have occurred during a very cold period. Four further age estimates were obtained from later contexts. 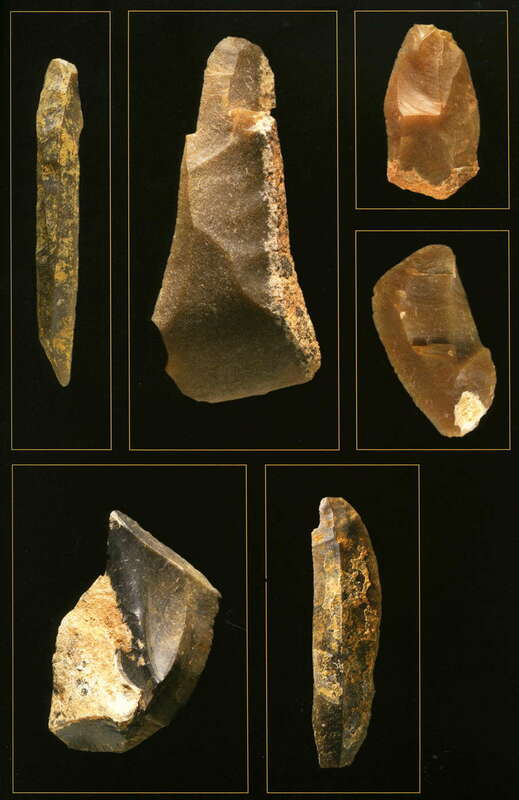 They span the period about 9 100 BP - 6 900 BP, and seem to provide evidence for visits to the cave by Mesolithic people. 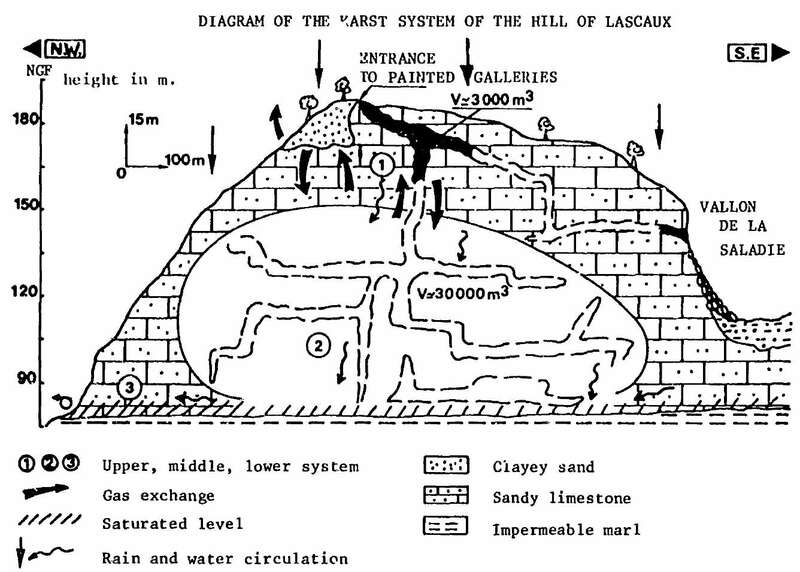 Plan of Lascaux I showing main features and art. Vertical section of the hill of Lascaux, showing the basic geology and the movement of gases and liquids through the system. Note also that the section is greatly exaggerated in the vertical plane (15/100) in order to more easily show the features of this karst system. The hill is a relatively low rise, not a steep knoll as might be expected at first glance from this drawing. Ruth Morse sits at a desk where picture captions were written during the time that Ralph Morse made photographs in the cave complex at Lascaux. In the background, local townspeople gather to see the cave paintings under bright lights for the very first time. 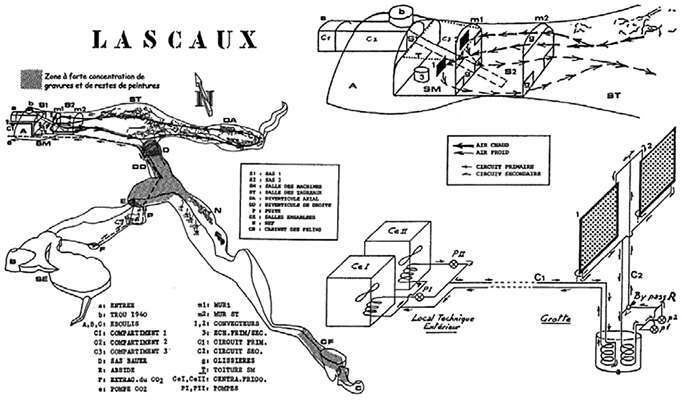 Schematic vertical cross-section of the Lascaux Cave entrance from the Entrance to the Passage chamber, showing the position of some of the gours of the cave. This map shows the remaining gours at Lascaux in blue. One of the first photographs of the gours in the Salle des Taureaux (unknown photographer, © Thierry Felix collection). Note that the gours are dry and have some signs of damage in places. This is a vertical cross section of one of the gours, with the orange lines showing how the gour grew with time. The gour was approximately 20 cm tall. 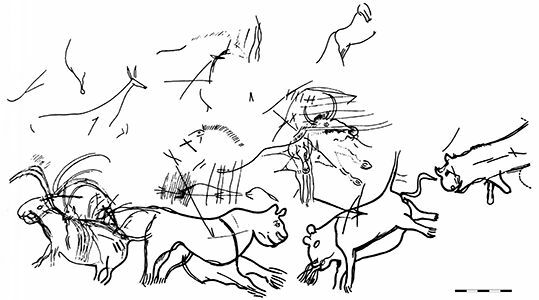 The results show that the Lascaux Cave gours are less than ten thousand years old, and thus developed after the ice ages were over. 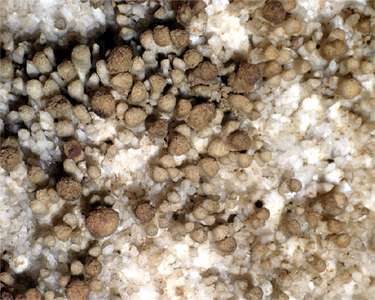 Uranium-Thorium (U-Th) dating is used to determine the age of calcium carbonate materials such as gours or stalactites . Because uranium is soluble to some extent in all natural waters, any material that precipitates or is grown from such waters also contains trace uranium, typically at levels of between a few parts per billion and few parts per million by weight. 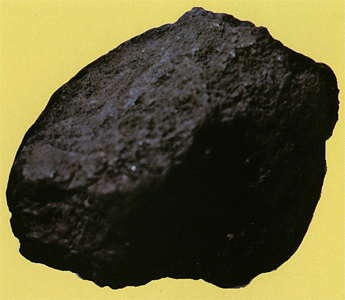 In contrast, thorium is not soluble in natural waters under conditions found at or near the surface of the earth and so materials grown in or from these waters do not usually contain thorium. As time passes after the formation of such a material, the uranium-234 in the sample decays to thorium-230, with a half-life of 245 000 years. Uranium-Thorium dating has an upper age limit of somewhat over 500 000 years. 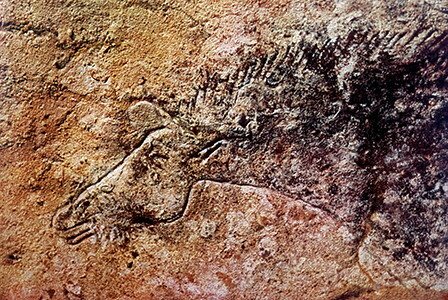 In the summer of 2008, the artist Renaud Sanson showed the progress made on a recreation of Lascaux, to even finer degrees of artistic exactitude than that attained in Lascaux II. 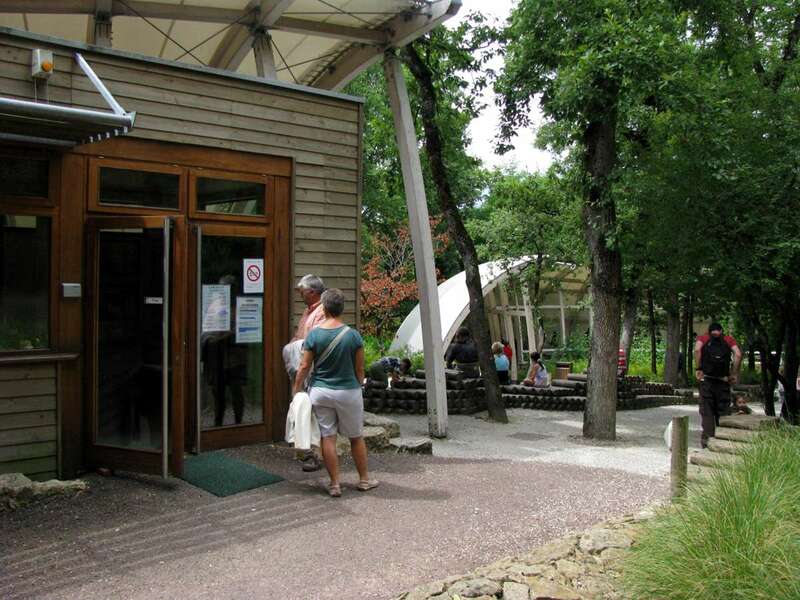 The display area was in Montignac, the closest town to the archaeological site of Lascaux. 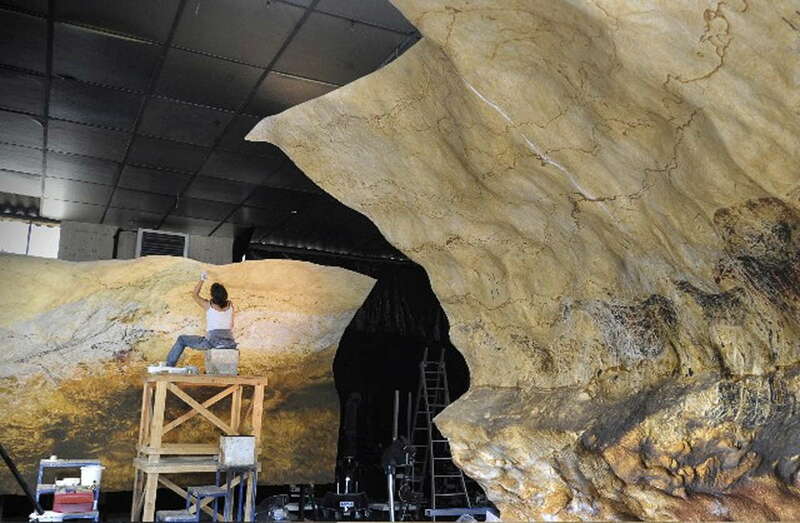 The project aimed to recreate the major scenes of the Nave of Lascaux, which are absent from the Lascaux II gallery. Lasers were used to make a computerised map of the gallery, and a master model of each wall was created by assembling hundreds of very thin plates of polystyrene cut with high pressure water. The walls were finished with the texture of the original wall using fibreglass resin. By combining careful photography with this recreation of the walls themselves, the artists created the most accurate facsimiles yet made of such a cave chamber. The panels have been designed to be easily transported around the world in containers, bringing the wonder of the Lascaux paintings to people in other lands. 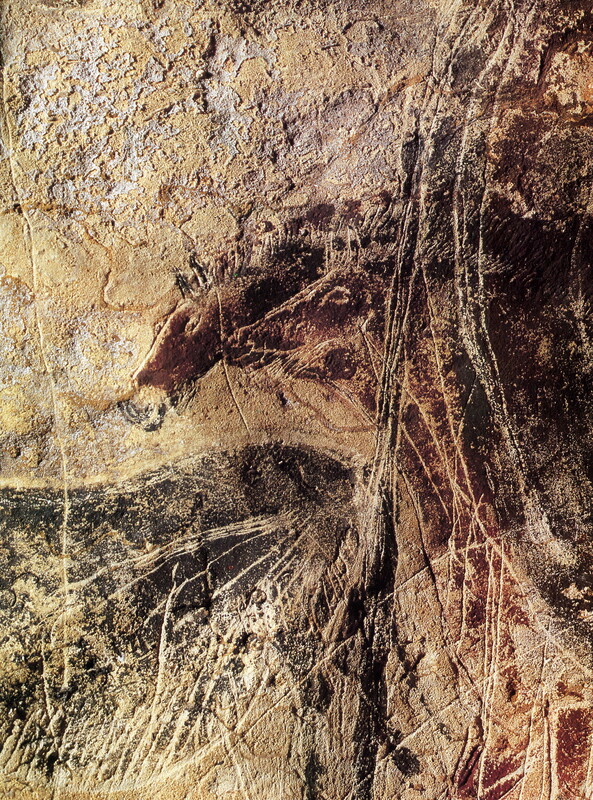 This is a foretaste of what could be Lascaux III. 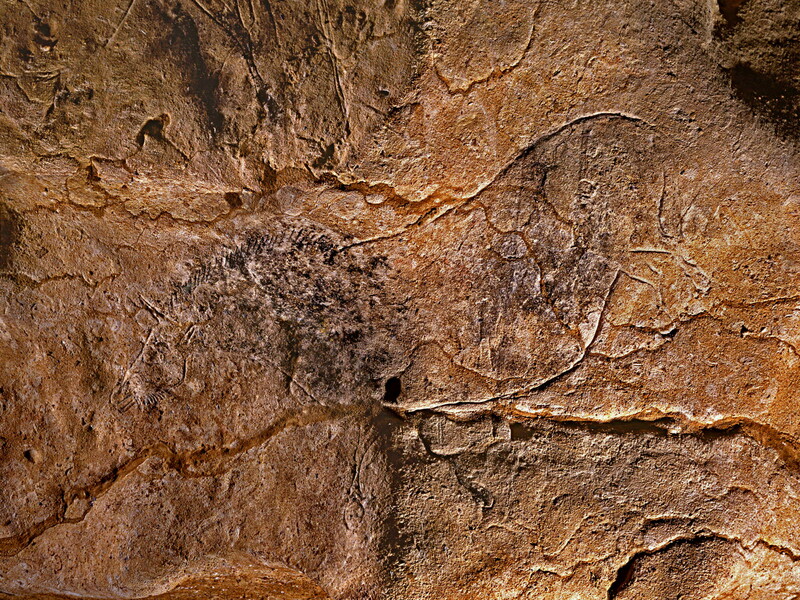 Here is Lascaux Cave transferred to three dimensions in a computer simulation. Here is another view of Lascaux in 3D, shown as a temperature profile as a function of depth in the hillside surrounding the cave of Lascaux. It is useful to compare the two images. The computer simulation starts at the Salle des taureaux, the Hall of Bulls, and does not include the entrance, which has been greatly modified. 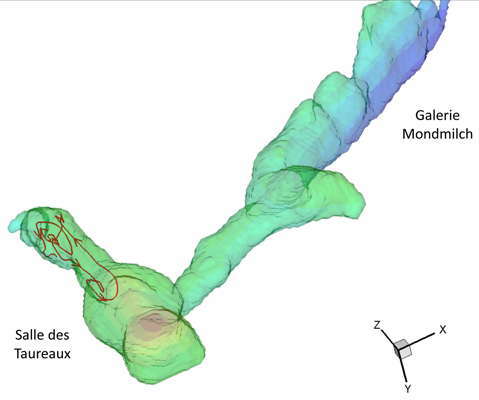 The image on the left shows an apparently recently discovered extension to the Puits or shaft that shows the continuation for some distance of a very narrow passageway, until it opens out into a chamber with a tall chimney at its end. Presumably there are no images in this section of the cave, as it is barely mentioned in the literature. 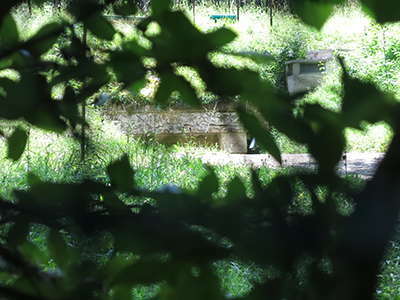 Note also the five metre deep Southern Shaft at the end of the Chamber of Felines, which has a vertical chimney above it. This shaft had to be negotiated by the original artists in order to paint several images on the other side. In this view, we can see clearly the relation between the Hall of the Bulls, the Passageway, the Nave, the Mondmilch (moonmilk) gallery, and the Chamber of Felines. Using laser technology, the gallery was first transferred in three dimensions to computer, then the walls were recreated to an accuracy of one millimetre or less, using lightweight fibreglass resin. 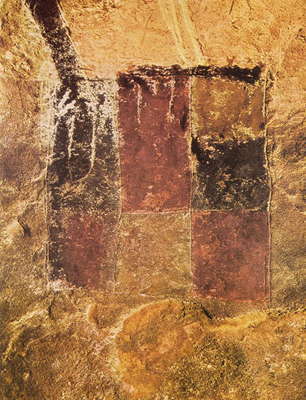 Similarly, the entire surface was photographed with great accuracy with regard to both form and colour, and the artwork was then rendered in false colours. The artists paint onto the false colours, projected here onto the facsimile gallery, using coded colours. This is to ensure the most faithful rendition of the original scenes. The highly talented artists would otherwise unconsciously try to make the image more art-like, instead of sticking faithfully to what was in front of them. An artist works on a reproduction of one of the paintings at Lascaux. 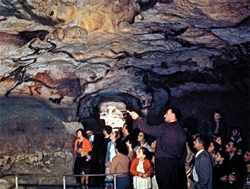 The exhibition for which it was intended is called the Lascaux International Exhibition, and was built for touring. 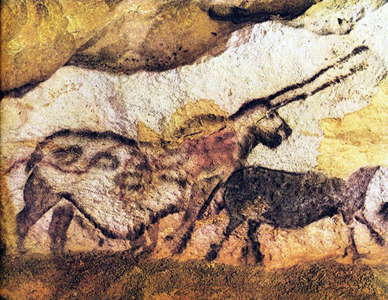 Unfortunately the French Government has decided to withdraw from the Lascaux 4 project, a future complete replica of the cave. The goal of the whole project was to faithfully reproduce the five most representative works of Lascaux on media light enough to be transported. 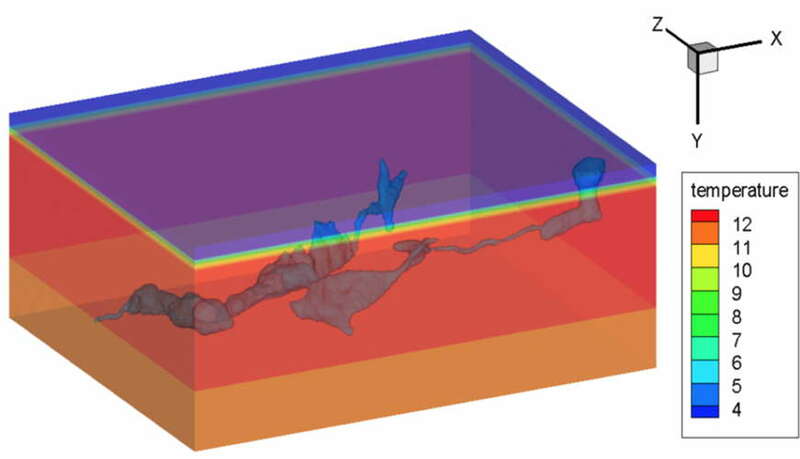 Hence the choice of elastomer panels modelled by a milling machine by the digital forms of the real cave walls. Each panel is covered with a thin layer of a mixture of glass fibre and organic material agglomerated to reproduce the appearance of stone. A real attention to detail has been paid to the works. The reproduction techniques used have evolved along with better technology, and are more accurate. The project uses workshop facsimiles with multiple panels in acrylic, covered with a veil of calcite, reproducing the exact topography of the cave, using laser technology. The color palette was reconstructed from an analysis of the original pigments. The painters then reproduced the same frescoes, using the same hollows and bumps that the Magdalenians used, by a projection of the drawing on the three dimensional surface. This technique could be used to reproduce the entire painted cave of Lascaux around 20 000 years after the original work of the Cro-Magnon painters. This exhibition was presented in Bordeaux from 13 October 2012 to 7 January 2013 before moving to Chicago and Montreal. This diagram shows the sunlight at and near the summer solstice, at which time the setting sun would illuminate the Hall of the Bulls and the axial diverticulum. 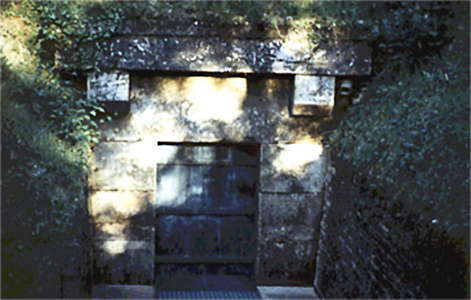 Sunlight shining on the door of the original Lascaux on the summer solstice in 1999. Bright sunlight is available for almost an hour for a few days a year at this time, when the sun is setting between 302° and 304° azimuth, shining straight down the length of the cave. This could easily have been used by the inhabitants to determine the summer solstice, as well as providing light to paint by, or to plan further works. 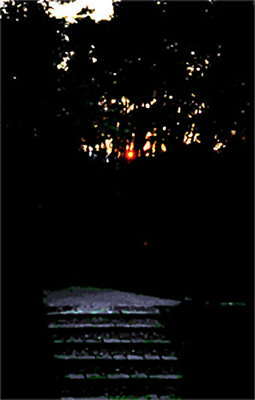 The setting sun seen from the entrance to the original Lascaux on the summer solstice in 1999. 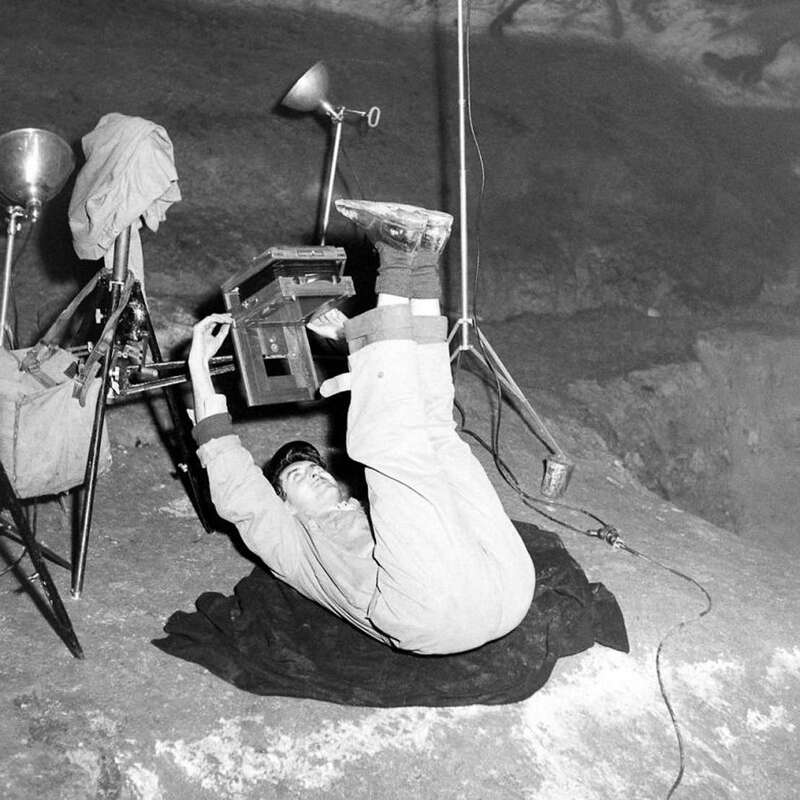 Photographer Bernard Sury focuses a camera on prehistoric paintings on the ceiling at Lascaux, 1947. Pipe in mouth, a member of the crew that helped Morse during his stay in Montignac -- photographed from a separate chamber -- admires one of the larger horses painted on the walls at Lascaux. In 1948, a year after Morse's pioneering photographic work, Lascaux was opened to the public. But in 1963, the cave was closed after 15 short years when experts determined that carbon dioxide from the breath of thousands of visitors, as well as spores and other post-Ice Age contaminants tramped in from above ground, were damaging the paintings. 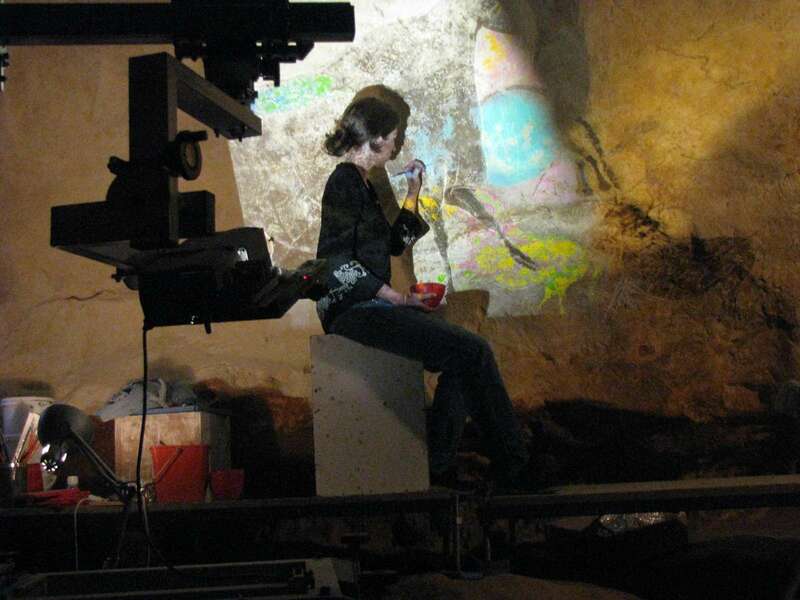 Today, only a handful of people are allowed inside Lascaux for a few days each year to monitor damage (a mysterious, encroaching mold is the latest culprit) while they work to keep the magnificent paintings adorning the walls from going the way of their creators, and vanishing entirely. Door to the original Lascaux. 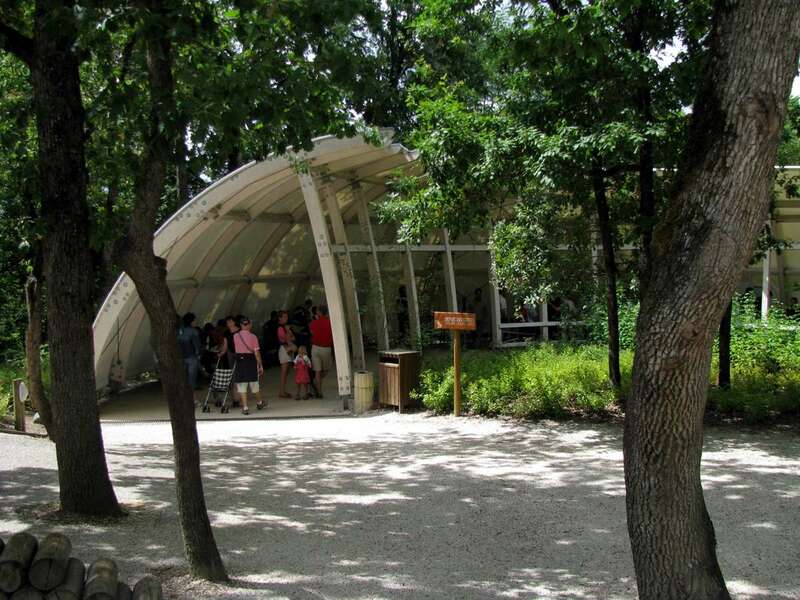 The Lascaux entrance is now almost impossible to see for the general public. It is hidden behind a vine covered steel mesh fence, and is not signposted in any way. Although someone with a sense of humour has added this sculpture of a little dog, forever digging in the ground looking for the cave! Me at Lascaux II. 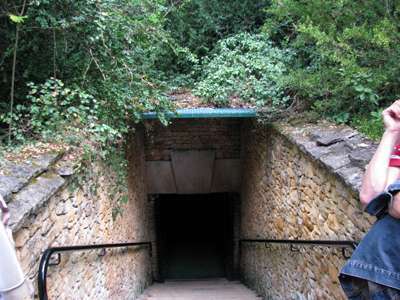 Some effort has been made to have this entrance similar to the entrance to the original cave. 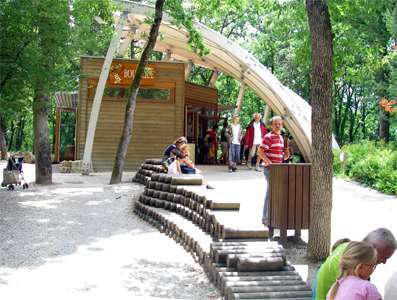 The Office and Souvenir shop have been completed with a roof structure which evokes an abri, a rock shelter. 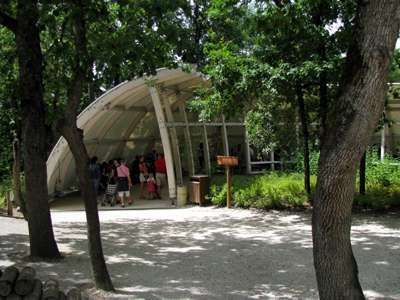 This is the shelter where patrons wait for the next tour of Lascaux II, also with the abri shaped roof structure. Robot the dog with two of the four discoverers of the cave. 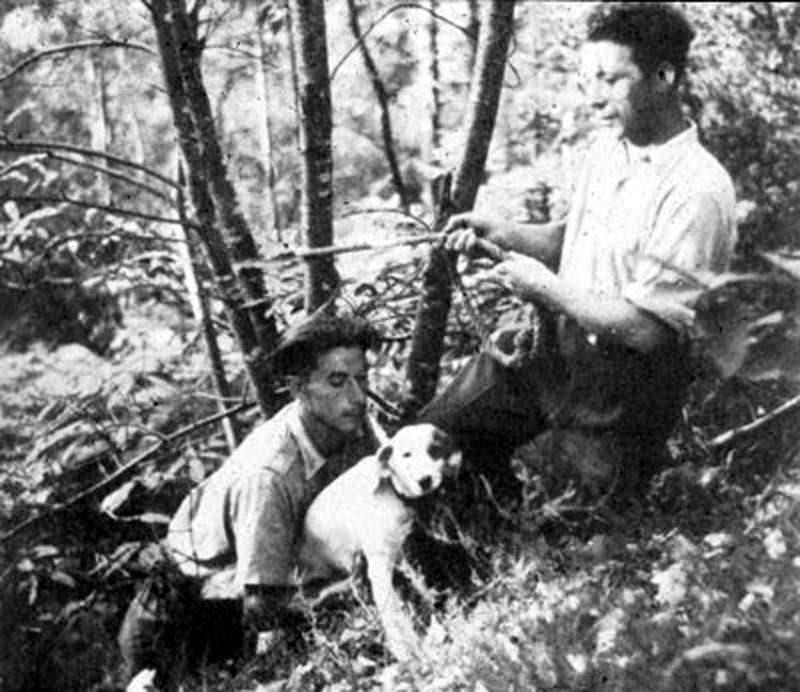 In September 1940, four boys and a dog set out on an adventure in Dordogne. 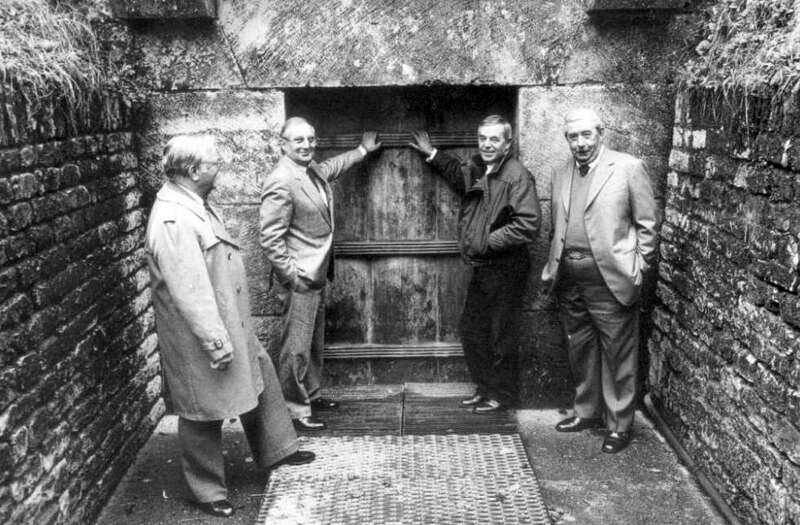 The boys - Marcel Ravidat, Jacques Marsal, Georges Agnel and Simon Coencas – where intrigued by an old legend about a tunnel running under the Vezere River linking the old Castel of Montignac to the Manor of Lascaux. According to the legend, this tunnel would lead to a second tunnel and a treasure hidden deep in the woods of Montignac. 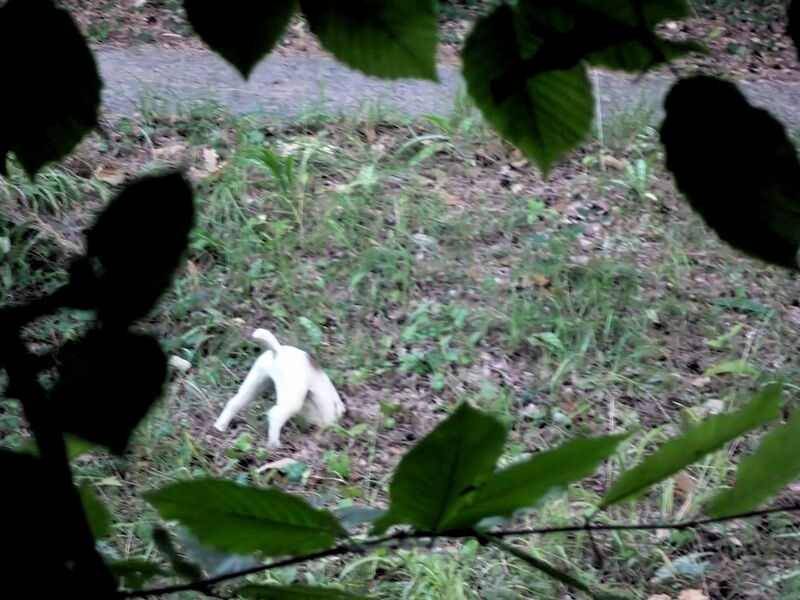 As they walked through the woods the little dog, Robot, ran ahead toward a deep depression in the ground covered with overgrowth and began sniffing the sunken hole. The depression had originally been created by an uprooted tree. The boys hurried to catch up with Robot. When they saw the deep hole, they immediately thought it might lead them to the legendary tunnel and the hidden treasure. 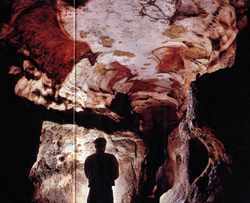 Lascaux cave, entrance of the cave. Count Bégouën. After trying to determine the depth of the hole by tossing rocks in the opening and listening for contact with the bottom, they decided to explore it. They enlarged the opening by removing a few stones around the edges with their penknives. 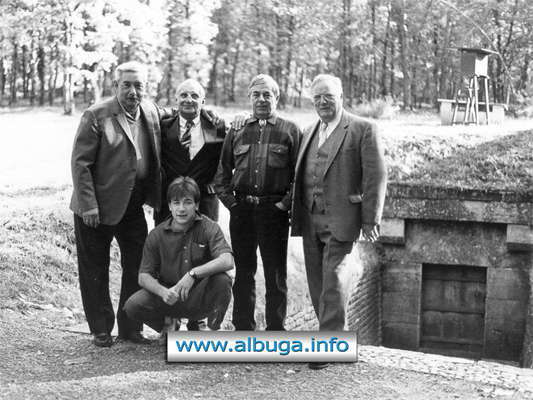 Then, each one of the four boys slid through the hole in turn, along a semi-vertical shaft embedded with stalagmites down fifteen meters to a dark underground chamber. “The descent was terrifying,” recalled Jacques Marsal who was just fourteen years old at the time, the youngest of the four boys. Inside the chamber they used their oil lantern to look around shining it on the walls and ceiling. Marsal remembers this first encounter describing what they saw as a “cavalcade of animals larger than life painted on the walls and ceiling of the cave; each animal seemed to be moving.” The ceiling was pure white, covered with calcite. And the paintings were brilliantly multicolored in reds, blacks, browns and ochres. The boys were standing in The Hall of the Bulls. Mesmerized by their findings, the boys ventured to the end of the cave. By then, the light from the oil lantern was fading and they realized they needed to return to the surface. The boys were afraid of not being about to climb back out of the cave because of the steep incline of the shaft. But, in fact, the climb out was easier than they expected, recalled Marsal. The narrowness of the shaft served to their advantage allowing them to prop up with their knees and elbows, inching along until they reached the surface. They were ecstatic with their discovery. The four boys promised to return the next day much better prepared for exploration. They swore an oath of secrecy determined to keep their discovery to themselves for the time being. Marsal remembers keeping the secret was harder done than said in families where brothers and sisters, and sometimes cousins, shared rooms with each other. All four boys kept their promises and met again the next morning. This time they took a rope with them to help in getting down to the second level of the cave, the Well, or the Shaft. Marsal described the descent into the deep fissure as “scary because the rope, which was tucked under our armpits, was cutting the flaky edges of the walls and earth kept falling on our face as we were lowered down into the Shaft. By the third day of their discovery, the boys could not keep their amazing secret any longer. They decided each of them could bring five friends to see the cave but would charge a forty cent per person admission price. Marsal said that was the first “commercial exploitation of the cave.” Once the word was out, the news spread like wildfire and soon the entire village was lining up to have a look at the newly discovered paintings. 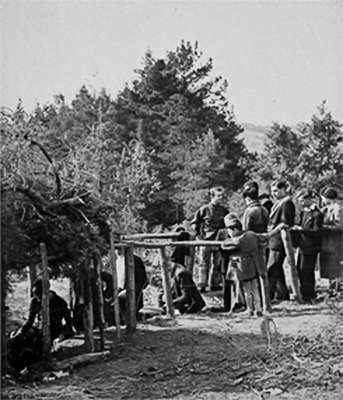 The boys enlarged the hole and made access easier for the public. Overwhelmed by the number of visitors and aware that the paintings were probably prehistoric, the boys decided to seek the advice of their schoolmaster, Leon Laval. 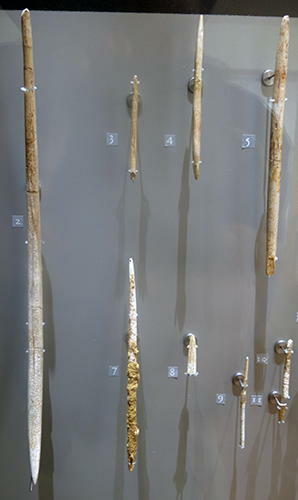 Mr. Laval, a member of the prehistoric society of Montignac, did not believe the boys’ description of what they had found. It took quiet a bit of convincing to persuade him that the whole story was not just a scam to push him down a hole. Entrance of the cave by 1940. Count Bégouën, Jacques Marsal and Marcel Ravidat, Professor de Fribourg, Paul Fitte, Abbot Breuil, Abbot Sainsaulieu, Maurice Thaon, Léon Laval, René Barotte. 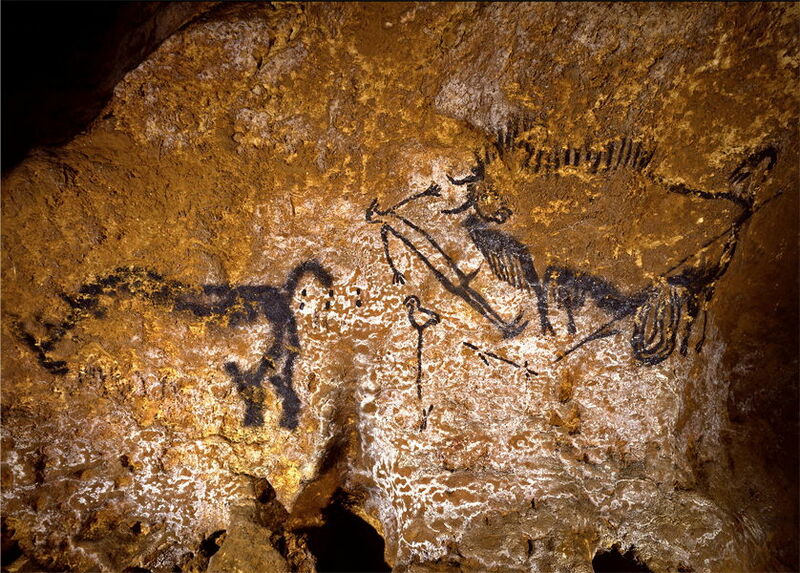 Once inside the cave, Laval was immediately convinced the paintings and drawings were from a prehistoric time. He instructed the boys and gave them guidelines about the fragility of the paintings. He gave them two rules: Do not let anyone touch the paintings, and, more importantly, guard the cave from possible vandals. Summer vacation was coming to a close. Soon all of the boys, except Marsal, returned to school and their studies. 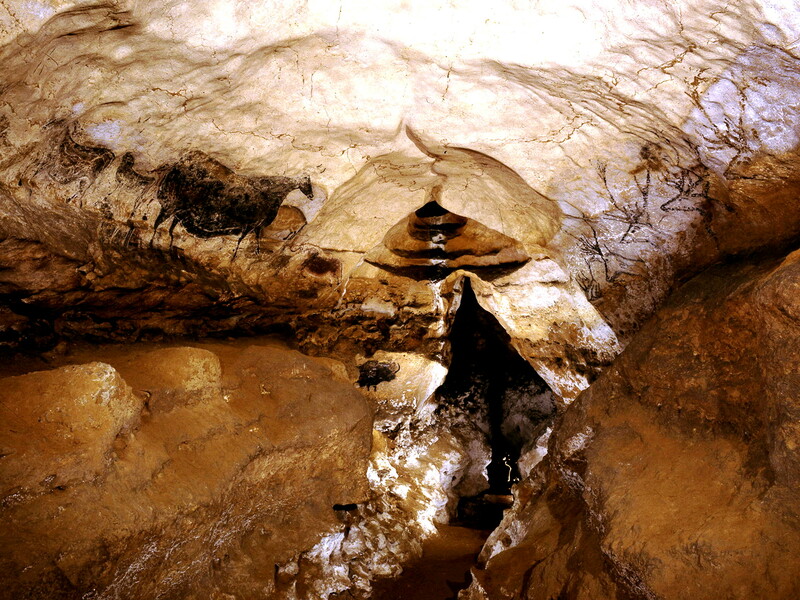 Marsal, worried about the cave’s safety, pleaded with his parents to allow him to guard the cave day and night. 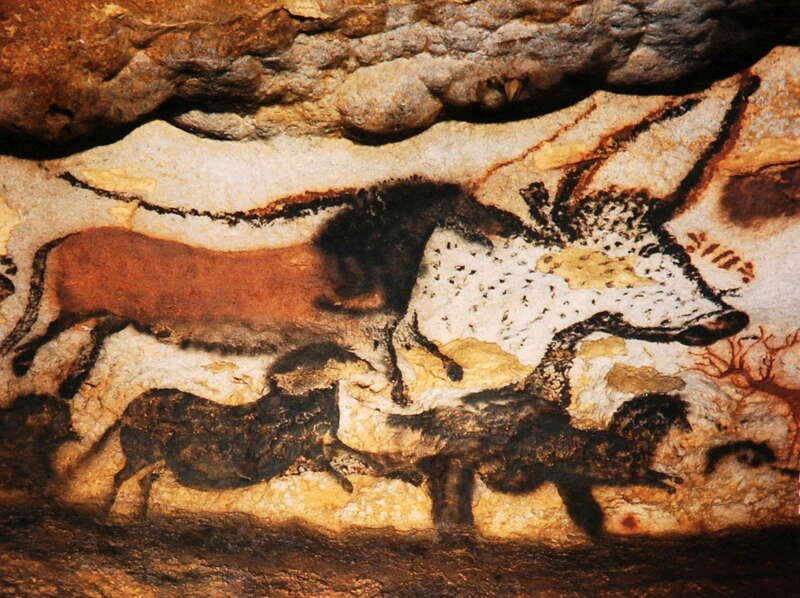 Realising the significance of the paintings and their son’s devotion to the cave, they eventually gave in. 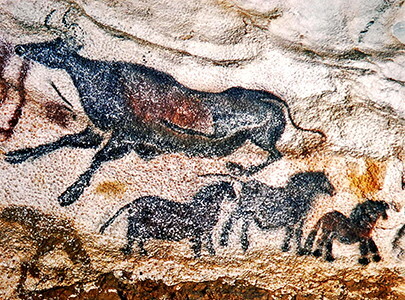 Marsal pitched a tent at the entrance to the cave and begin what would become a lifelong commitment, the care and safety of the cave and its magnificent prehistoric paintings. Lascaux cave. Significant terracing work was underway to enlarge the entrance. Visitors came daily to the cave and the fourteen year old Marsal became the de facto guide. One day, a young man with a sketch book in hand, came for a tour. 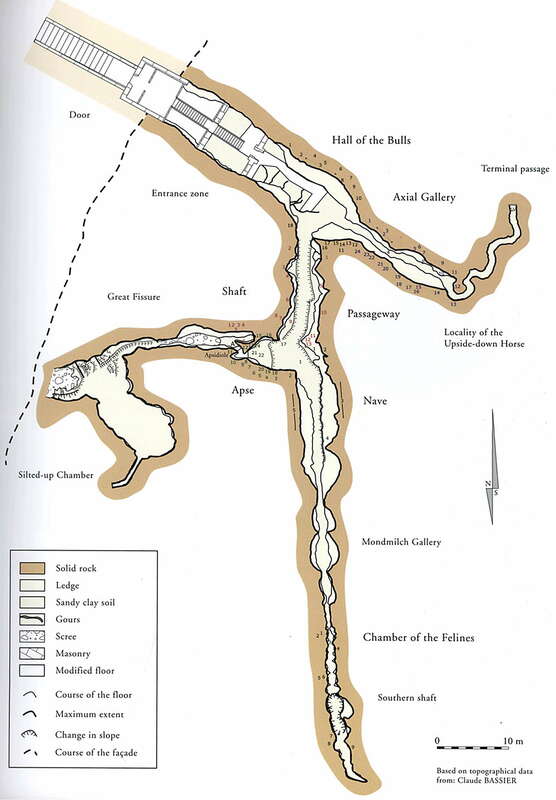 As Marsal showed him through the cave, the man made drawings of the images as he went. The man, a student of the famed prehistorian, Abbe Breuil, immediately took them to his mentor who, by luck, was visiting in the nearby village of Brive. 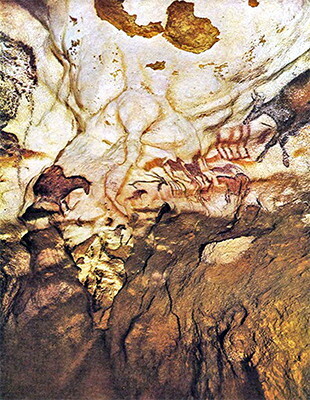 Breuil took no time in coming to see the cave after seeing the sketches of his student and confirmed the authenticity and the era of the paintings. The discovery was sensational and now substantiated by the highest authority. News spread throughout France, Europe and the world. 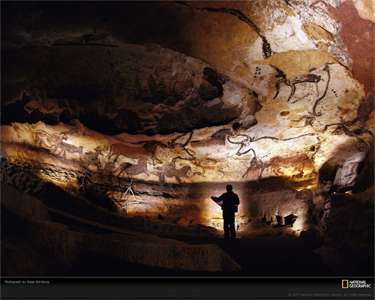 The cave of Lascaux became known as the Sistine Chapel of Prehistoric Art. 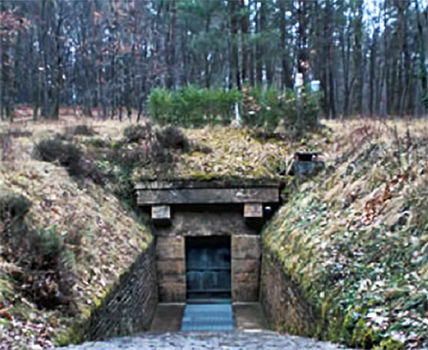 The cave was located on private property owned by the Count of LaRochefoucault whose family began the commercial exploitation of the cave. 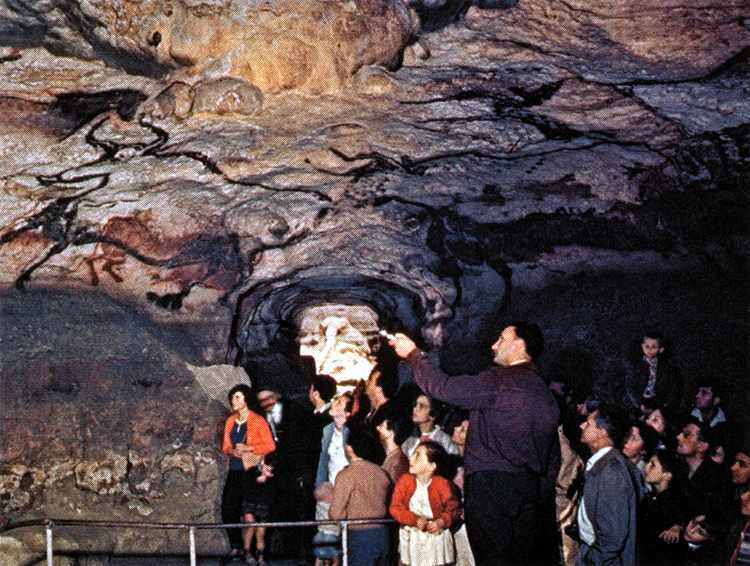 By 1948 daily tours brought as many as one thousand people a day through Lascaux. It was not long before the impact of so many visitors was felt. Testament of the popular success of the first visits to Lascaux: Visitors of all ages flock to the cave entrance. In 1986 Thierry Félix managed to bring together the four finders who had lost sight of each other after World War II. 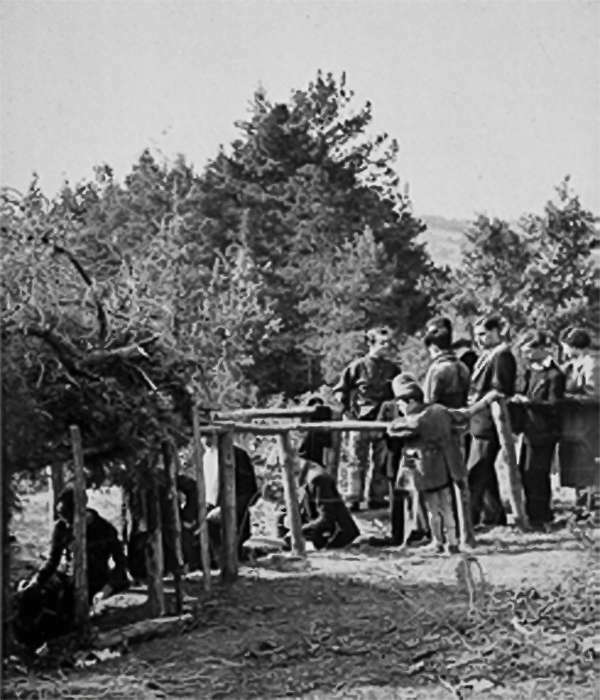 This photograph is very important because it shows the land around the entry to the cave. When Thierry Félix was a child, his heroes were the four finders of Lascaux. 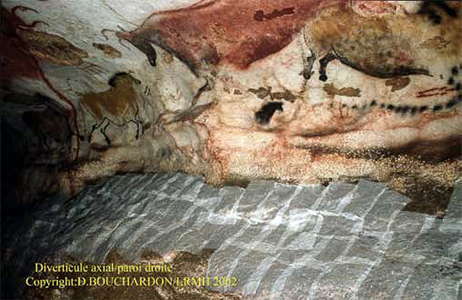 Let’s not forget that he was born in Montignac in 1964, one year after Lascaux was closed to the public by order of the Ministre des Affaires Culturelles, André Malraux, due to a proliferation of lichen caused by the excessive number of visits. 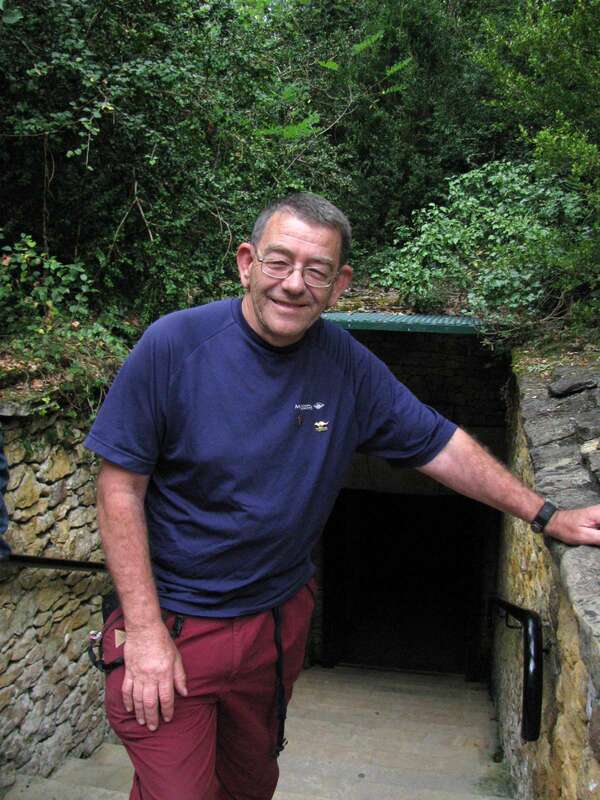 At an early age he had the immense privilege of going down into the cave with Jacques Marsal as his guide. At that time very few visits were permitted: five visitors a day, five days a week. Then, in 1983, the cave was closed for good. He realised just how fortunate he had been and turned over and over in his mind each image, each word pronounced by Jacques on that subterranean journey, 18 000 years into the past. 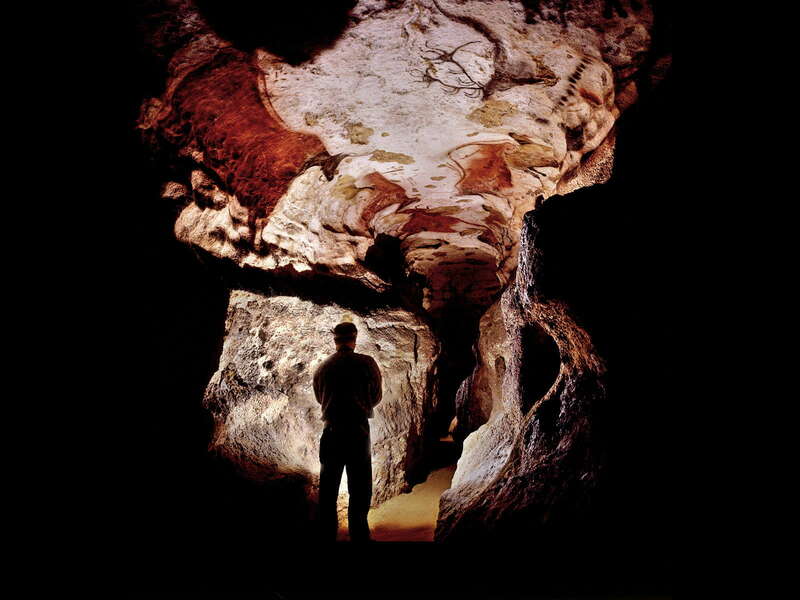 He became a guide at Lascaux II, the facsimile of the cave which opened to the public in 1983. 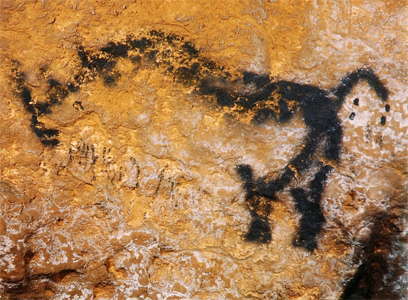 He studied prehistory and prepared a thesis on Lascaux Cave Art. With the finders themselves he checked all the information he had gathered and in 1990 he published a comic telling the true story of the discovery of Lascaux: 'Le secret des bois de Lascaux', text: Thierry Félix, drawings: Philippe Bigotto, co-writers: Maurice Ravidat, Georges Agniel and Simon Coencas. Jacques Marsal had passed away in 1989. 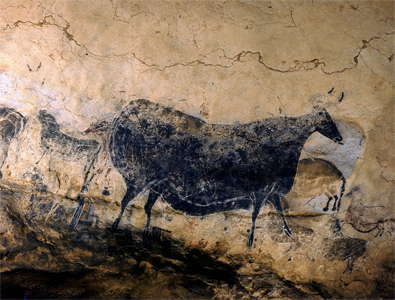 The discoverers of Lascaux, in front of the entrance. 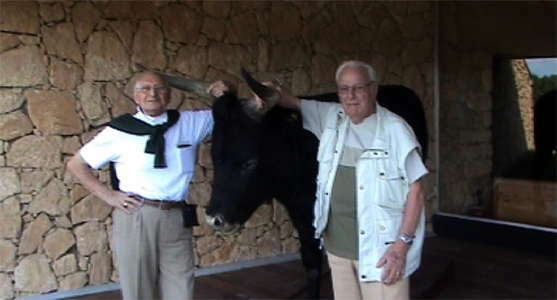 The discoverers of Lascaux, 70 years after their discovery of the Lascaux caves, in 2010. 'Never let yourself forget' is Thierry Félix’s creed and so, as part of the 70th anniversary celebrations of the discovery of the cave, he decided to organise a walk from Montignac to Lascaux with the two surviving finders: Simon Coencas and George Agniel, aged 84 and 86. At the end of this exceptional day the two men were rewarded: they were invited back into the original cave, their unforgettable childhood sweetheart – and their eyes sparkled, just like before. 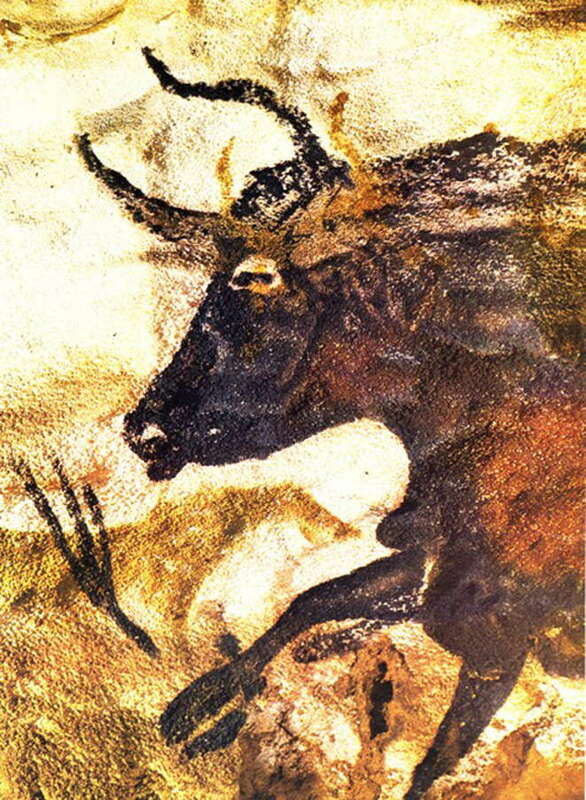 For more than 17 000 years, the bestiary of the Lascaux cave in southwestern France has survived the ravages of human history. Anyone entering this time capsule is confronted by four metre long bulls that appear to float across the massive vaults like religious apparitions. An enigmatic spotted beast with a round snout and straight, forward-pointing horns, plump horses in brilliant yellow and deer with treelike antlers-all seem in equal part intimates of the present and missives from some distant world. Which they are. 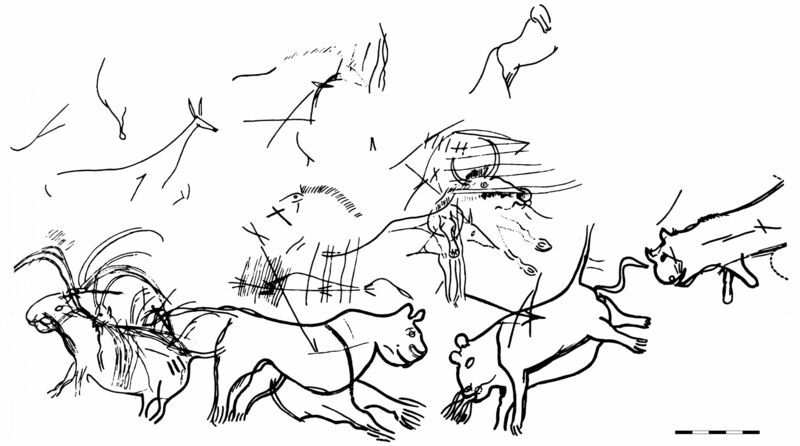 Though the draftsmanship is strikingly Modernist - on exiting the cave in 1940, Pablo Picasso said, "We have invented nothing" - these creatures were painted and inscribed on the limestone walls during the Upper Paleolithic age, when everyone was a hunter-gatherer, and Homo sapiens coexisted with Neanderthal man. They are evidence of the quantum leap in neural connections that gave birth to the uniquely human attribute of consciousness. 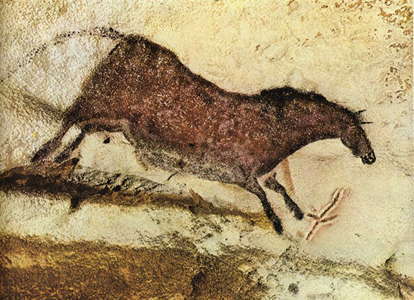 Lascaux is the most fundamental example anywhere of what the iconoclastic 20th century writer and anthropologist Georges Bataille called "the basic desire of all men, of whatever period or region, to be amazed." Like few other creations of the human hand, it is a patrimony not of any one country or culture, but of humankind as a whole. 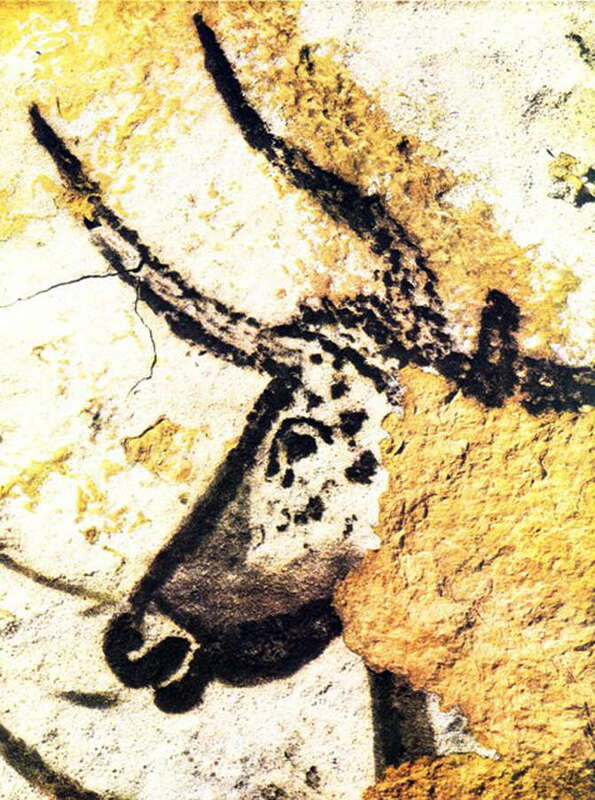 Yet Lascaux's robust longevity belies a frightening fragility. Five years ago, after the ill-conceived installation of new climatic equipment, Lascaux suffered an outbreak of fungal infection that threatened to destroy in a few years what thousands of years had left largely unscathed. The cave's custodians are still struggling to eradicate this scourge. 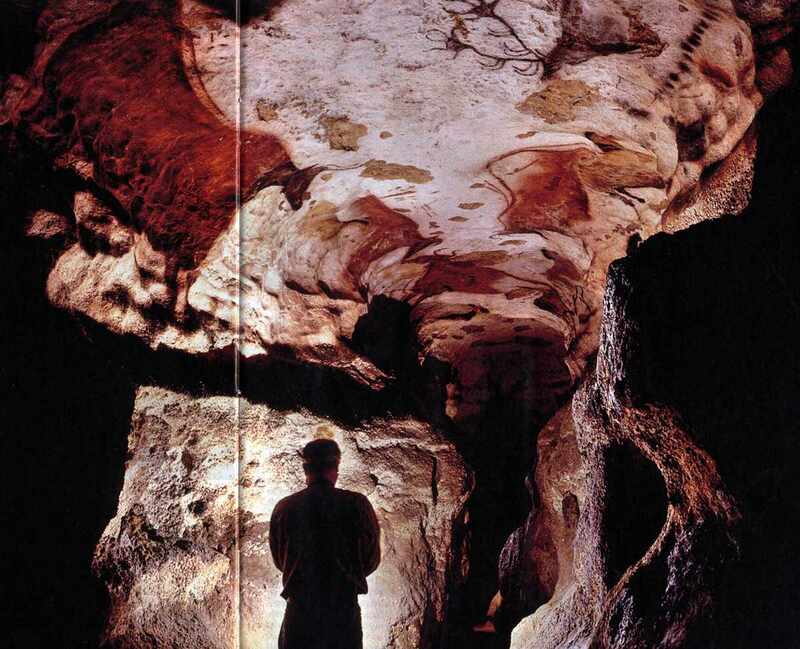 Last month French officials admitted to Time that the Fusarium solani fungus has on occasion spread from the floor to the paintings, and that separate fusarium strains have now been identified in the various arms of the 235 metre long cave complex. Time was allowed to visit the cave because its keepers feel they finally have the outbreak under control. But to keep the fungus in retreat, a team of restorers comes into the cave every two weeks - dressed, as everyone who enters now must be, in hooded biohazard suits, booties and face masks - to remove filaments from the walls. 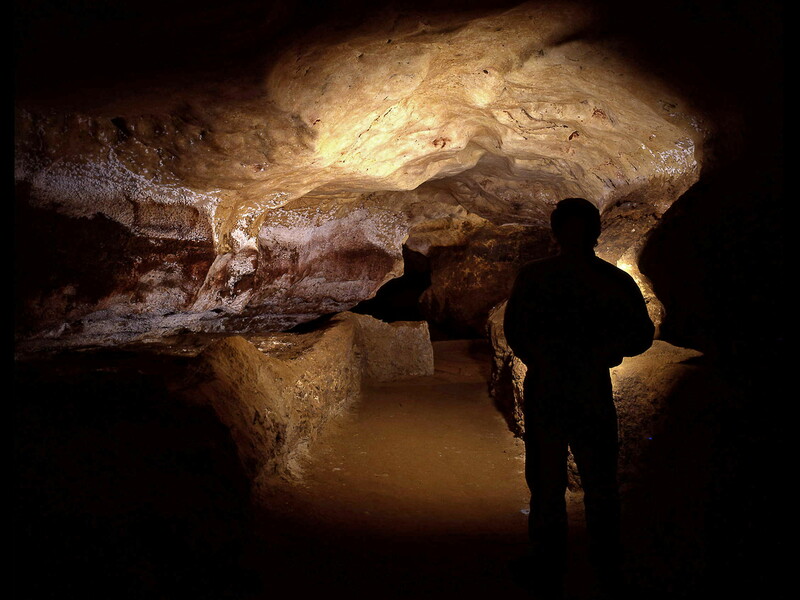 Another team visits regularly to audit the cave's sanitary condition using laser imaging. 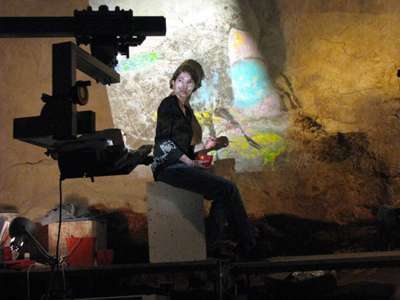 When art restorer Rosalie Godin was urgently called to Lascaux in August 2001, she couldn't believe her eyes. "It was as if it had snowed in the cave. Everything was covered in white" she says. Two of the caves caretakers, Bruno Desplat and Sandrine van Solinge, had raised the alarm when the white filaments, spotted in isolated parts of the cave months before, spread like wild fire over a matter of days. Desplat, who lives next to Lascaux and has devoted over 15 years to its care, says he became physically ill upon seeing the luxuriant bloom. That's not to say that he or the cave's curator, the prehistorian jean-Michel Geneste, could have been entirely surprised. 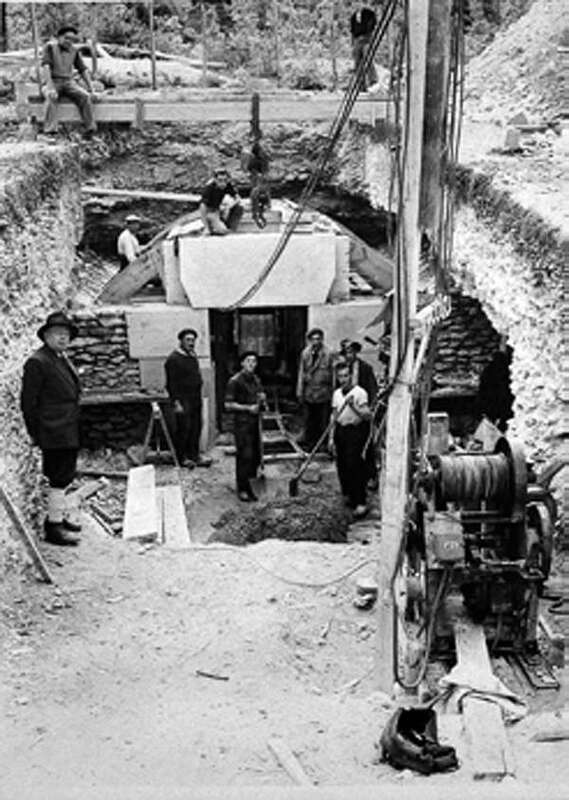 That spring, workers had finished installing a €23 000 air-conditioning system beneath the stairs leading down to the cave. Caretakers monitor the cave in 2003; every two weeks, restorers come to remove mold. The new machine was a major departure from the way Lascaux's delicate balance of temperature and humidity had been regulated for the preceding 30 years. 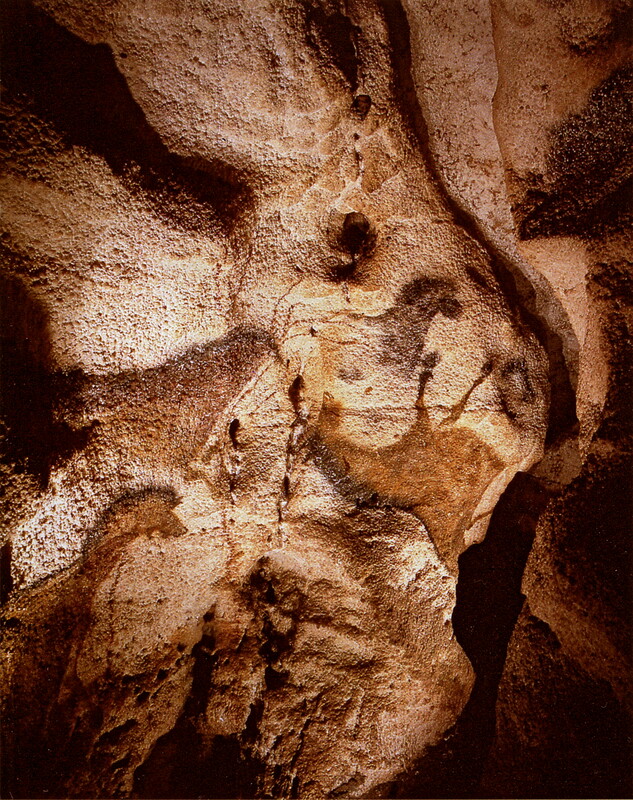 The old system, installed in 1968 after years of minute studies of the cave's climate, relied on Lascaux's natural currents to pass air over a cold point and make sure that water condensed there, like it does on a beer can, rather than on the walls of the cave. 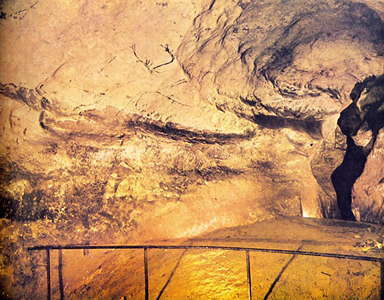 This passive system was only necessary during the wettest periods of the year, when it worked as a functional replacement for the earth that for millennia had absorbed excess water from the saturated air of the cave, but that had been removed since the cave's discovery in 1940. The new system was designed to automate the process, but also sought to improve it by using two massive high-powered fans to pull the air toward the cold point. Such an intrusive approach scandalized those who had worked so hard to figure out a more modest solution to earlier problems in the cave. "Our idea was always to be as parsimonious as possible" says Pierre Vidal, a retired researcher who worked in Lascaux for decades. "This thing seemed more like a central air-conditioning system." In most organizations, an individual or board will have the last word on decisions, especially one this controversial. Yet nobody claims authorship of the decision to install the new machine. Geneste, who as Lascaux's curator since 1992 is effectively the cave's top manager, says that he was always opposed to switching to a new principle for regulating the cave, "but following on our decision to restore a machine that could maintain the caves parameters, a chain of administrative decisions led to the selection of a dynamic system." Philippe Oudin, the chief architect of historic monuments forthe department of Dordogne, who was responsible for planning and overseeing the work, did not respond to a request for comment. Technical advice for the project was provided by Ingéni, an air-systems consultancy firm based near Paris, which had designed systems for supermarkets and museums, but which, like Oudin himself, had no experience with caves. "We proposed a system and that's what they chose" says the firm's managing director, Michel de la Giraudière. "I don't know why they favored an active system over a passive one, but I do know not everyone was of the same opinion. They wanted a certain efficacy, and the discussion was somewhat political"
The fusarium fungus, inset, has spread from the floors to some paintings, such as this horse in the Main Gallery, pictured in 2005; restorers now remove the growths by hand. The appearance of the mold soon after the new apparatus was put in place in April 2001 suggests it was unequal to the task of maintaining Lascaux's equilibrium. By the end of that year, Geneste ordered the fans taken out altogether. "If we knew then what we learned later, we wouldn't have installed that machine" says Alain Rieu, the director of conservation for the region of Aquitaine, which ultimately signed off on - and paid for - the work. "But the old machinery was in a bad state of repair, and we all decided unanimously that we couldn't take the risk of doing nothing. It seemed like the least bad solution." If so, it was pursued at arguably the worst time. While a roof over the entrance was removed for the installation of the new system in early 2001, drenching rains poured directly into the cave's entrance, bringing with them dirt and, some suspect, fusarium spores. The danger that spores or other biological agents might contaminate the cave had been foreseen. Jean-Franqois Nicolas, director of contractor Forclim Sud-Ouest Alary Vimard, says his workers were under instructions to wash their feet, limit their working hours, and stay out of the painted chambers of the cave; Desplat himself installed a padlock to insure they did so. "We worked under the rules we were given" says Nicolas. Geneste, responsible for monitoring the work once a week With Oudin's representative, contends that wasn't always the case. 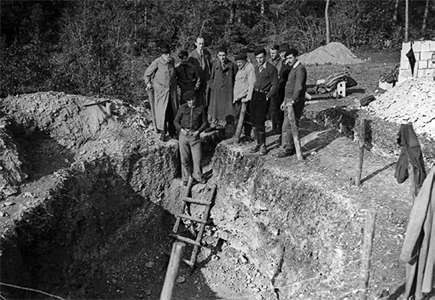 "The workers often ignored us and the architect's representative and didn't disinfect their feet" says Geneste. "They didn't keep the door closed all the time; they wanted to get the job done quickly." What's more, France's Research Laboratory of Historical Monuments (LRMH), responsible for monitoring the cave's biological condition, made no inspections during the construction work. Codin was shocked by what she found when she was first dispatched to Lascaux by the LRMH. "The construction site was run like someone redoing a bathroom" she says. "The entrance to the cave was like a swamp, and there was construction waste all over the place. It was an apocalyptic vision." Contractor Nicolas counters that: "It was not a disordered work site as long as we were there" but says masons and carpenters may have followed. When she first arrived, Godin says, she was flying blind: "I was like a fireman, with no documents, no instructions, nothing" she says. In September, the LRMH identified the fungus as Fusarium solani, a virulent mold that commonly infects soil and crops and often proves so drug-resistant that whole crop fields must be dug up and burned. Restorers shrouded the mold with bandages soaked in a mix of fungicide and antibiotics. Not everyone is convinced that the fungus entered the cave on the thick soles of contractors' boots. 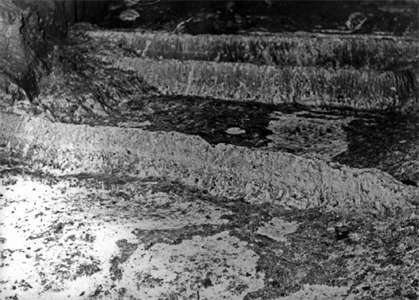 Isabelle Pallot-Frossard, director of the LRMH, says that a long-term, low-level presence of formaldehyde in the cave - ironically used as a foot wash for decades to prevent such infections - may have killed off many of the other organisms that might have prevented such an explosion of fusarium. "The fusarium strains we found in the cave are extremely resistant to formaldehyde, unlike strains from elsewhere" says Pallot Frossard. "It didn't come from outside, but had been there all along. All it needed was a slight modification in climate to take off." And take off it did. At first Godin's team sprayed the mold with an alcohol solution of Vitalub, a common ammonium disinfectant. 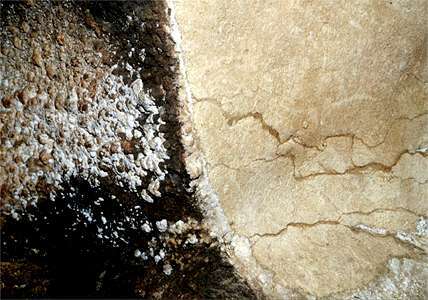 But the fusarium appeared oblivious: scientists learned that it lived in diabolical symbiosis with a bacterium, Pseudomonas fluorescens, which was degrading the fungicide, so the restorers added antibiotics to the mix in which they soaked bandages to plaster the lower walls of the cave. 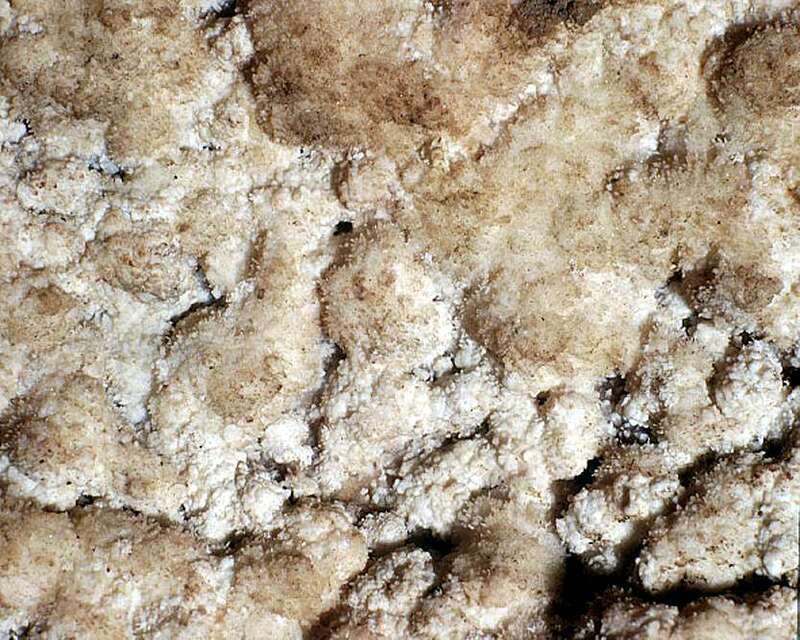 Tons of quicklime, which kills the fungus but also temporarily raised the cave's ambient temperature, was spread on the floor. Since the worst of the infection has been brought under control, "mechanical removal" continues - that is, carefully plucking the filaments from the wall by hand. 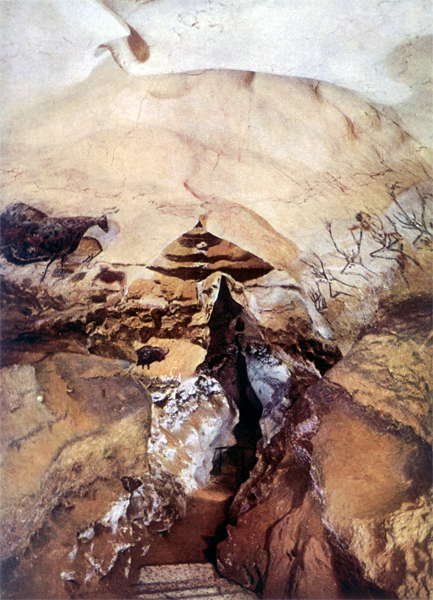 Degradation of the walls of Lascaux. Macrophotographs of the structure of the carbonate encrustations on the walls of the hall of the bulls, Lascaux. 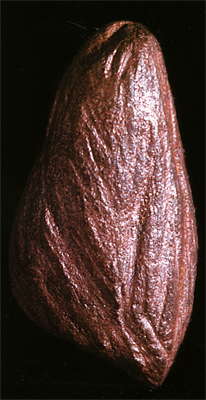 This shell was used as jewellery, as shown by the slit cut in the shell for a thong to suspend it. 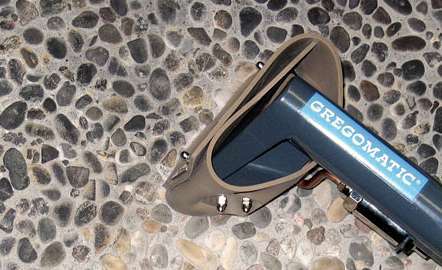 It is an elegant solution to the problem of turning the shell into jewellery, since the craftsman has used an existing groove which was part of the growth pattern of the shell. 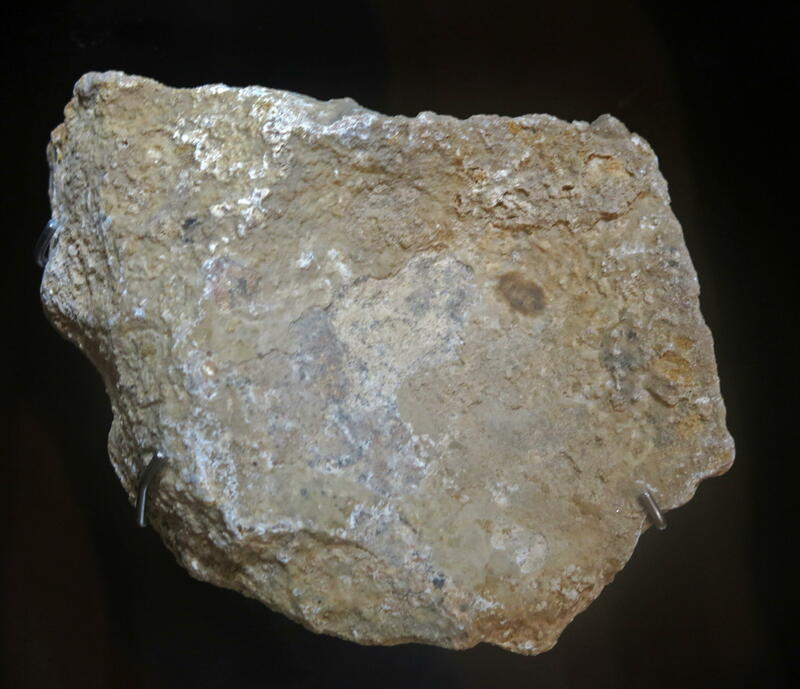 This is a marine shell, collected from a beach, a long way from Lascaux, which demonstrates the existence of trade between groups over a long distance. 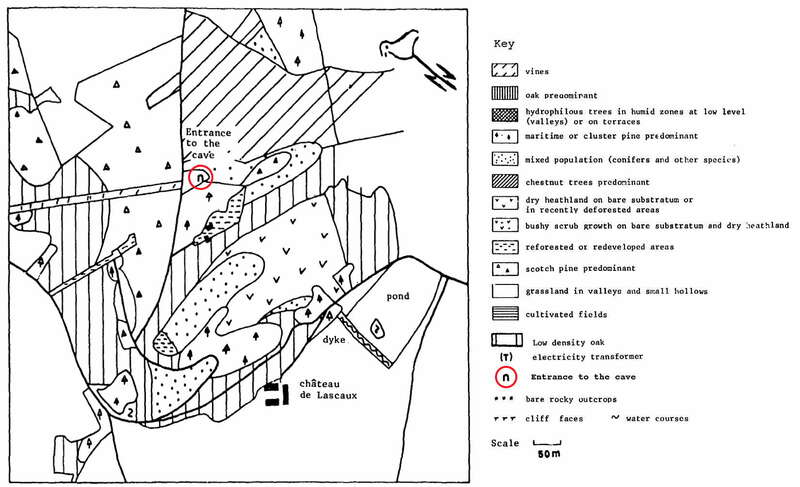 Block of haematite showing traces of use over the entire surface, from the excavations by André Glory, 1959. Block of Manganese Dioxide, used after powdering in a mortar and pestle to mix black pigment for drawings. Objects found during the excavations by Henri Breuil and Severin Blanc, 1947-49. 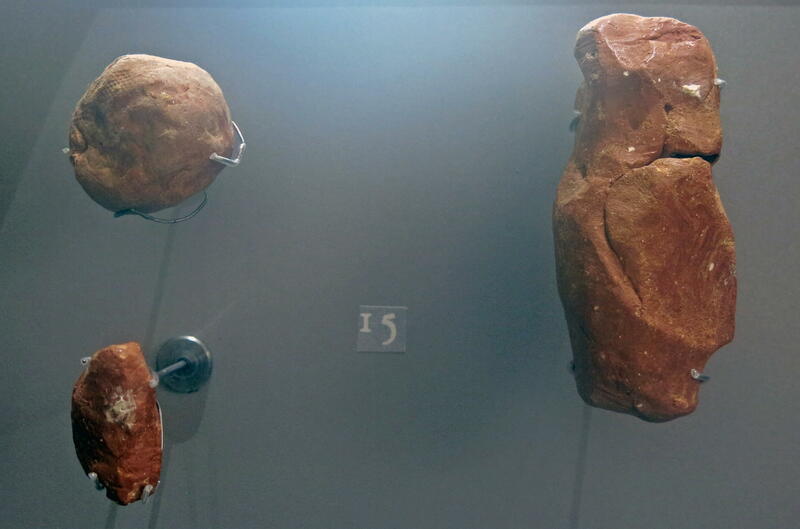 Portable objects, lithic items and bones are rarely found in the context of parietal art. Here too, Lascaux forms an exception. 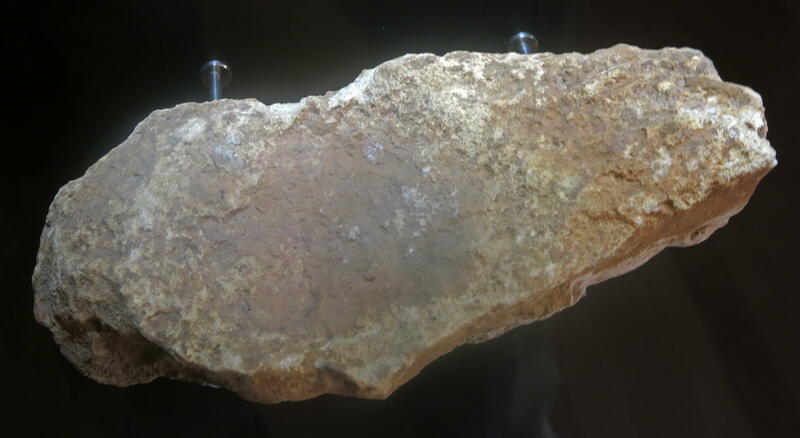 Three hundred and fifty pieces were unearthed, including blades, backed bladelets, scrapers, burins and flakes. 3 Spear point engraved with signs. 4 Spear point with incisions. 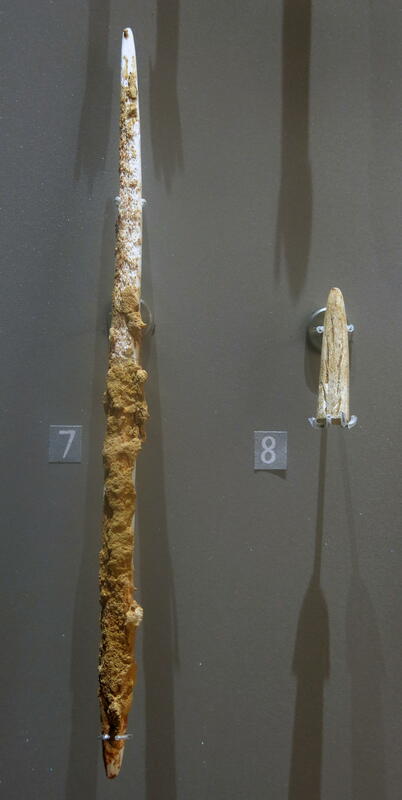 9 Fragment of the middle of a spear point. 10 Fragment of a spear point. 11 End of a spear. 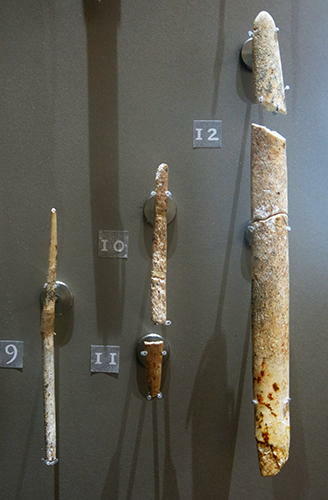 Spearheads found during the excavations by Henri Breuil and Severin Blanc, 1947-49, featuring cruciform incisions or convergent nested elements. 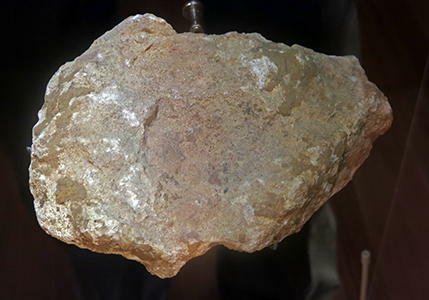 13 Fragment of a lamp. 14 Shell used as jewellery. 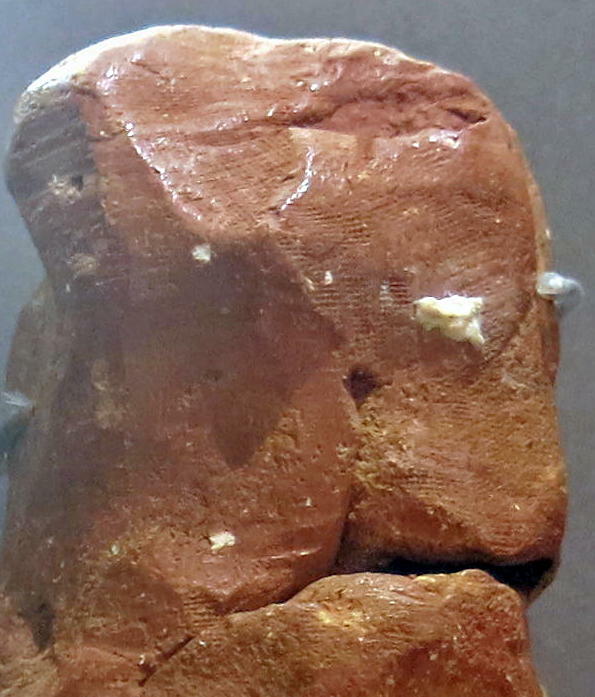 The top two pieces of clay have clearly visible marks that appear to be from textiles. On this small ball shaped piece of clay can be seen regular marks which are similar to those made by the imprint of textiles. This clay object has many imprints of what appear to be two quite distinct pieces of cloth, one with pronounced ridges (horizontal in this image) from either the warp or the weft, and the other with warp and weft more or less equally prominent. I have been unable to find any mention of this evidence for textiles in the scientific literature. 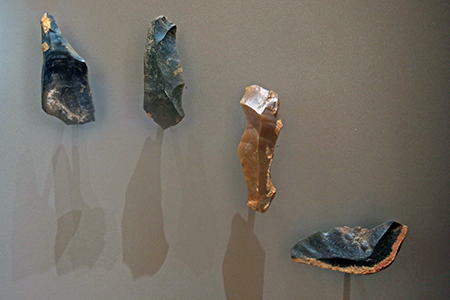 These flint flakes and tools found in Lascaux cave have wear marks consistent with their use for making engravings on the walls. These minimalist lamps are of the open-circuit type. They would have been picked up, used, and then discarded, without any thought being given to them. 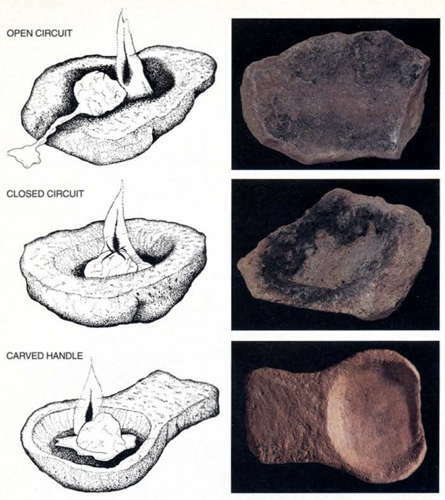 Open-circuit lamps (top) consist of largely unaltered slabs of rock. When the lamp is lit, melted fat runs off through natural crevices in the rock. Closed-circuit lamps (middle) have carved depressions to contain the runoff. 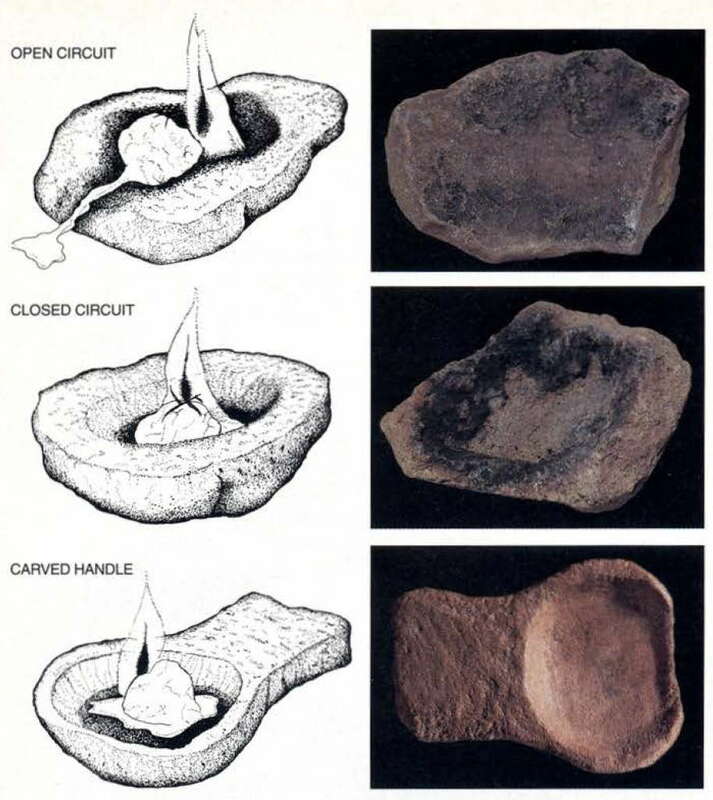 Carved-handle, closed-circuit lamps (bottom) also have bowls shaped fuel chambers but are more finely finished and have formed extensions for easier handling. Burn marks indicate that the wick was placed away from the handle. Vegetation map of Lascaux I. 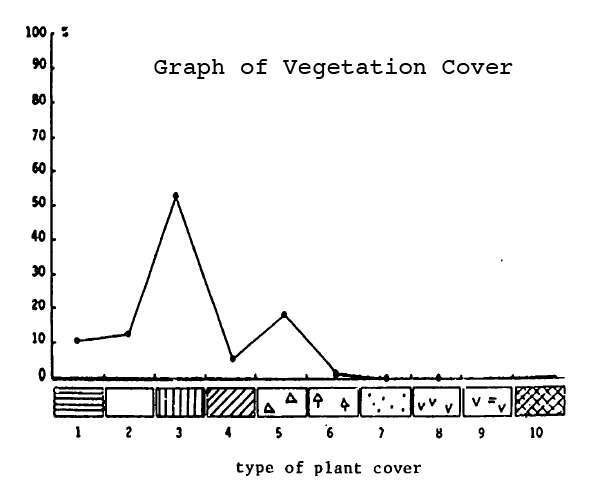 More detailed map of vegetation closer to the cave entrance at Lascaux I.
Graph of the relative abundance of species of vegetation around Lascaux I. 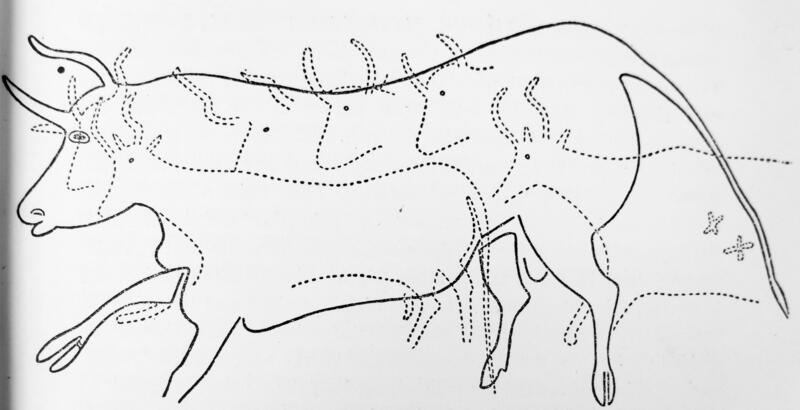 From 1952 to 1962, Father André Glory undertook a survey of the painted figures and engravings of Lascaux, located beyond the room of the Bulls. Very friable rock in places prohibited affixing the translucent paper directly on the wall. He got around the problem by using transparent media, namely a cellulose film, kept a few centimeters from the images. In 1955, at Bara-Bahau, he used a similar procedure: 'with the help of two assistants who held a large plate of semi-rigid plexiglass a few centimetres from the figures I was able to trace the figures onto the plate. The separate drawings were then reassembled from the partial drawings.' (Glory, 1955). 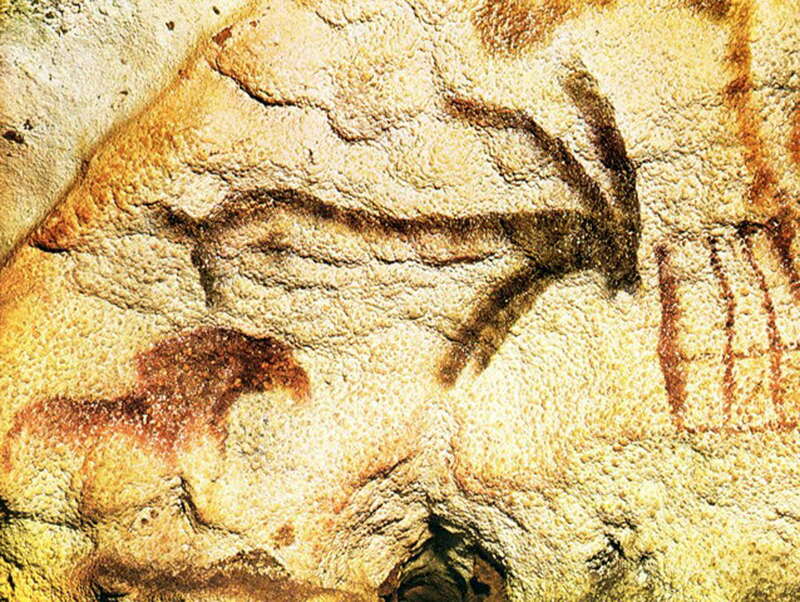 Discovered by accident in September 1940 by four teenagers, Lascaux Cave has become a reference that has shaken the international perception of cave art, and more generally, the symbolic behavior of prehistoric people. Since its opening to visitors, the public flocked to enjoy this collection of unique wall art and visitor numbers increased exponentially , reach the dizzying number of 100 000 visitors in 1960. Because of the climatic and biological changes to the cave, the Minister of Cultural Affairs closed the cave to the public in 1963, when it was still in private hands. The art was being degraded by 'green sickness' and 'white sickness', fungal or bacterial infections which was first noted in the early 1960s. It was decided to identify the problems and provide effective solutions, and to identify the conservation efforts which would preserve the climate of the cave and avoid damaging microbiological activity. Although the system was in balance until the late 1990s, the nevertheless fragile environment was degraded shortly after the installation of an airconditioning system which was supposed to rectify matters. The measures taken from the year 2000 on to stem the crisis have resulted in a state of conservation of relative stability. Although the parameters which affect the state of the paintings have not all been identified, the knowledge of the main factors affecting the cave has greatly increased in the last ten years. Research programs undertaken since February 15, 2010 will promote our understanding of this The measures taken in the years 2000 to stem the crisis have resulted today in a state of conservation of relative stability. If the various phenomena of interest to the cave have not yet found all the explanations, our knowledge of the operating mechanisms of the cave has significantly enriched in 10 years. Research programs underway and those to be initiated by the new Scientific Council established February 15, 2010, will promote our understanding of this remarkable cave. As was the case for several years, access to the cave for the past year has been strictly controlled and even more limited in order not to exceed the number of hours considered acceptable based on current climate studies. Thus, in 2010, the amount of time has been set at 590 man-hours in the decorated part of the cave and 253 man-hours in the vestibule, specifically the technical parts that of the airlock and the engine room. In comparison, the human presence in 2009 was of 705 man-hours in the decorated part of the cave and 147 man-hours in the vestibule. 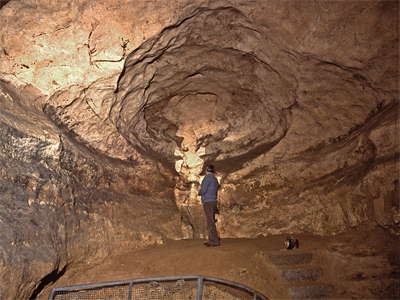 The reduction of the time spent in the decorated part of the cave was possible due to the relative stability of the cave of a microbiological point of view. The increase in time spent in the vestibule is explained in turn by the need for maintenance of the technical installations which control the temperature, humidity and airflow in the cave system. In addition, the access protocol to the cave, already strict, has been further strengthened. Thus, a new document setting out the practical arrangements for entry and exit of the cave was approved, and this was complemented by a computerised registration system installed in the door of the complex, which automatically records the number of hours spent, and all movements into and out of the cave, to the minute. This allows for a computerised management of human presence in the cave, and allows its strict control. There has been no biocide treatment of the Lascaux Cave since January 2008. Conservators responsible for monitoring the events in the cave and site personnel have continued their work of observation, particularly in sensitive areas to assess any changes or modifications. Each procedure begins with a review of the area and continues with an overview of the contamination on the decorated areas. These observations are intended to establish the level of general contamination of the cave and to identify areas that may, under archaeological supervision when the procedure is safe for the paintings and engravings, allow manual removal of microorganisms as necessary. Thus, after approval of the curator of the cave and the director of scientific research, mould was removed on the lower wall, but only on undecorated areas was conducted, with brushes of different sizes and hardness, and used in the manner of surgical instruments. At the same time that this was done, residual organic deposits were removed by a special machine (a Gregomatic) from the undecorated areas. 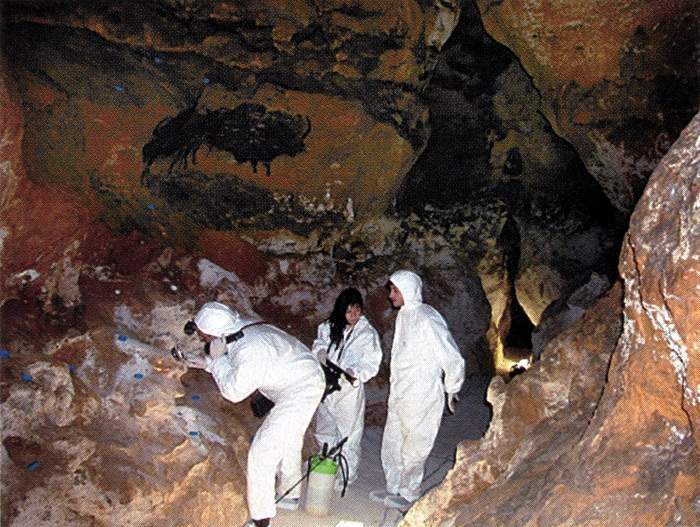 Throughout 2010, the overall level of contamination of the cave remained relatively stable and restorers responsible for monitoring the health of the cave did not observe significant variations in the location of contaminated areas. 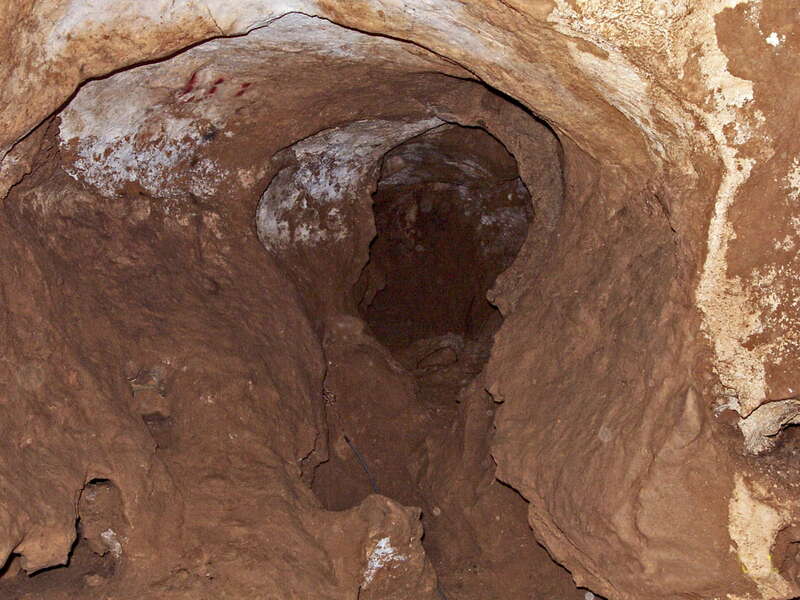 Contamination of the cave by the white sickness remained very low throughout the year. These small occurrences of very fine white tufts tended to decrease in size and thickness in 2010. 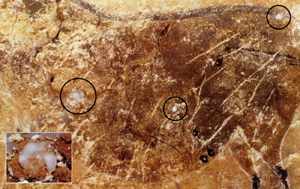 The phenomenon is almost non-existent on all the walls of the Hall of the Bulls and the Axial Gallery and disappearances of the white patches were recorded in areas where the contamination had persisted for years. After the disappearance, in 2009, of the contamination in the figures on the Panel of the Chinese Horses, a gradual decrease in white colonies until their disappearance was found on the panel of the bears in May 2010. 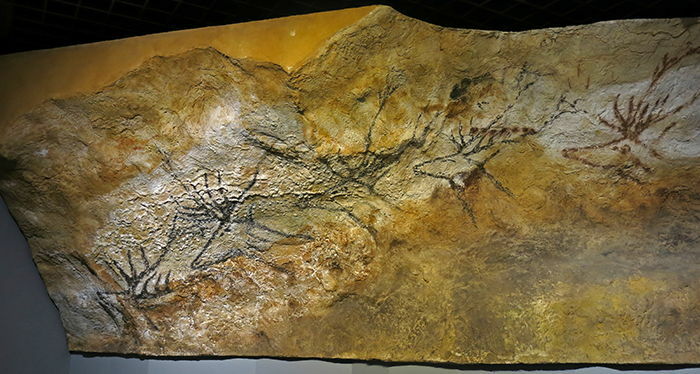 This regression of the contamination was also observed in the Nave at the frieze and the Ibex Panel Imprint, with as well the absence of mycelium visible on the frieze of swimming deer. 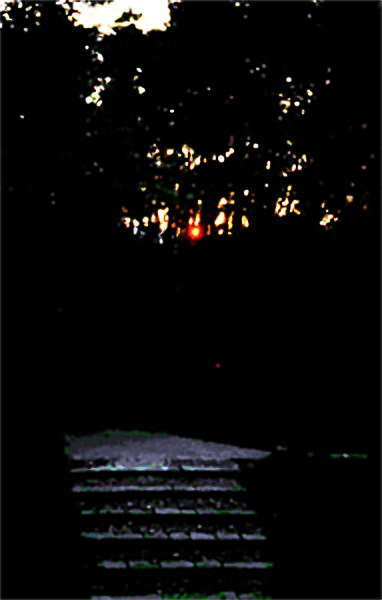 Only the roof of the passage remains a sensitive area with, however, between April and November 2010 a number of disappearances of the white down more common than new appearances. 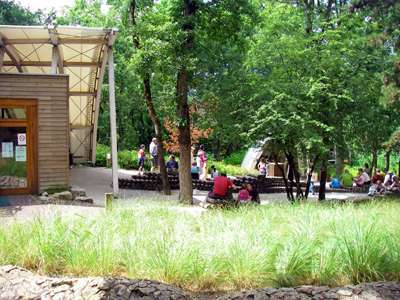 The rehabilitation of the original site of Lascaux would be most effectively done by reducing the influx of tourists to the site of Lascaux. 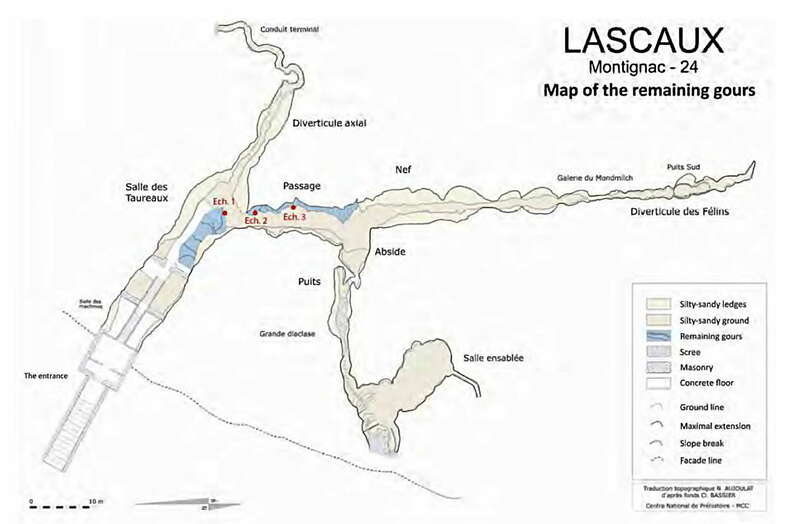 The infrastructure of Lascaux II and the 300 000 tourists per year that the site attracts is one of the most important problems that the original site of Lascaux faces. This could be accomplished by moving the parking area as far away as possible from the original site. 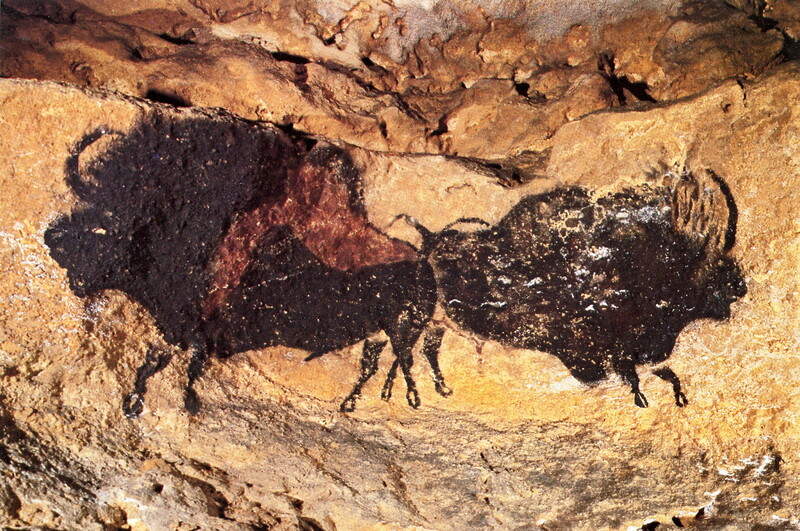 This can be accomplished by setting up another version of Lascaux further away from Lascaux I and II. Land has been acquired for this purpose. 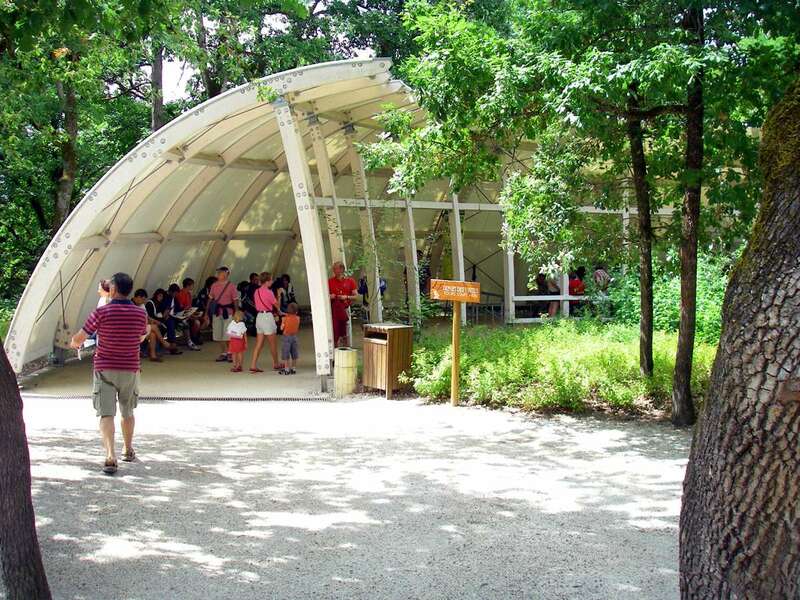 A museum visitor center attached to a new facsimile of the entire cavity, a most comprehensive project, will be built at the foot of the hill, which will then be revegetated. This project, called Lascaux IV, was launched in early 2011. 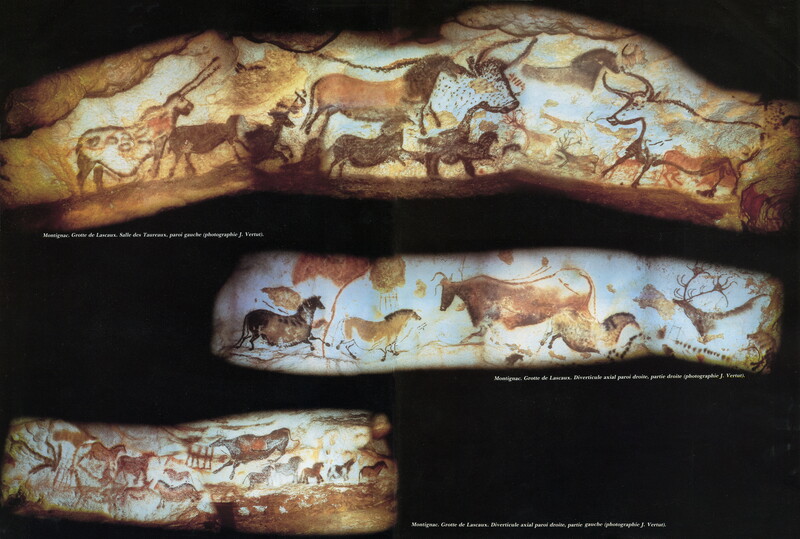 In preparation for this, a travelling international exhibition (as seen at Lascaux révélé above - Don) with five panels of the Lascaux Cave, Vache Noire, Panneau de l’Empreinte, Bisons adossés, Frise des Cerfs nageant, Scène du Puits, currently visible at le Thot, called Lascaux révélé, will be the heart of the exhibition. The travelling exhibition will be taken around the world over a two year period. 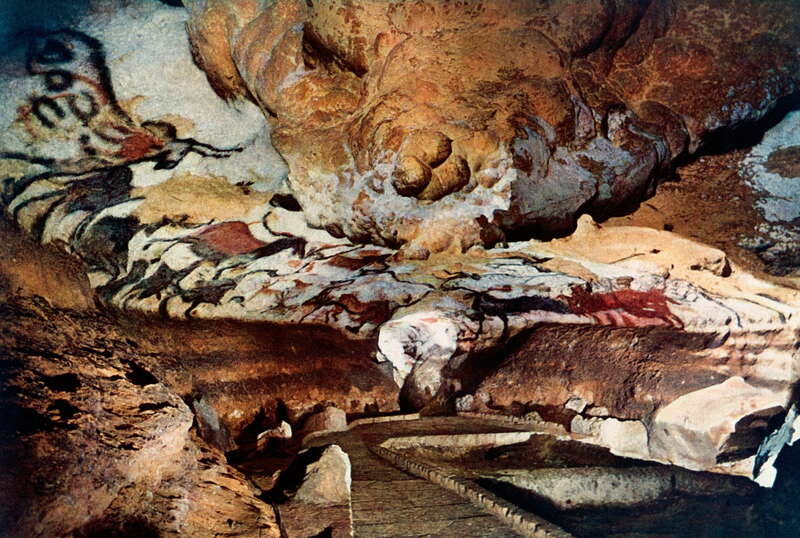 Entrance to the Lascaux Cave at the end of September, 1940. From left to right: Leon Laval (teacher), Marcel Ravidat, Jacques Marsal (the two discoverers) and Henri Breuil. 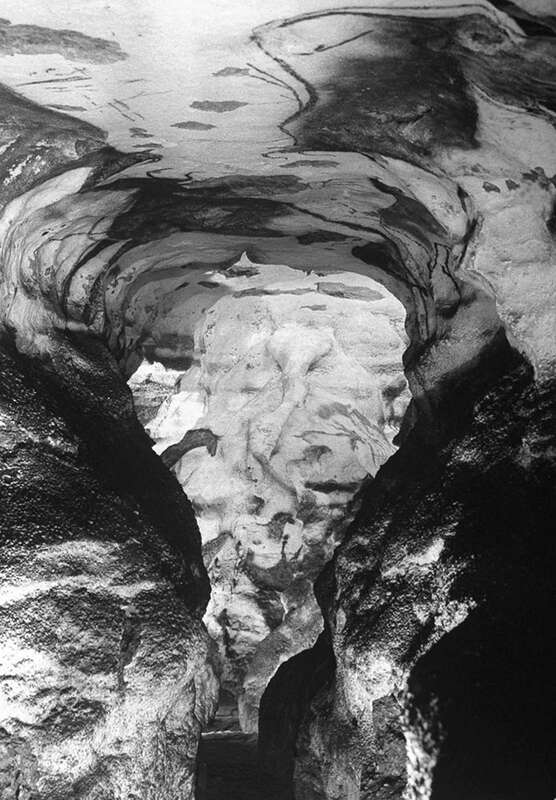 Successive alterations would bring about an important widening of the entrance, enlarging it from the sub-vertical shaft through which the discoverers had entered the cave for the first time, to the entire breadth of the gallery. Visit to the Hall of the Bull by Count Bégouën, (centre, arm extended) and Abbé Breuil on 24 October, 1940. Sitting in front of them the Lascaux discoverers Jacques Marsal, left, profile, and Marcel Ravidat, right. Work was in progress to lower and even out the ground surface in the cave to facilitate visitor access. 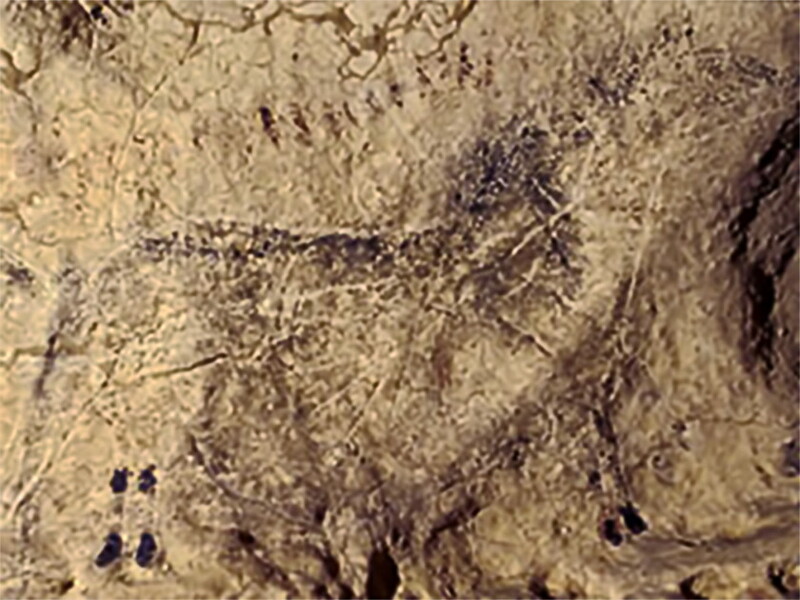 Lascaux would have escaped history and its indignities if four boys rambling on a hillside just east of the Vézère River in southwestern France in 1940 hadn't decided to investigate an opening revealed by a fallen tree. 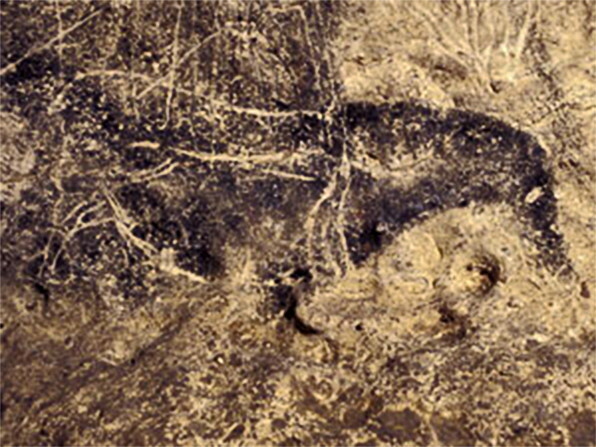 Soon Abbé Henri Breuil, a pioneer in the study of Paleolithic cave art who had been examining cave paintings in southern France and northern Spain for almost 40 years, arrived to inspect their extraordinary find. 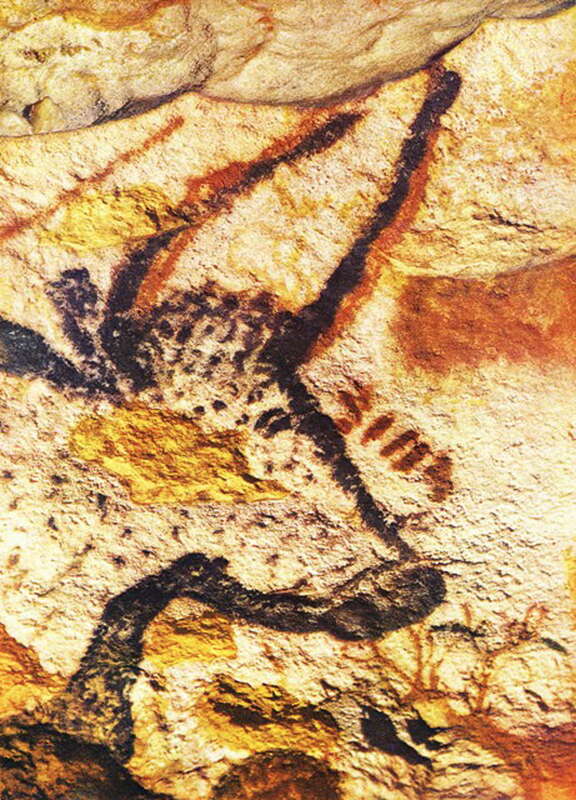 He theorised that Lascaux's broad galleries of compositions suggested a magical or religious function for the drawings; Lascaux became known as the "Sistine Chapel of prehistory" and people clamored to see it. 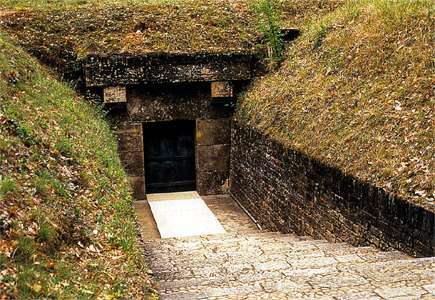 After the war the La Rochefoucauld family, which owned the property, authorised work to enlarge the entrance, shunt off the water that had once cascaded through the cave, and install steps and concrete flooring through much of the underground complex. 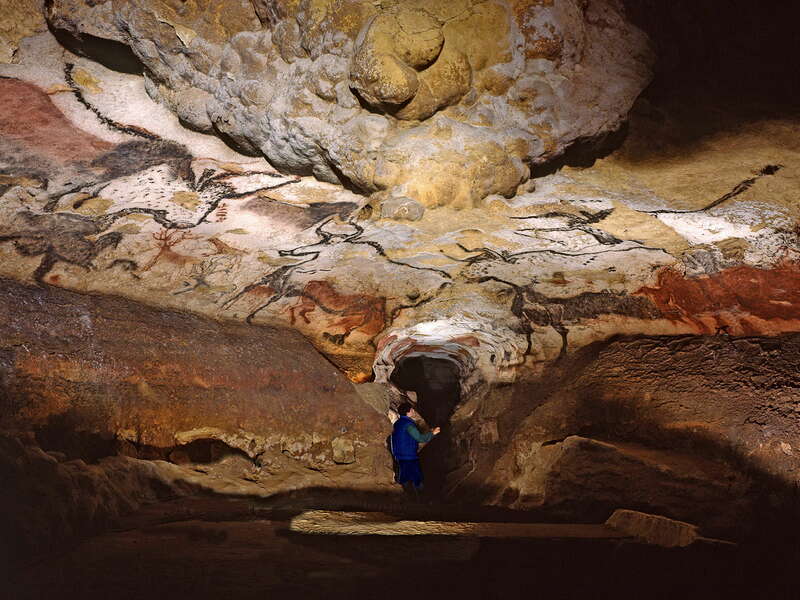 As many as 1 700 visitors traipsed through Lascaux every day, but by the late 1950s, the presence of so many carbon dioxide-exhaling, warm-blooded bodies had altered the cave's climate to the point where calcite deposits and lichen were threatening the paintings. 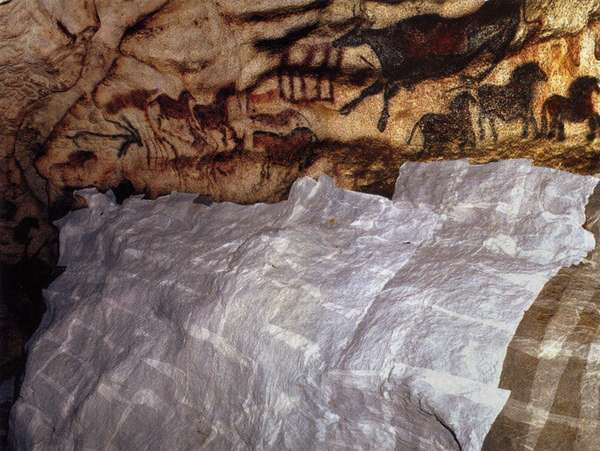 "There's been a tradition of intervention at Lascaux from the very beginning" says Frangois Bourges, an independent hydrogeologist and expert on France's eaves. South by 230 km, the D'Audoubert and Grotte des Trois Frères, caves of a similar vintage and impact as Lascaux, have never been open to the public. Count Robert Bégouën, whose father and uncles found the eaves on the family's Pyrenean estate in the years just before World War I, continues a family tradition that decrees no one enters either cave without a Bégouën at their side. Not even Jean Clottes, who wrote an extensive monograph on Tuc, was allowed to venture off a narrow path along the center of the cave. "My grandfather said that a cave opened to the public is lost to science:' says Bégouën. "Since nature conserved it for 17 000 years, we do absolutely nothing: no new plantings on the surface, no sealing it off with doors, and for each generation, just one chief responsible for studies and conservation. 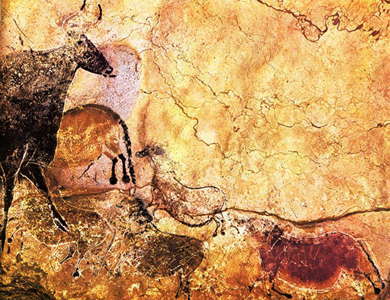 Everything we did is the opposite of Lascaux." After the cave opened to the public in 1940, up to 1 700 visitors traipsed through each day. The era and the circumstances of Lascaux's discovery prevented such a pristine approach. After the war, France - and the community of Montignac - needed a boost, and as a phenomenal tourist attraction, Lascaux was there to provide one. Moreover, Breuil, unlike his friend Bégouën, believed that the wonders of Lascaux ought to be shared as an educational experience with as many people as possible. But by 1963, the threat of permanent damage had grown so acute that André Malraux, France's first and most famous Minister of Culture, ordered the cave closed. 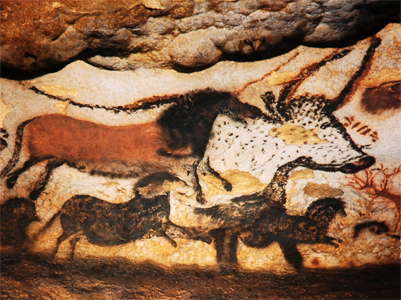 That courageous decision ushered in an era of innovative study of the world's most iconic painted cave. 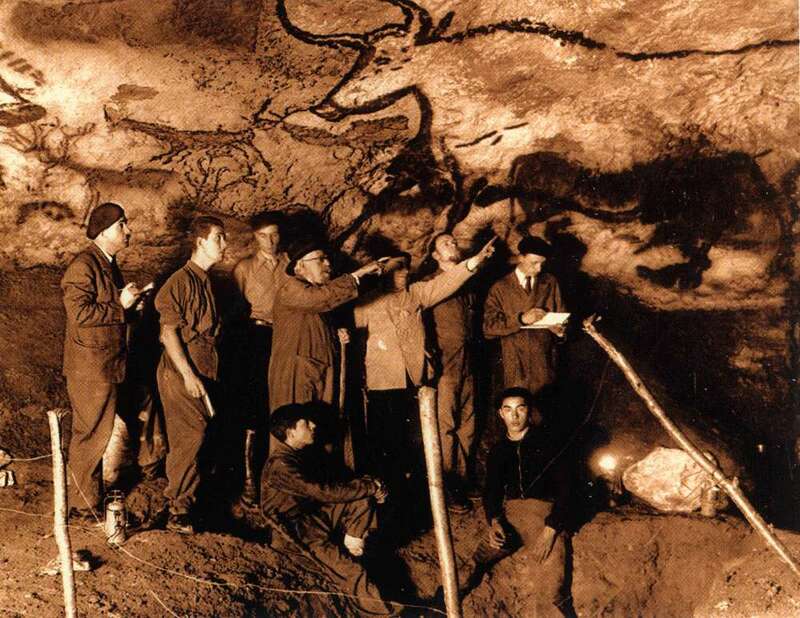 A team led by Paul-Marie Guyon, a young physical chemist, and including Jacques Marsal, one of the boys who discovered Lascaux and who grew up to become its guardian and most practical connoisseur, worked to model the air flows and monitor the carbon dioxide content and temperature in the cave. 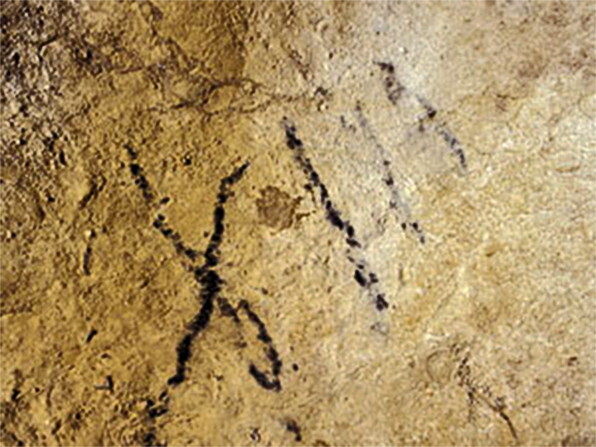 At the same time, the meaning of the prehistoric cave paintings, like those discovered earlier in southern France and northern Spain, became a topic of fertile interdisciplinary discussion. 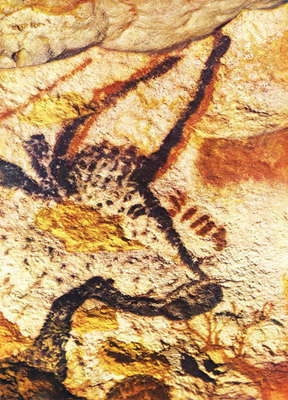 Some saw in these beasts primary evidence that from the beginning art was wrought for the sake of art. Others contended that the images were purely utilitarian, drawn solely to marshal magic that would help hunters succeed. 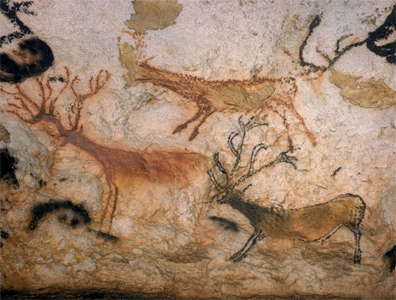 Yet archaeological evidence is strong that while humans were painting in Lascaux, they could count for sustenance on massive herds of reindeer, an animal that is only rarely depicted. By the beginning of the 1970s, Lascaux had found a kind of stability. The crowds were gone, the lichens banished, and Marsal was in the cave almost every day, alert to even the slightest changes. 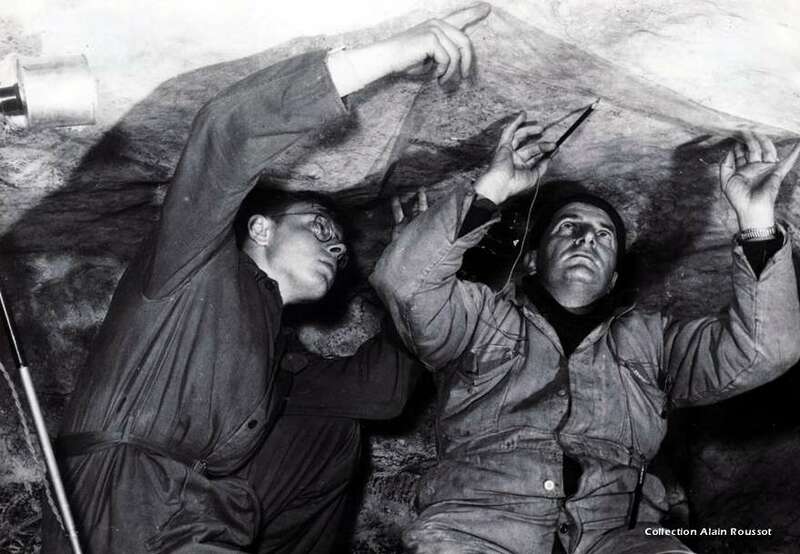 The studies of Guyon and others had determined that the cave could handle about five visitors a day for 35 minutes each, five days a week. With some variation, that protocol was never exceeded for the next 30 years. Since 1983, even the crowds were back, in manageable numbers, to visit Lascaux II, a facsimile that gives visitors an inkling of the cave paintings' power. And anyone determined and patient enough could successfully petition the authorities for permission to visit the real cave. The only precaution was to walk through a trough of formaldehyde solution - the regimen which Pallot-Frossard of the LRMH suggests may have inadvertently enabled the fusarium fungus to flourish. Pallot-Frossard contends that the fungus has not caused irreversible damage to the paintings, but others disagree. 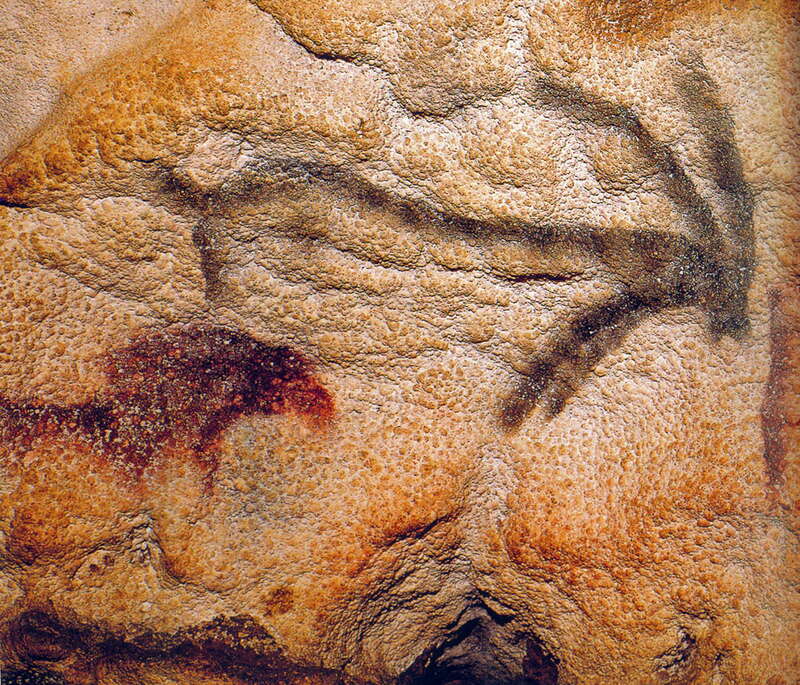 Laurence Léauté-Beasley, a Franco-American who led art tours into Lascaux from 1982 to 2001 and formed the International Committee for the Preservation of Lascaux in 2004, says one knowledgeable visitor to the cave last month not only saw fusarium on the paintings, but noticed a grayish tinge to formerly black surfaces where growths had been removed. And the treatment itself may have taken a toll. 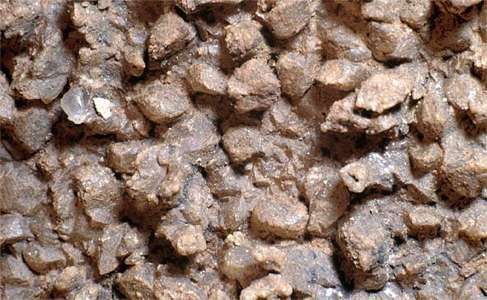 When the quicklime that did the most to bring the outbreak under control was removed from the cave over the course of last year, so too was what was left of the soil - with possible ramifications for the cave's climate and humidity. 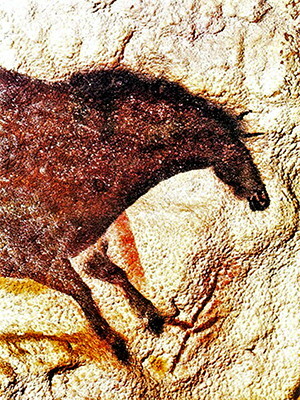 Desplat, the Lascaux caretaker who first discovered the outbreak, says that in the course of restoration work, a large stone flake painted with a horse's head that many millennia ago had fallen from the Great Hall of the Bulls - the first and most voluminous chamber of the cave - sustained three cracks; Geneste says the cracks aren't new. Some believe that a ridge around part of the Great Hall bears the marks of the restorers' ladders, and that the lower parts of the walls have been changed through the use of a Gregomatic, a kind of powerful waterbased vacuum cleaner. Pallot-Frossard has no regrets. "Theres nothing more complicated than a cave" she says. "We had to intervene fast and we did the best we could"
Nave. Development of white mycelium on a bench in 2001. What doesn't exist is an independent judgment of what went wrong at Lascaux and whether it is being put right. The committee the Ministry of Culture created to perform that task includes Oudin, the architect who installed the disastrous climate system; Geneste, the curator, who accepted the plans and oversaw the installation project; Pallot-Frossard, the lab director; and the responsible bureaucrats. How a committee so constituted can arrive at unbiased answers is "a good question" admits Marc Gauthier, an expert on the Gallo-Roman era and the committee's chairman. But he says it's working. "Too often we've reacted to the symptoms of the problern" he says. "But for the last three years we've been reflecting and acting on the reasons." Léauté-Beasley is unconvinced. "We feel that big mistakes have happened and may still be happening" she says. "The French are dealing with them like it's their backyard, but they need to feel accountable to the rest of the world. After all, who does the past belong to?" Axial Gallery. Compresses applied on white mycelium on a sloped surface. 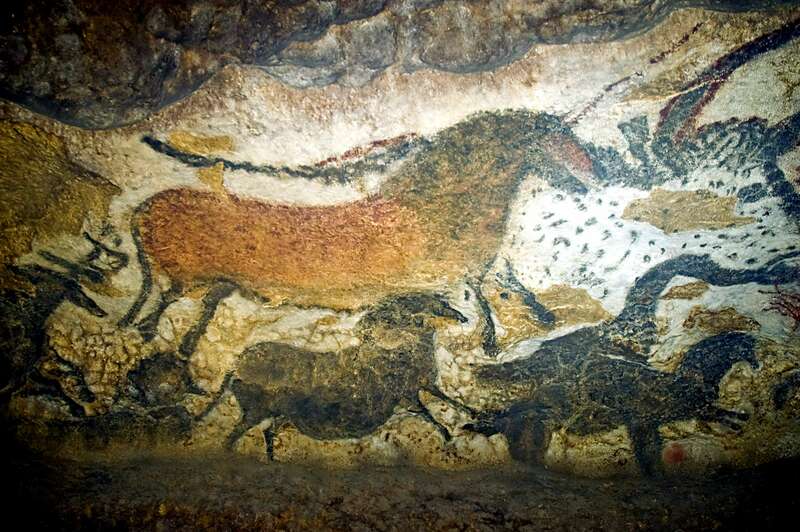 Lascaux's keepers are no longer using chemicals to eradicate fusarium from Lascaux: no more antibiotic patches or quicklime. But no one can be content that restorers still have to go in to pick fusarium filaments off irreplaceable paintings and run the Gregomatic on the lower walls. Geneste sees a few tiny insect colonies as evidence that a new ecological balance is slowly taking shape in the cave. "My goal is to reopen Lascaux in 2007," says Rieu, the regional director of conservation. "If the scientists' hopes are realized, that could happen, though for very restrained numbers of visitors." 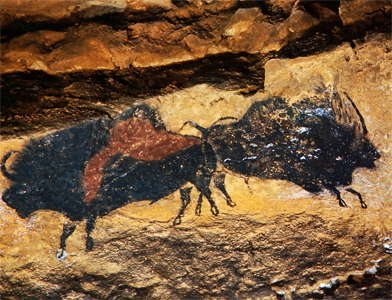 Business as usual may come as a relief to the ranks of bureaucrats taught a lesson in humility by Lascaux. Whether that lesson sticks will be determined by future generations. It will be a terrible indictment of this one if it does not. 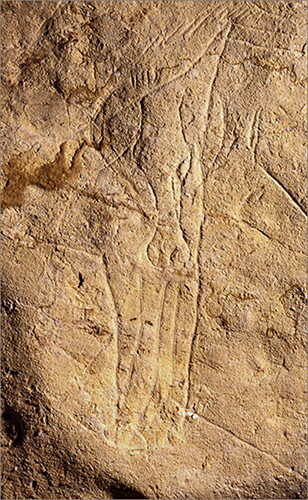 Aujoulat N., Perazio G., Faverge D., Peral F., 2005: Contribution de la saisie tridimensionnelle à l'étude de l'art pariétal et de son contexte physique, Bulletin de la Société préhistorique française. 2005, tome 102, N. 1. pp. 189-197. Beaune, S., White R., 1993: Ice Age Lamps Scientific American, March 1993. Delluc. B., Delluc. G., 1979: L' accés aux parois., In: Leroi-Gourhan, A. and Allain, J. (eds). 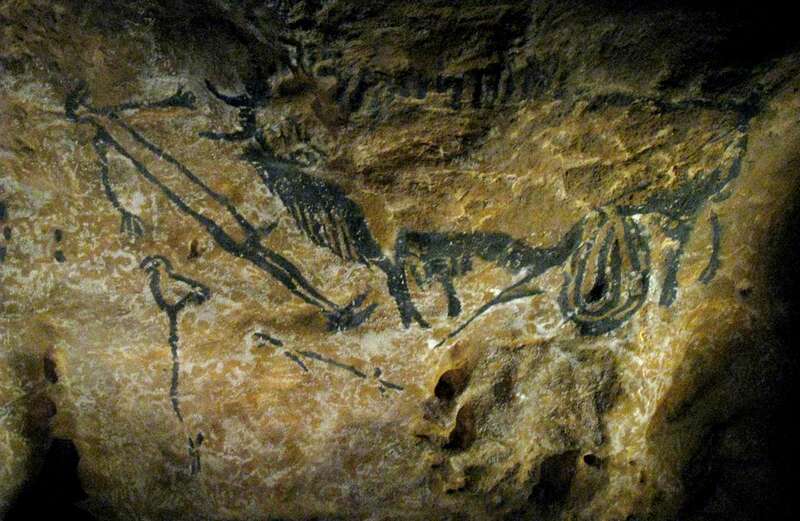 Lascaux Inconnu, pp. 175-184. Paris..
Genty D. et al. , 2011: Dating the Lascaux Cave Gour Formation Radiocarbon Vol 53, Nr 3, 2011, p 479–500 © 2011 by the Arizona Board of Regents on behalf of the University of Arizona. Glory A., Delluc B., Delluc G., 2008: Les recherches à Lascaux (1952–1963), Gallia Préhistoire XXXIX:201. 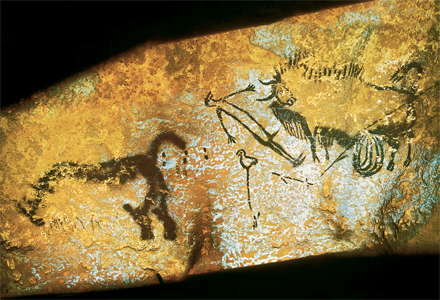 Glory, A., 1955: La caverne ornée de Bara-Bahau, l'an 40000 naissait l'Art, Le Bugue, 20 p.
Leroi-Gourhan, A., Allain J., 1979: Lascaux inconnu, Centre National de la Recherche Scientifique, 1979, 381 p.